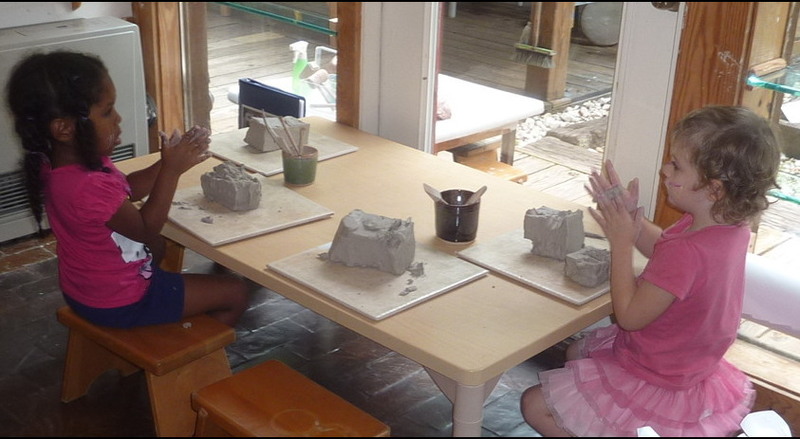 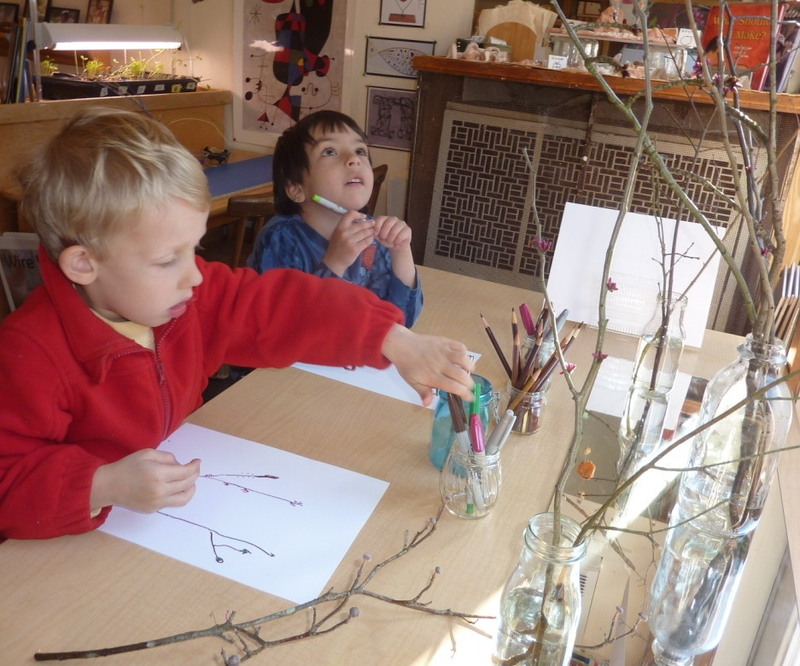 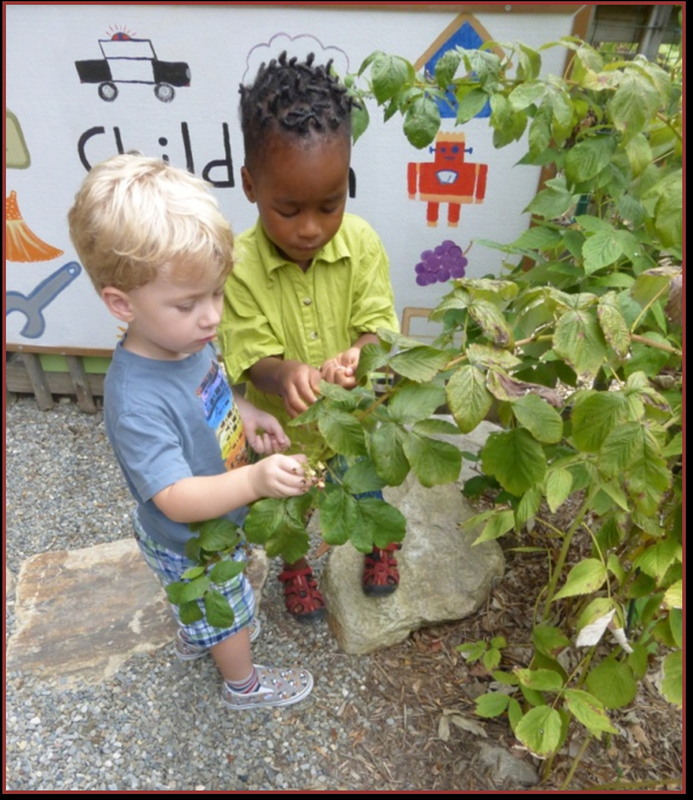 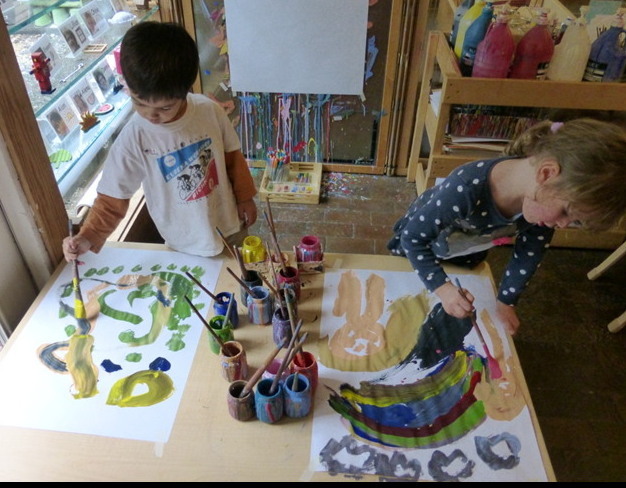 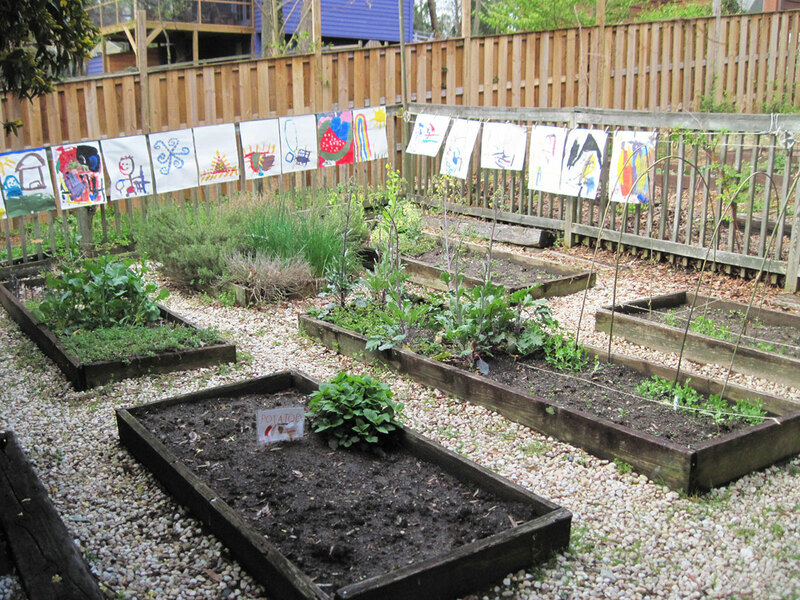 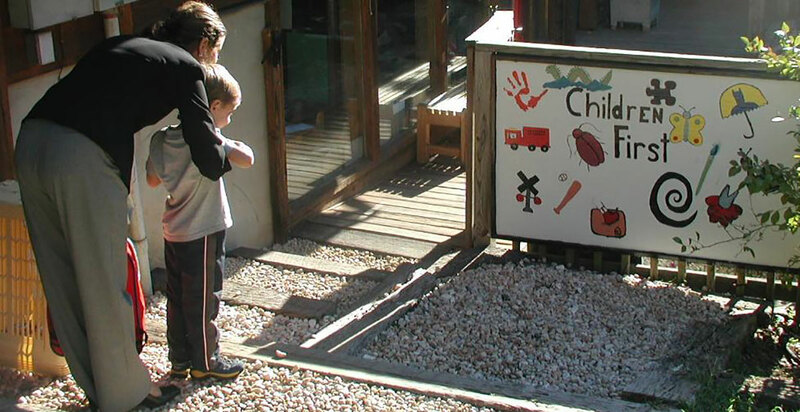 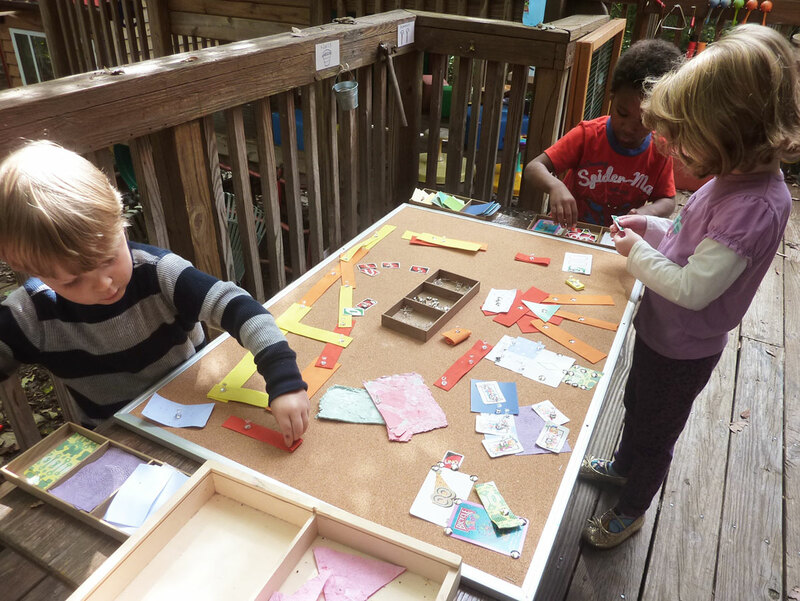 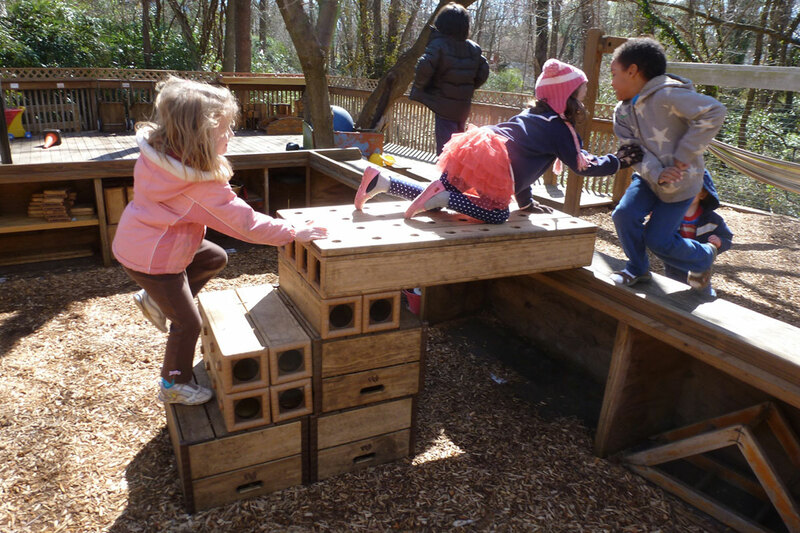 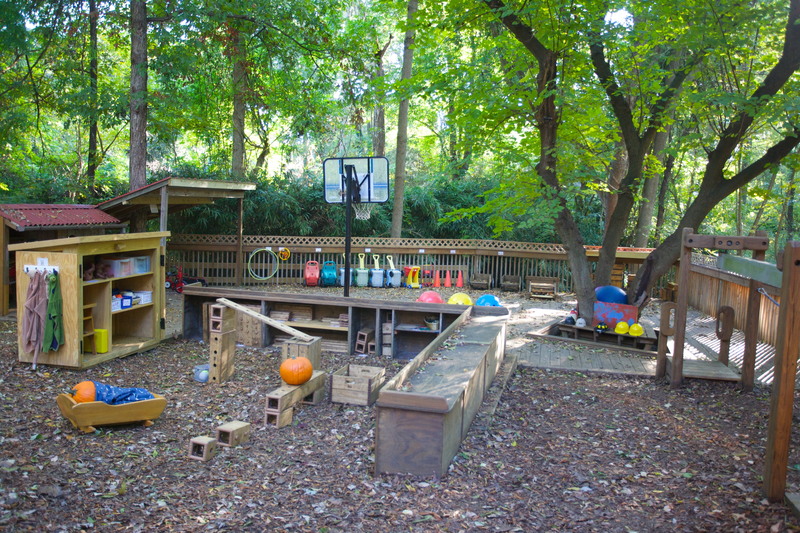 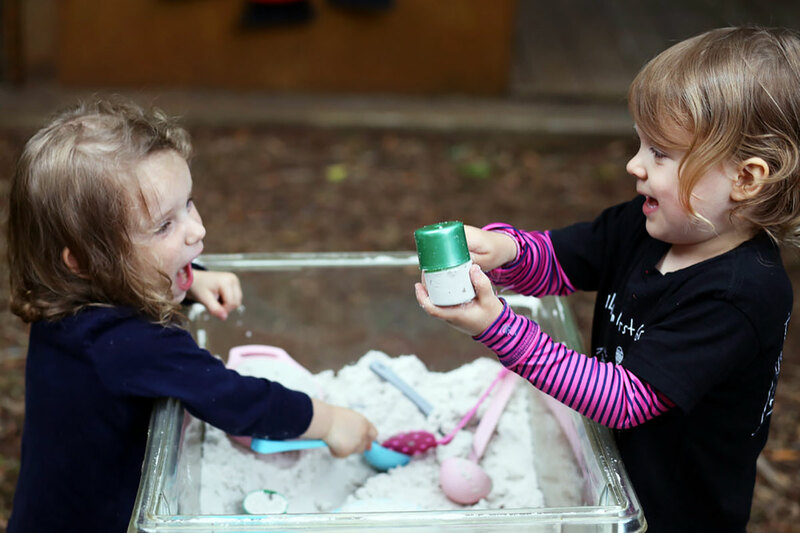 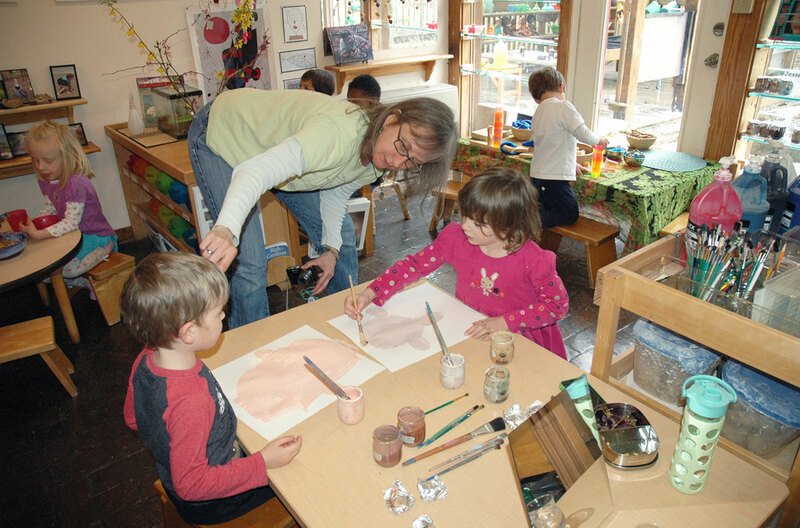 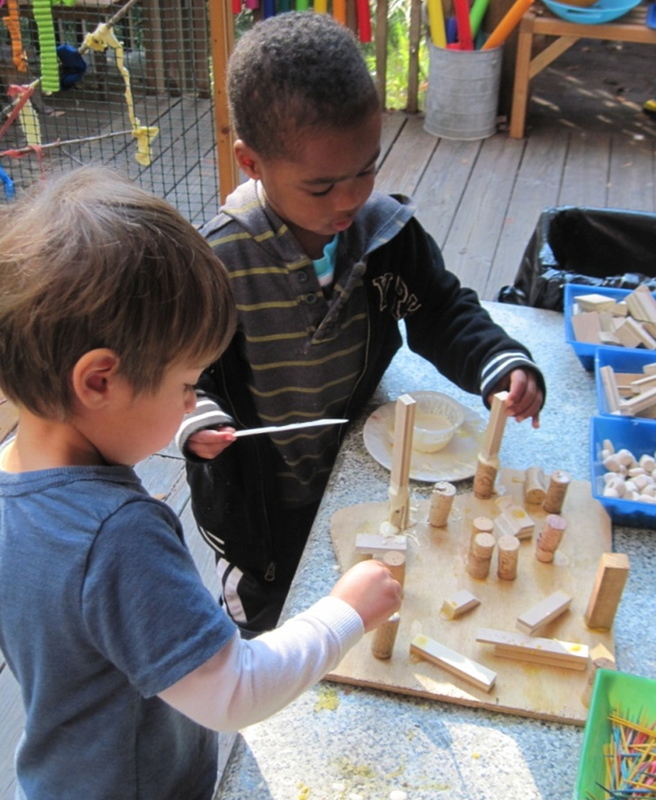 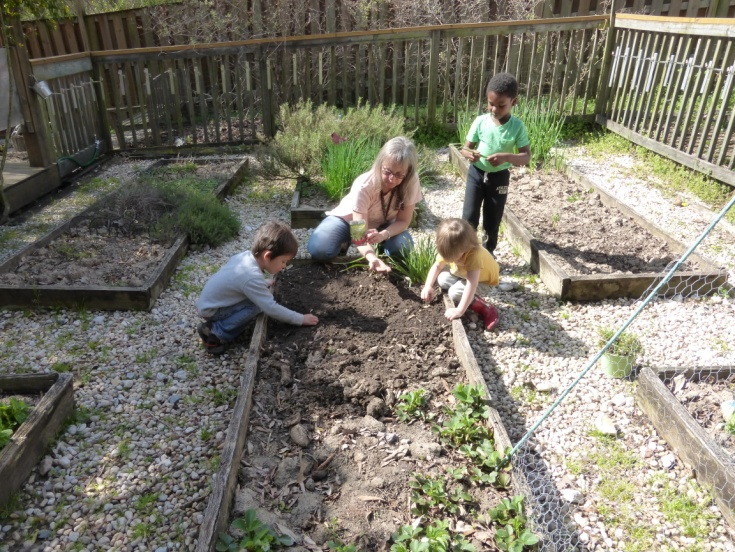 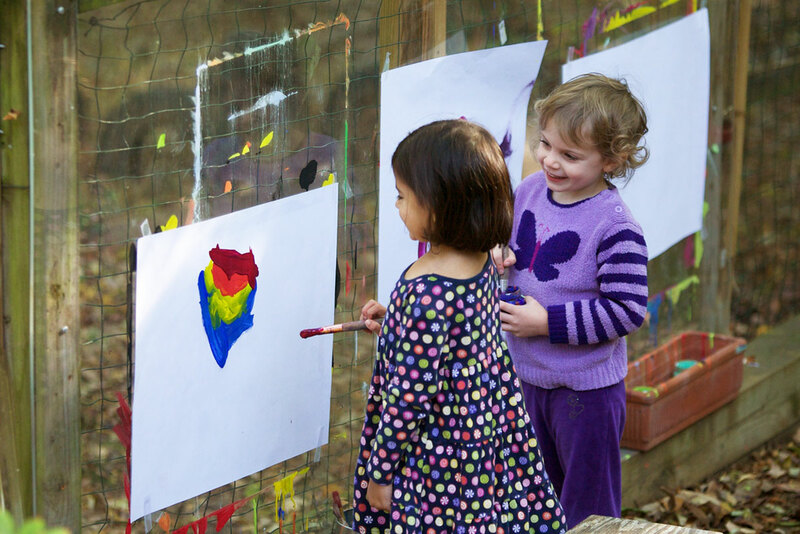 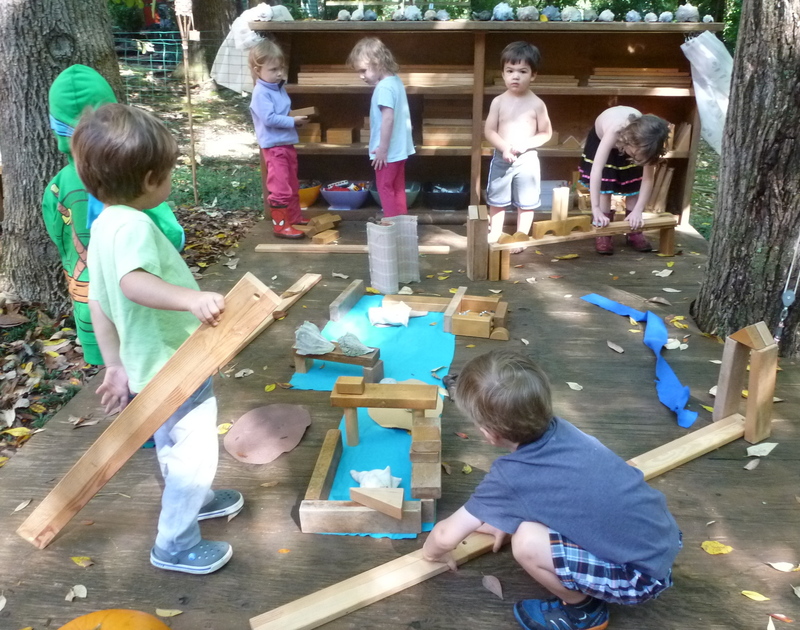 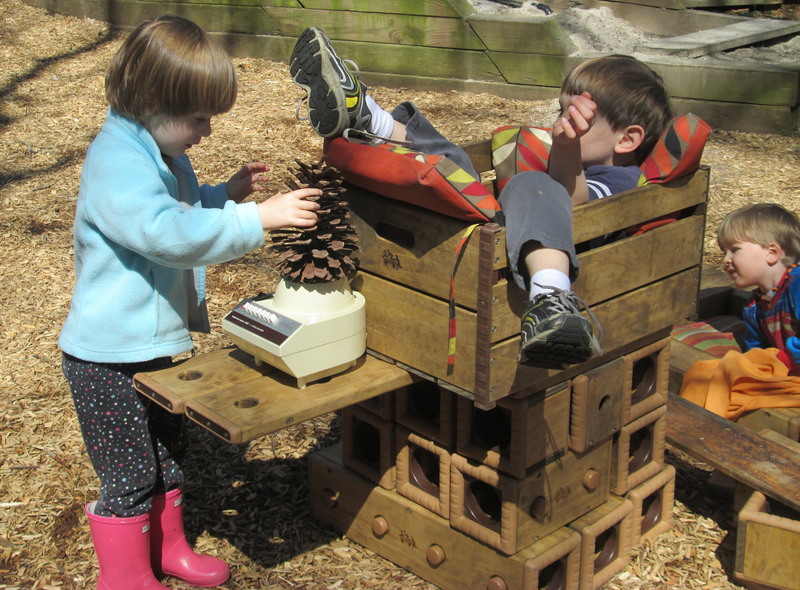 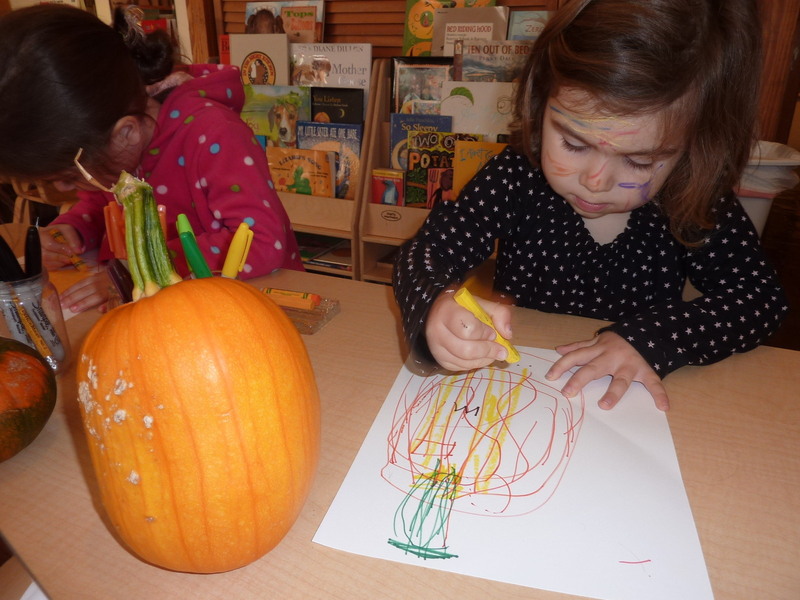 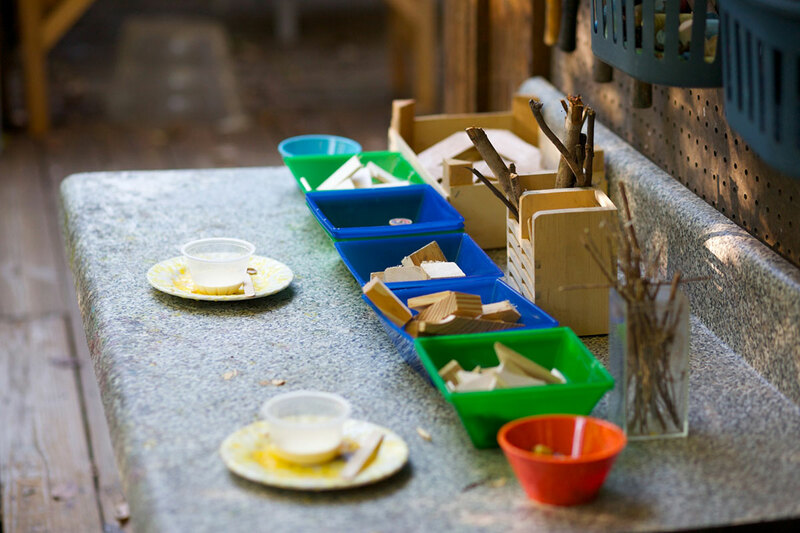 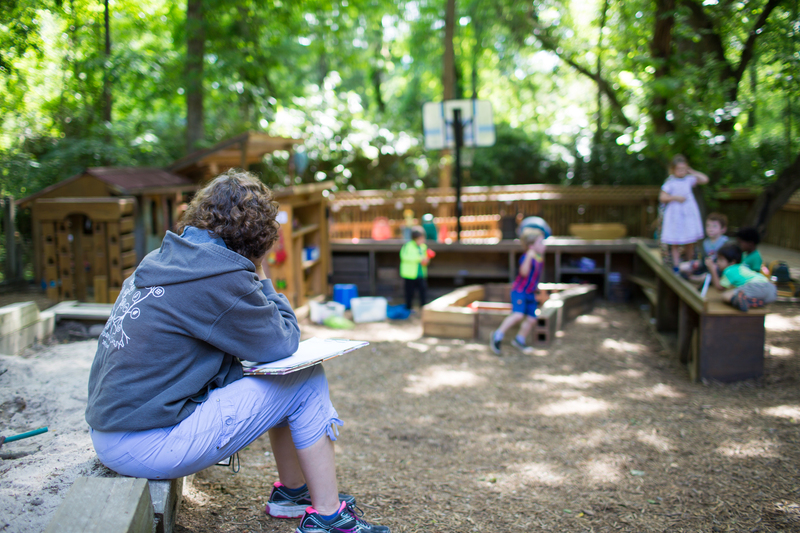 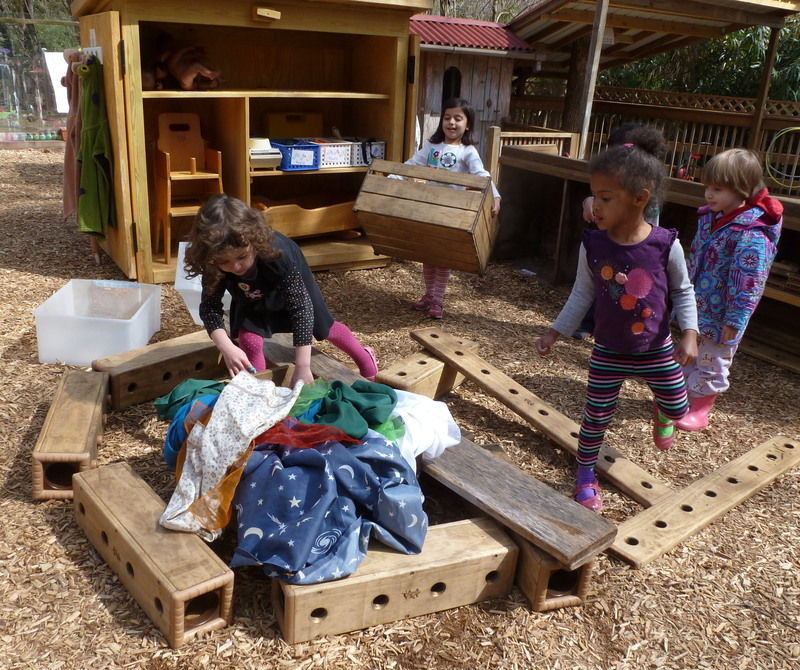 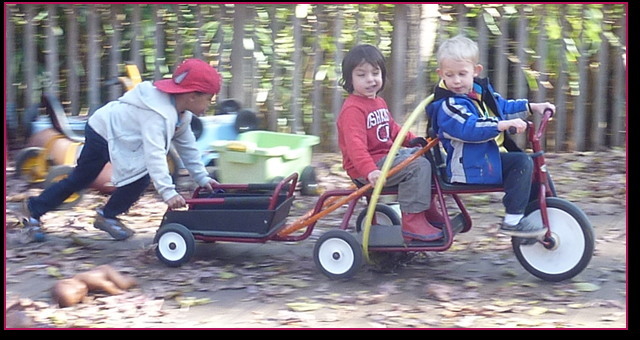 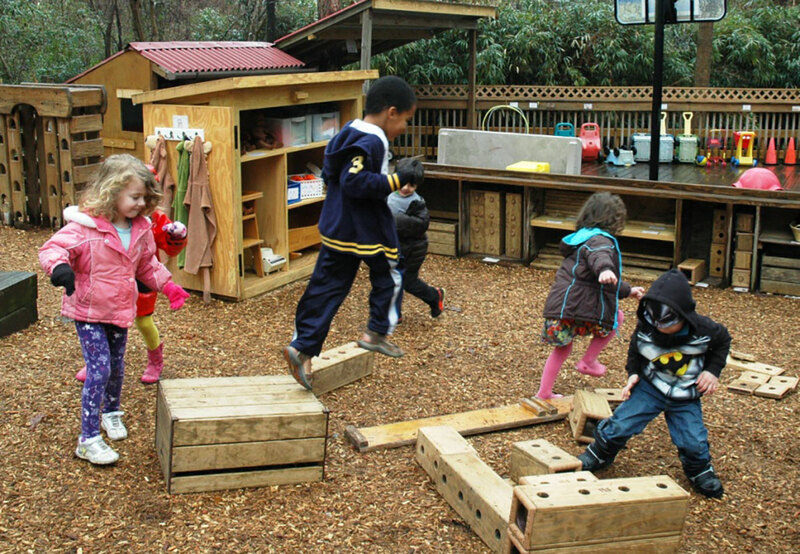 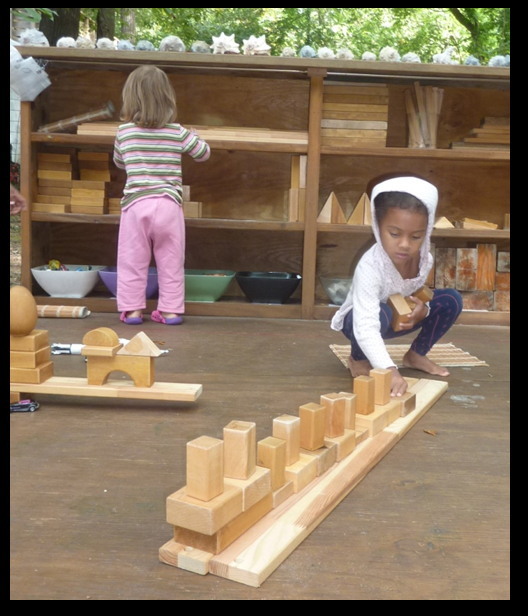 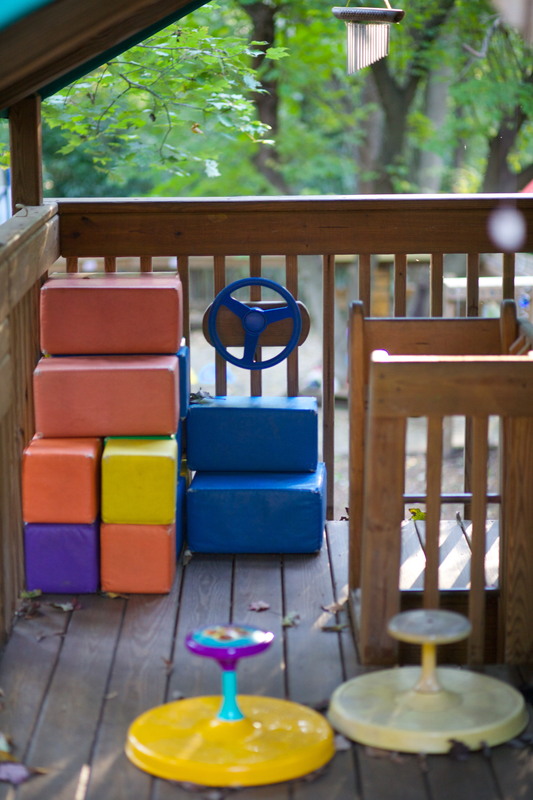 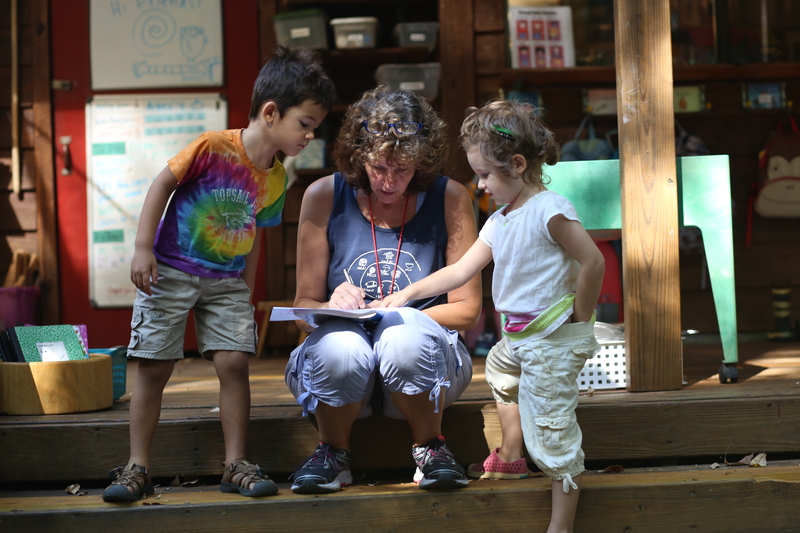 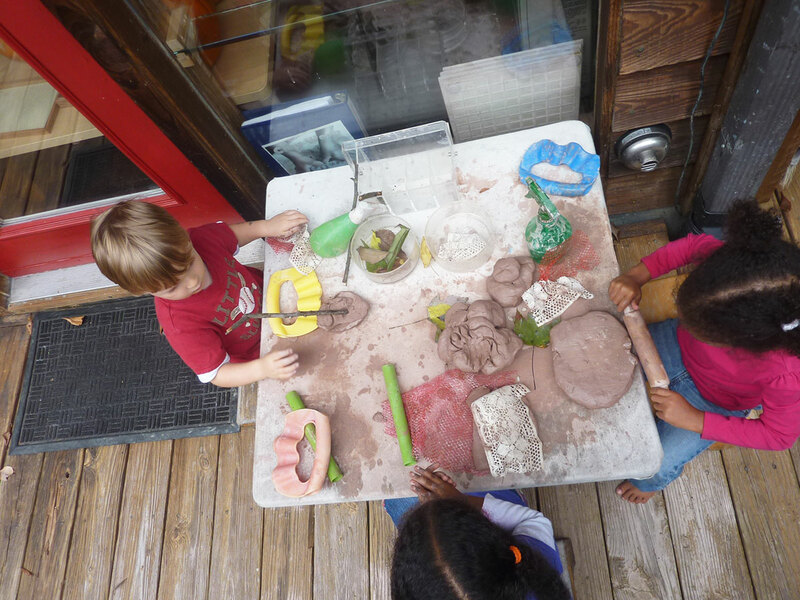 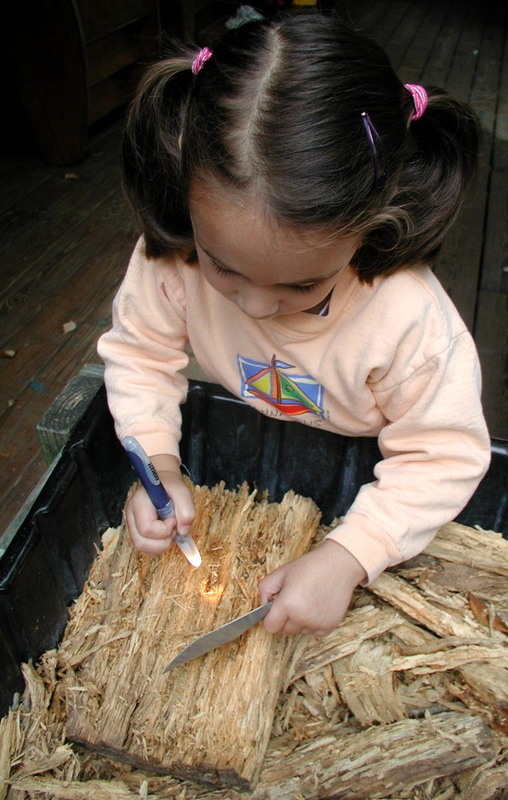 We agree with educators from Reggio Emilia, who consider the learning environment a “third teacher.” As a result, we invest considerable resources to develop, maintain and continually improve the indoor and outdoor spaces where Children Firsters work and play. 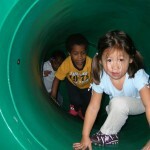 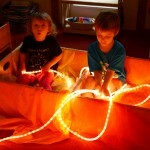 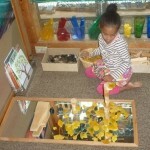 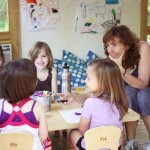 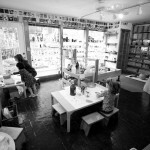 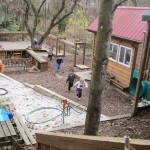 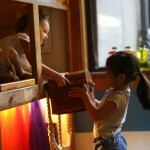 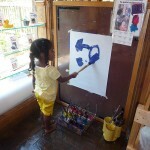 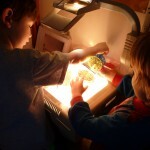 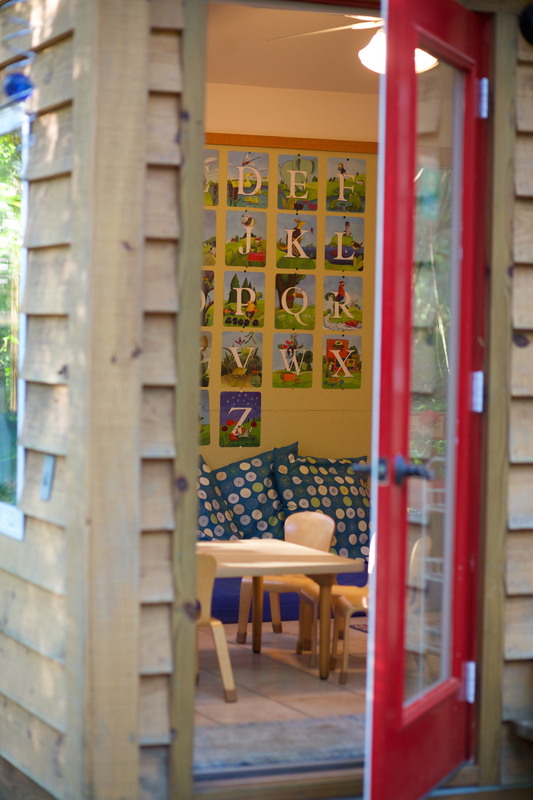 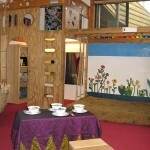 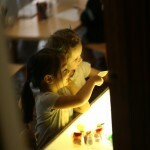 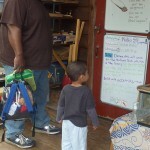 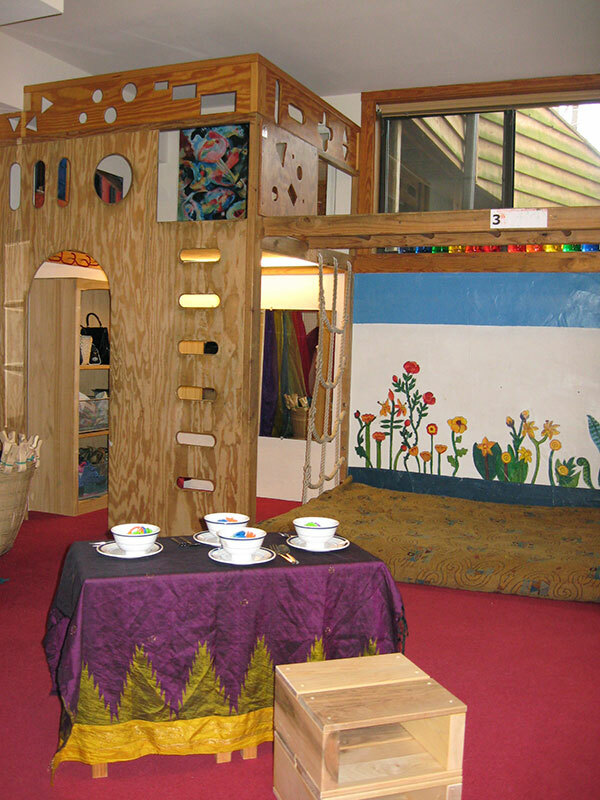 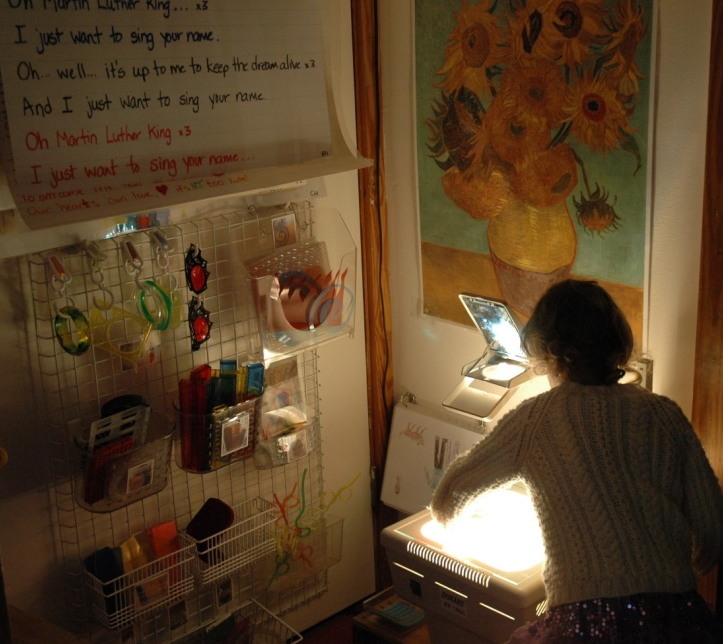 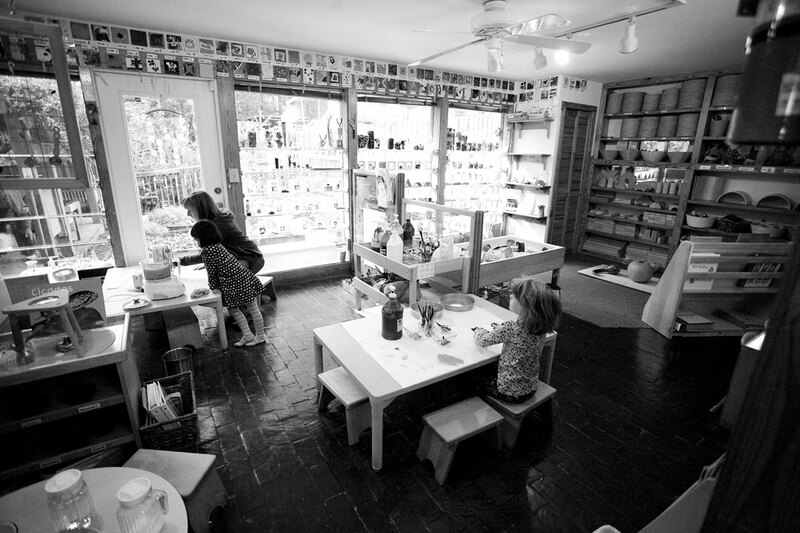 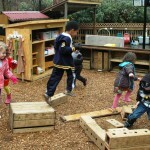 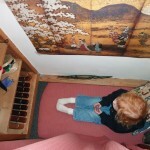 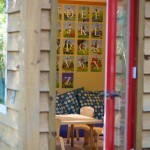 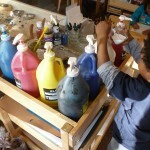 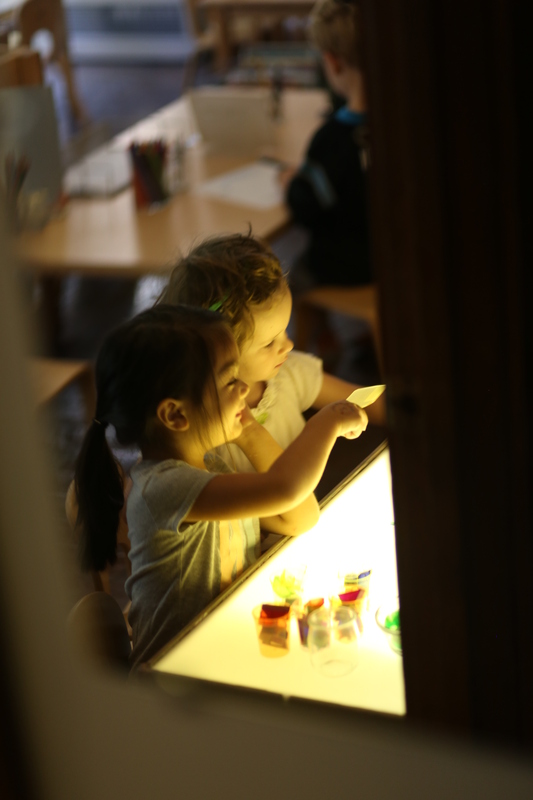 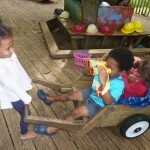 Children move freely throughout those spaces during their hours here, so we try to make sure that every nook and cranny they encounter has something valuable to offer– a sensory delight, an invitation to experiment, an opportunity to create, a puzzle to unravel, an image or idea to contemplate. 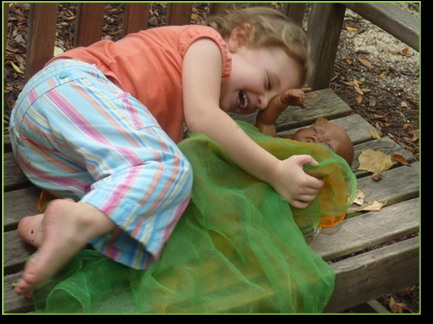 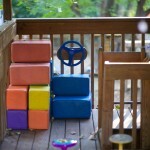 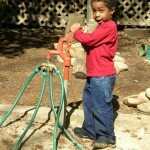 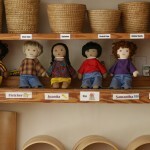 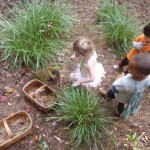 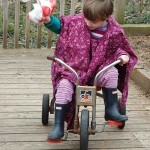 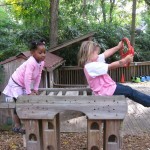 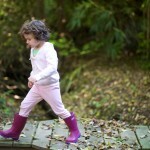 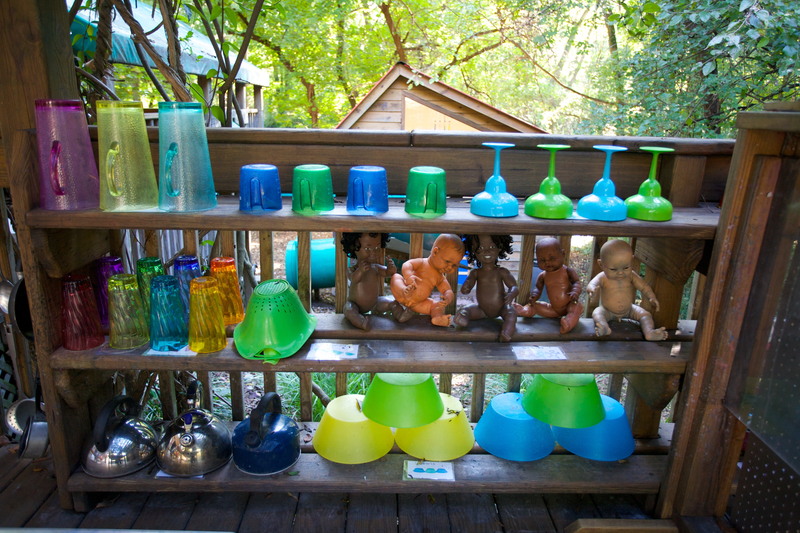 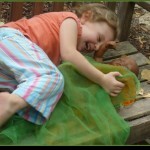 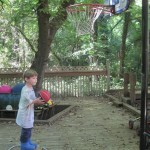 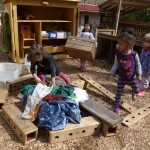 When we make decisions about what to offer children, we make an important distinction between materials and playthings. 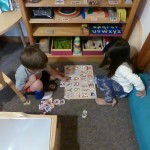 Playthings entertain, amuse, and teach particular concepts (alphabet letters, colors, counting, etc.) 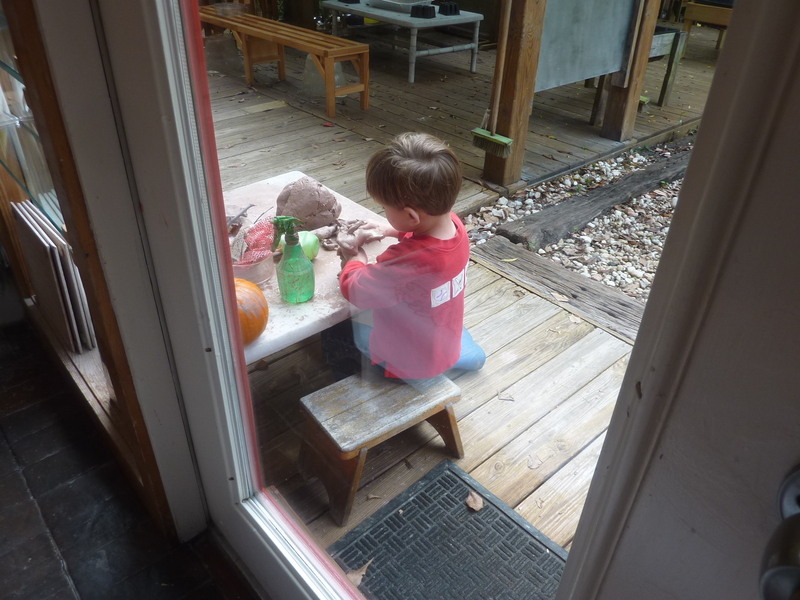 Materials — clay, paint, markers, oil pastels, blocks, sand, water, brios, wood, paper, stones, fabric, musical instruments – are media for expression and representation; they respond and inspire rather than instruct. 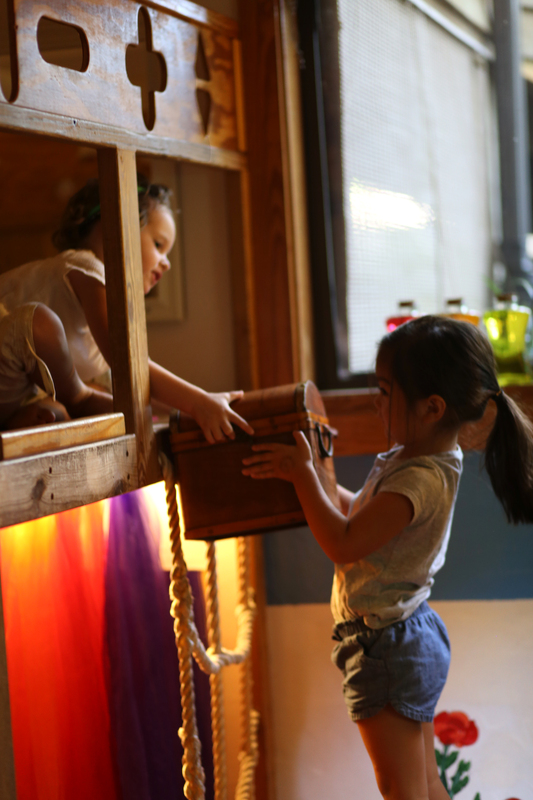 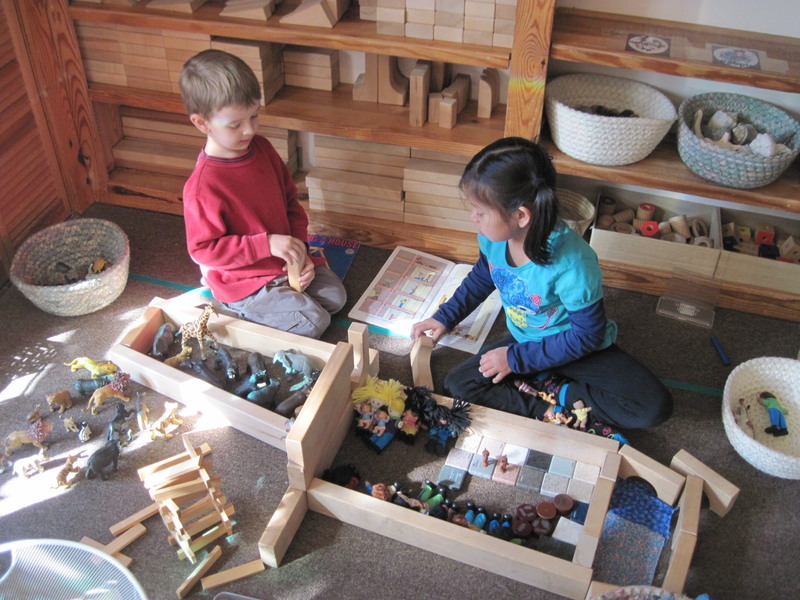 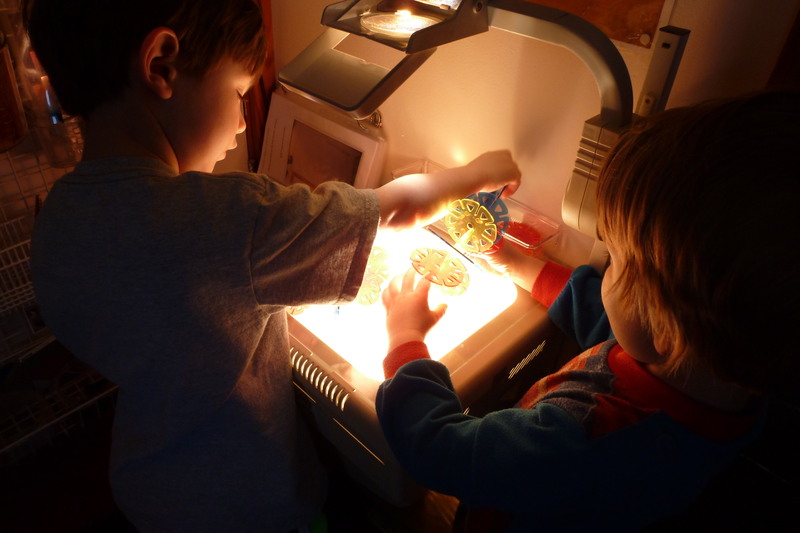 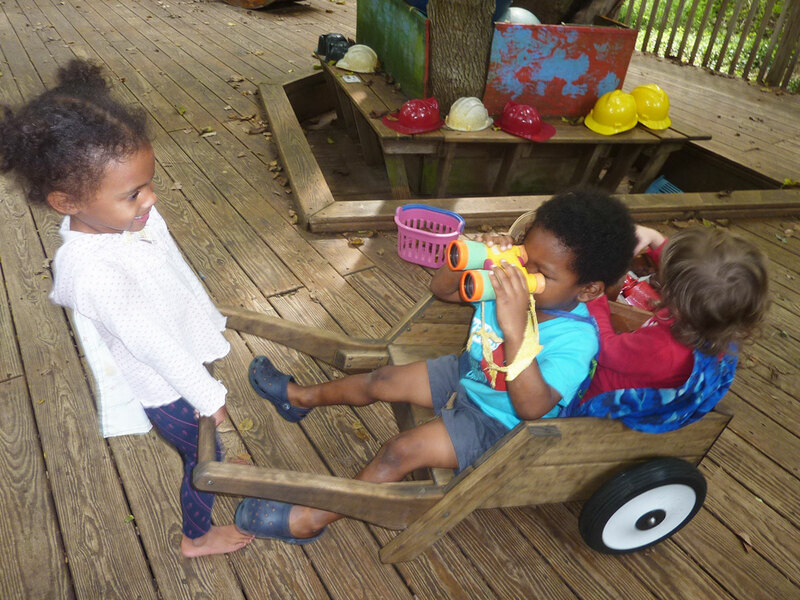 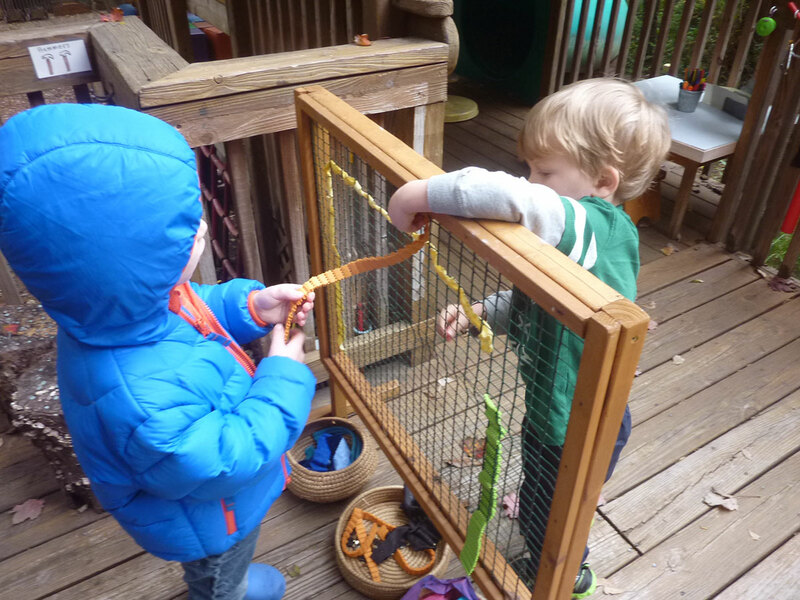 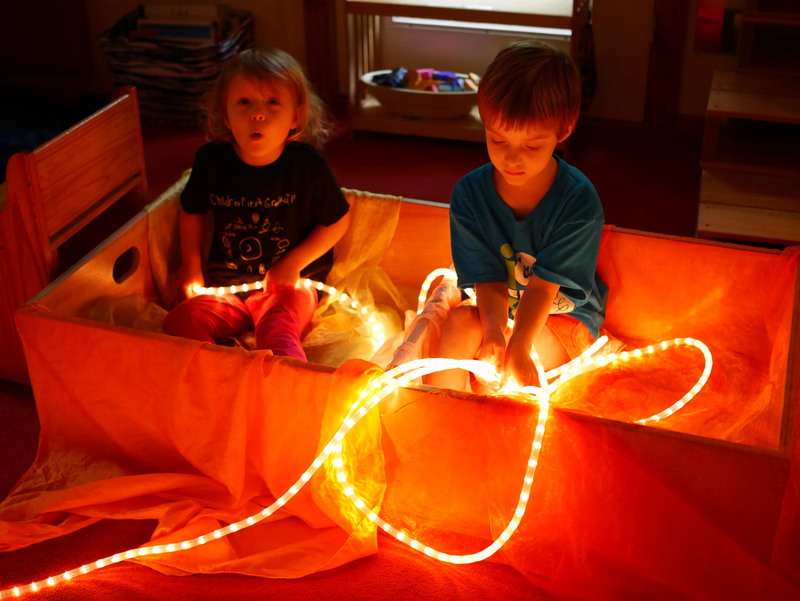 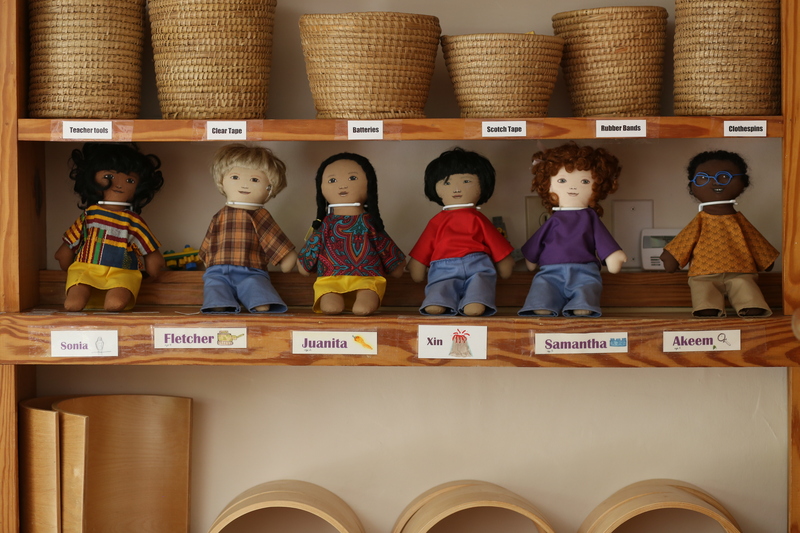 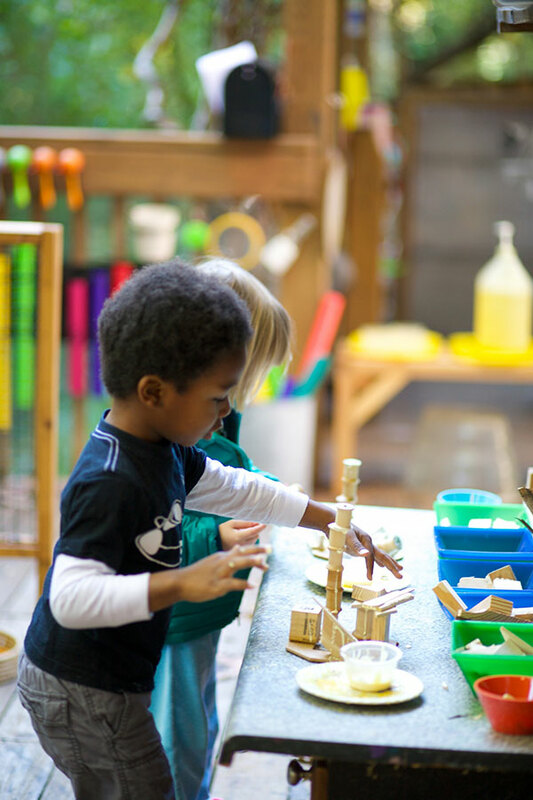 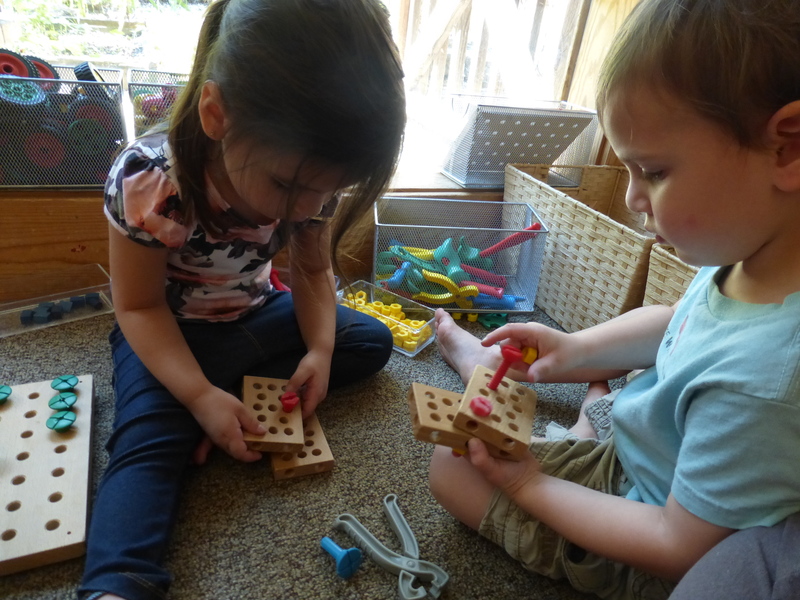 When children explore the Children First classroom, they will find some lovely playthings, but mostly they will meet up with open-ended materials that we hope will become fast friends. 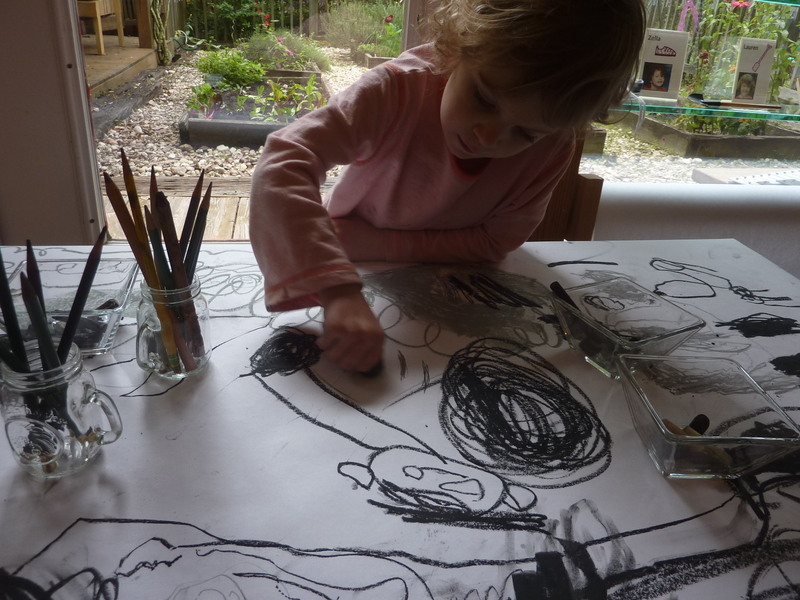 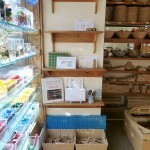 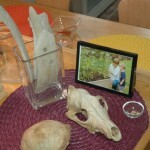 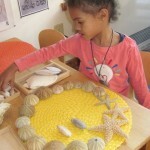 We want Children Firsters to feel completely at home with the creative freedom these materials offer. 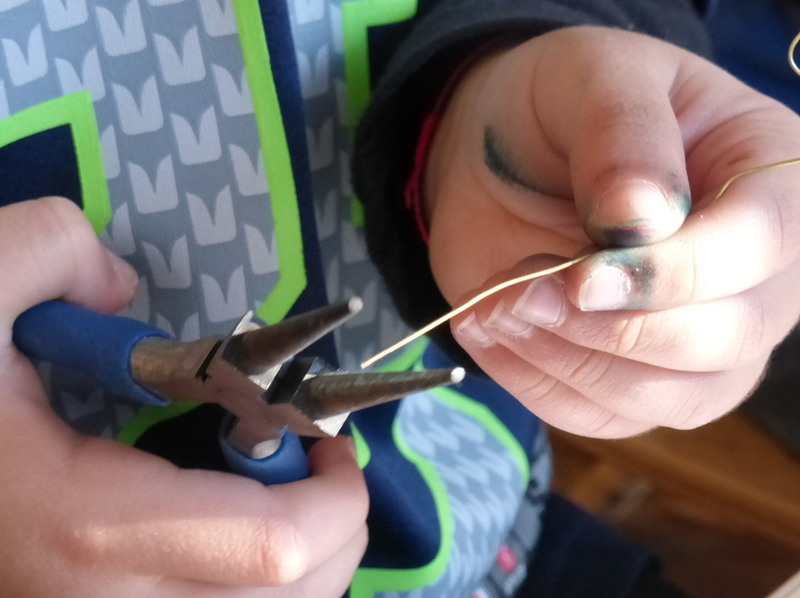 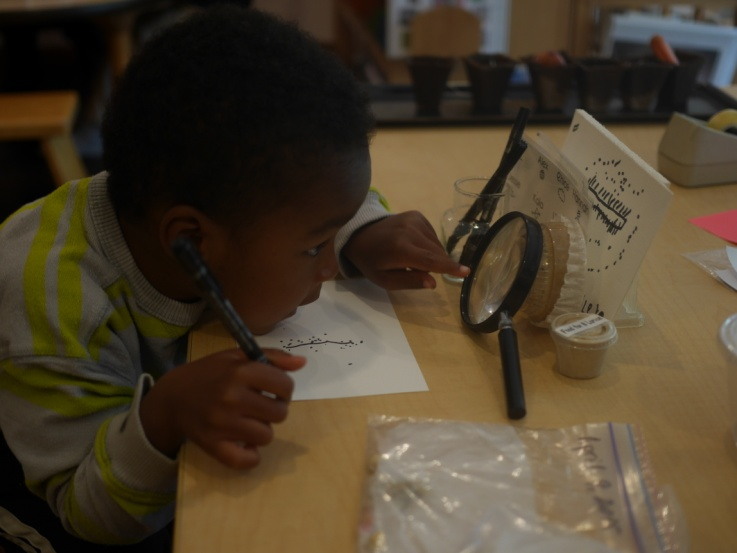 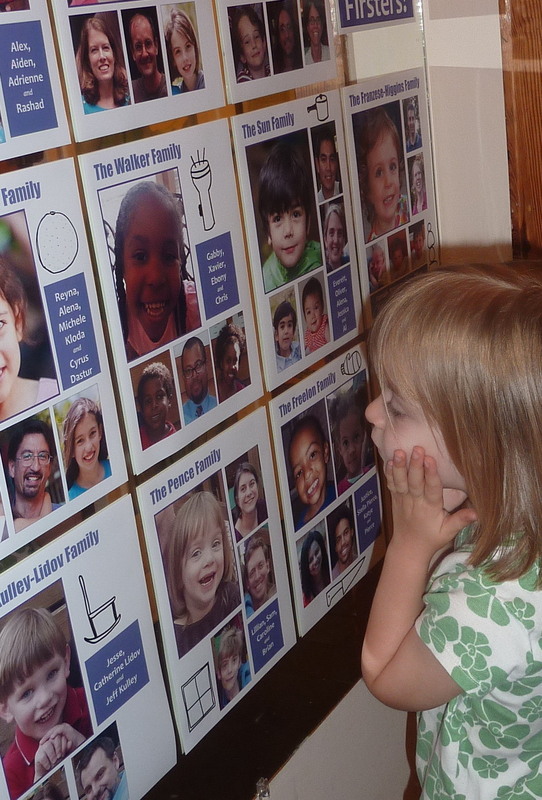 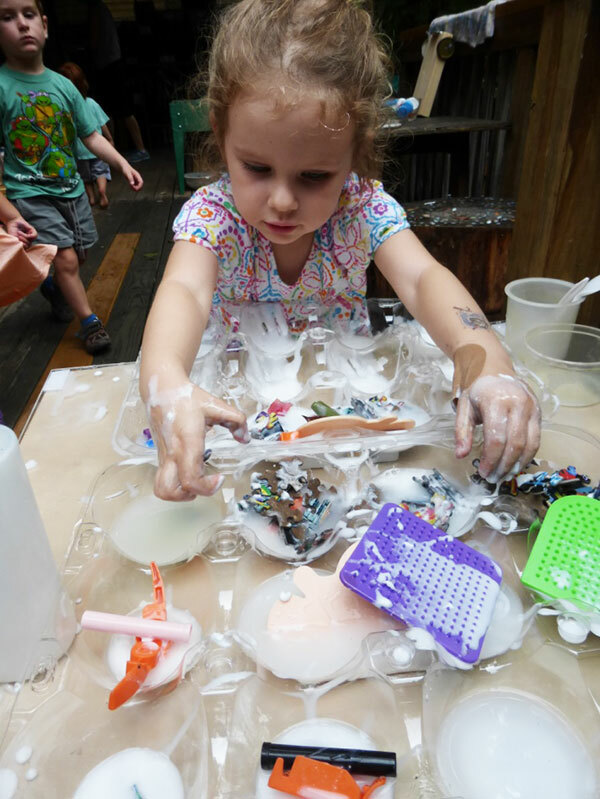 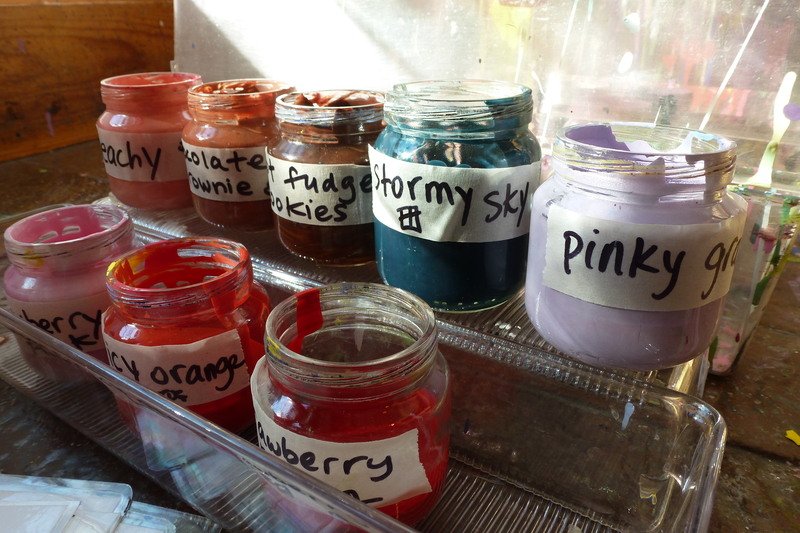 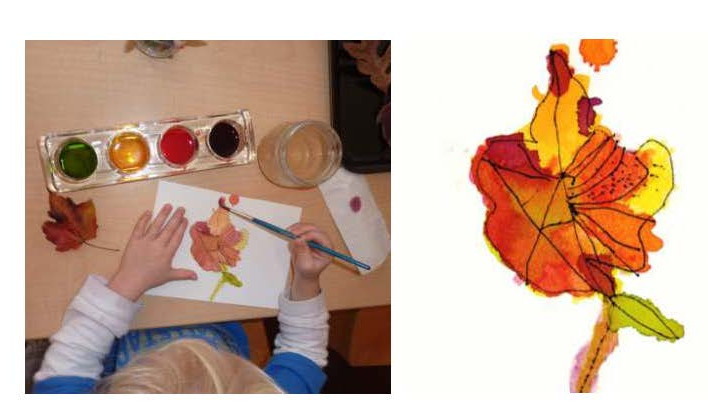 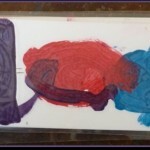 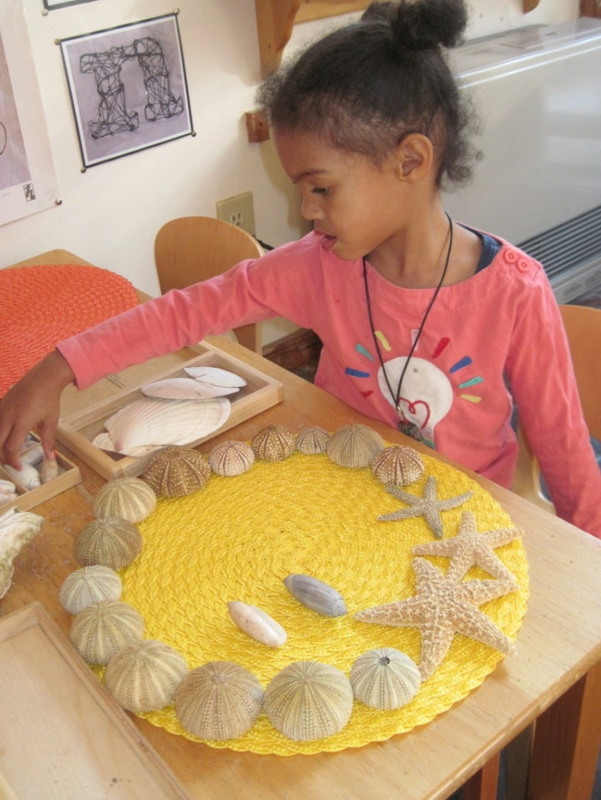 Over time, we want them to unlock the mysteries of these materials, to discover the “hundred ways” these materials can make ideas and feelings visible and audible and understandable to themselves and others. 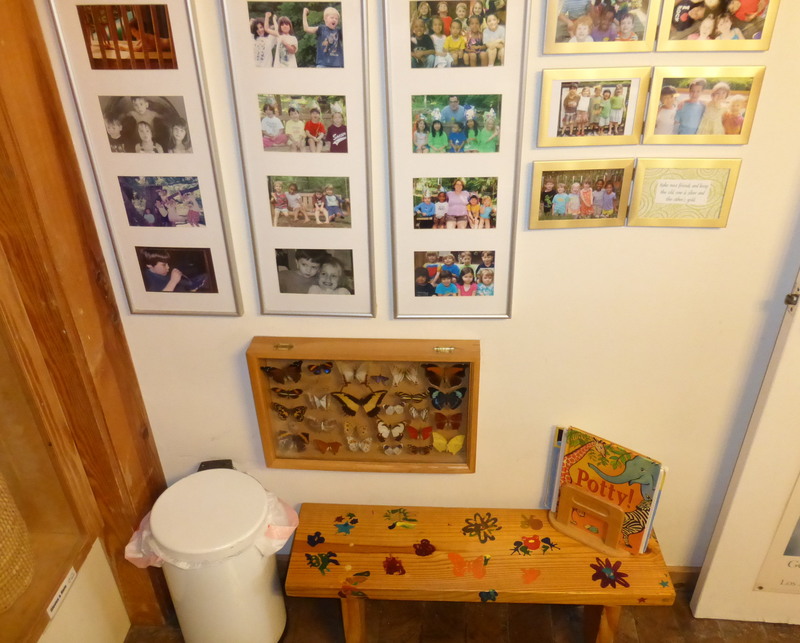 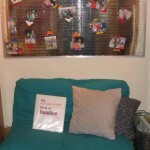 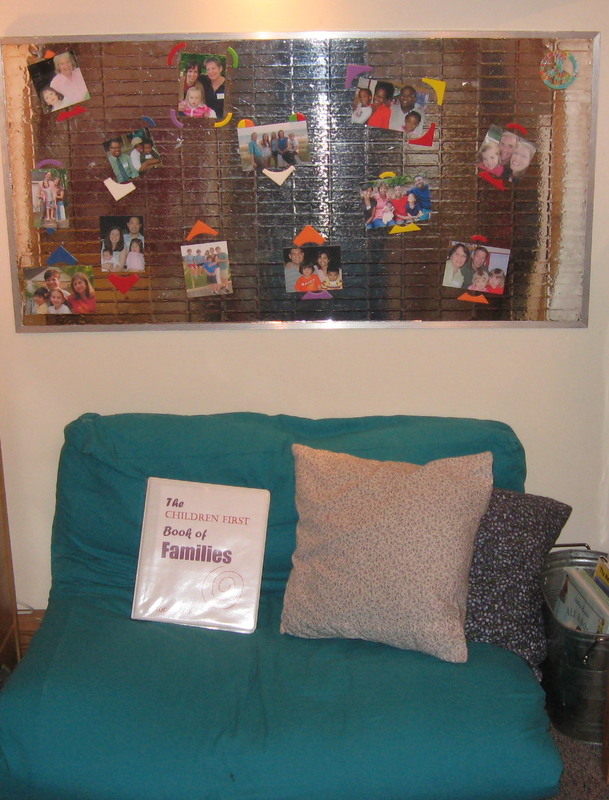 Snuggle Spot—a corner in the office with a comfy futon, pictures of families, a bucket of books and a shelf full of the children’s portfolios —perfect for a quiet moment with a parent before saying good-bye in the morning. 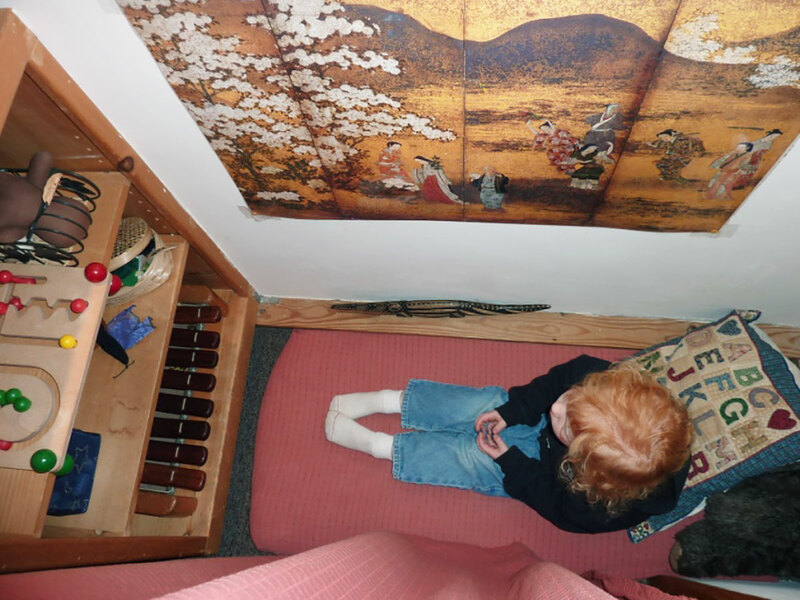 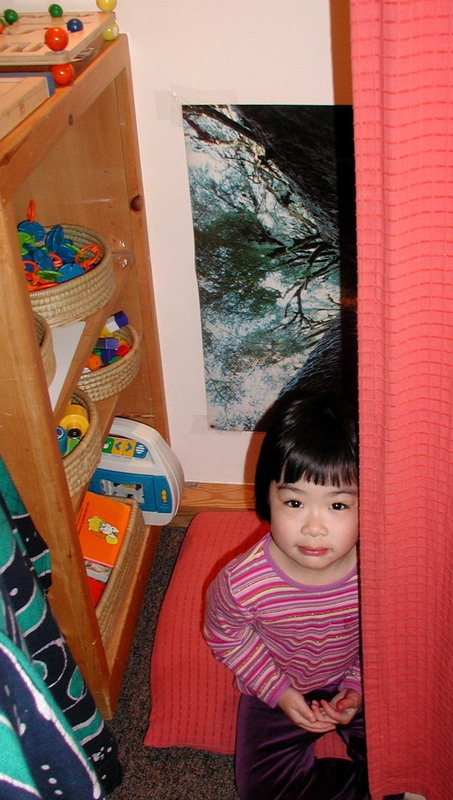 Alone Space—a closet converted into a soft space with pillows, stuffed animals, and quiet toys; a place where children may choose to be alone whenever they wish. 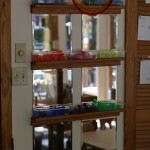 Post Office—mailboxes for each child, family, and teacher, along with writing supplies like pencils markers, paper, stickers, letter stamps and envelopes. 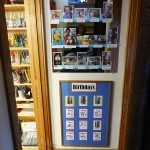 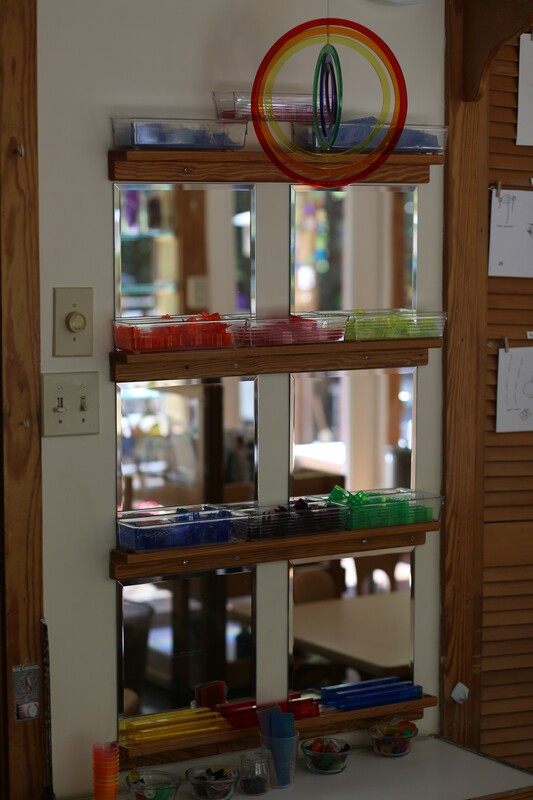 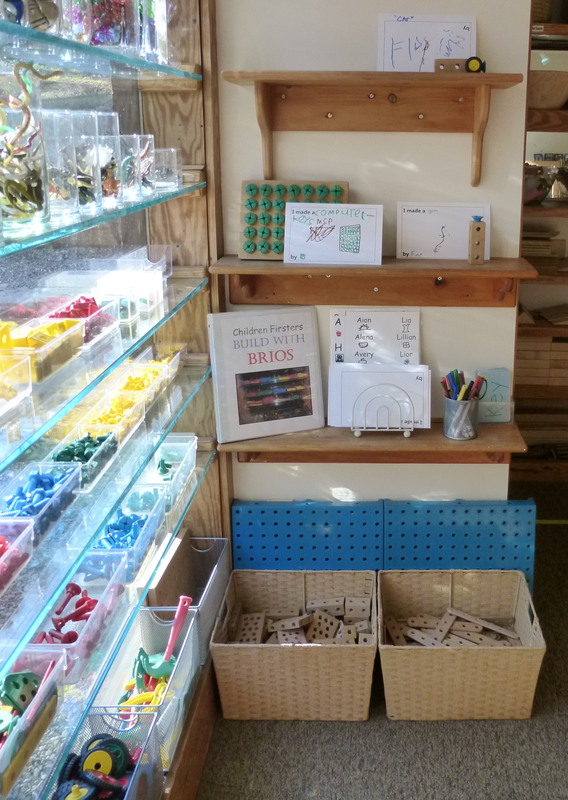 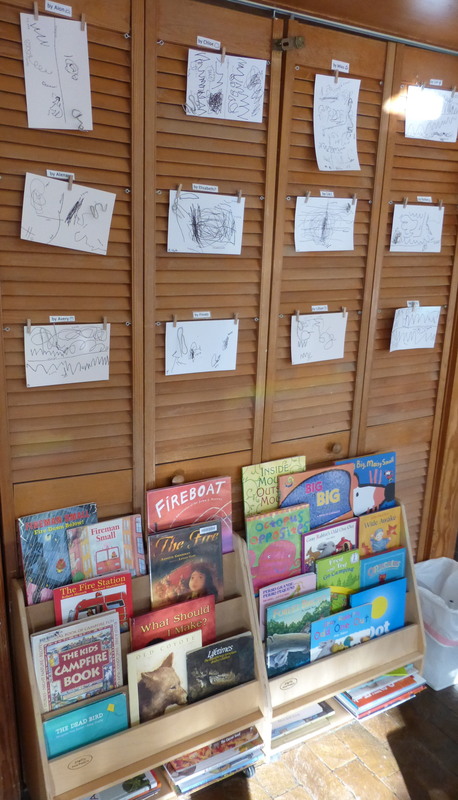 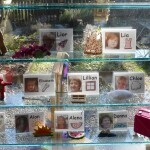 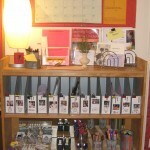 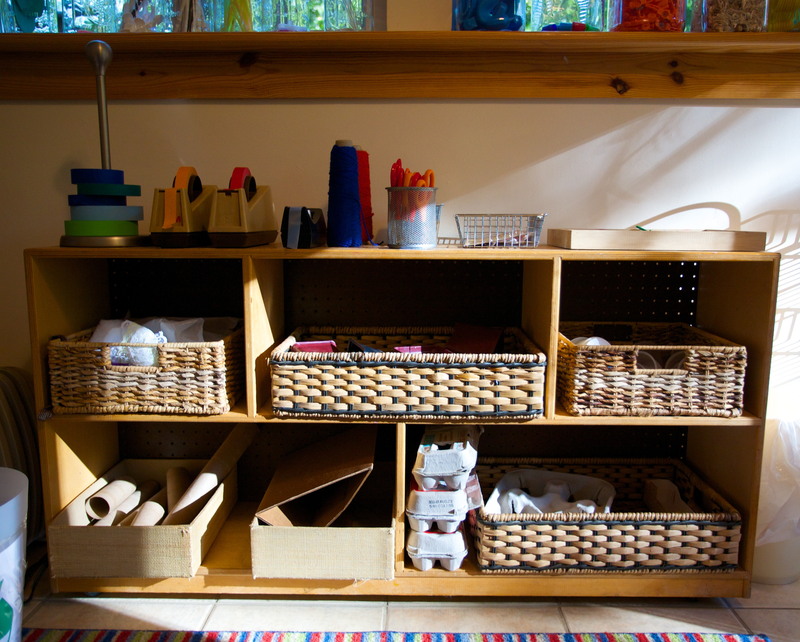 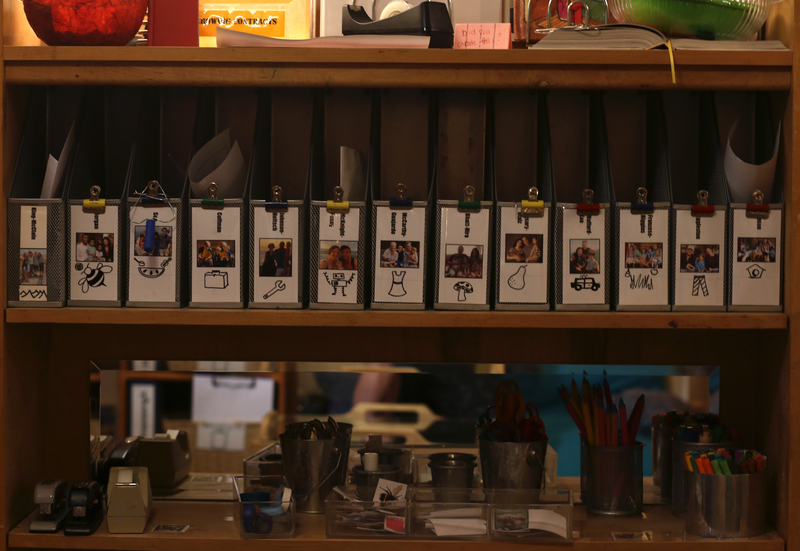 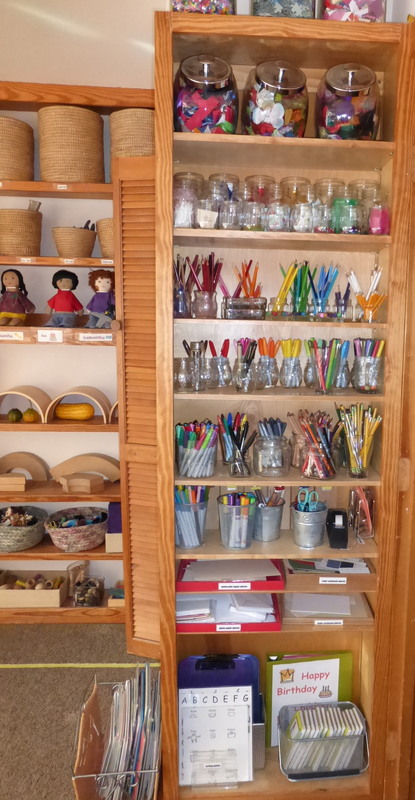 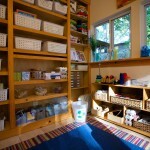 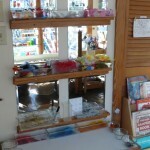 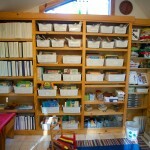 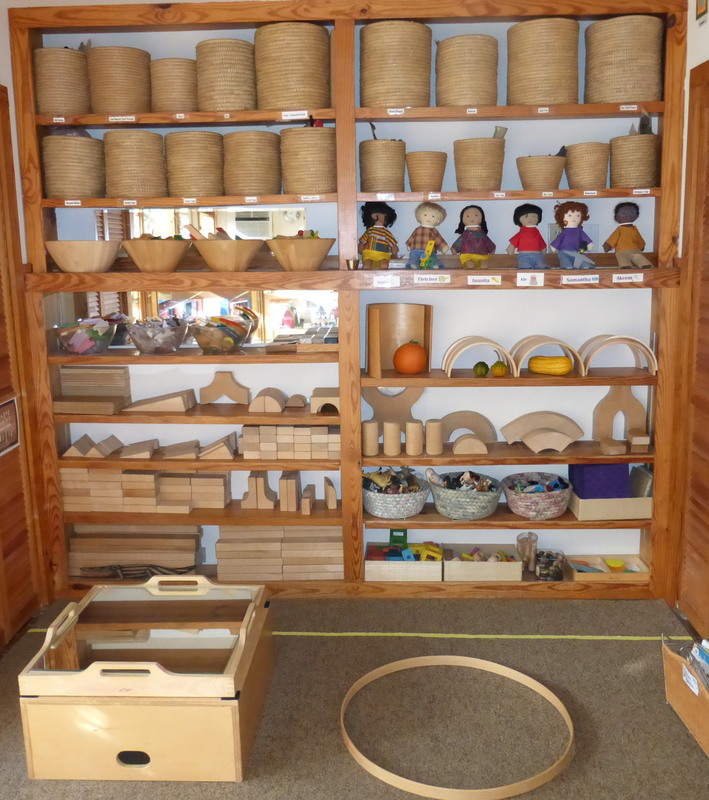 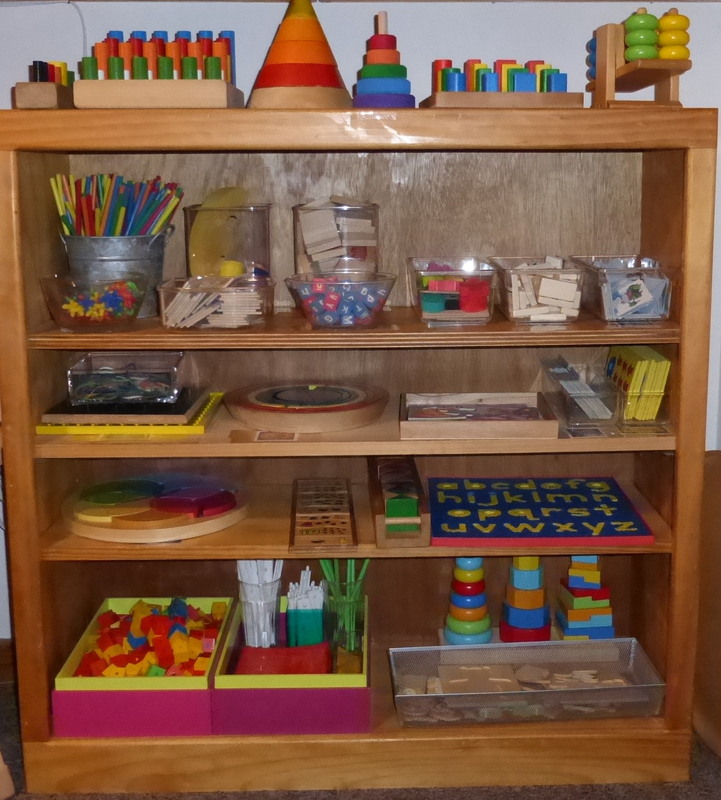 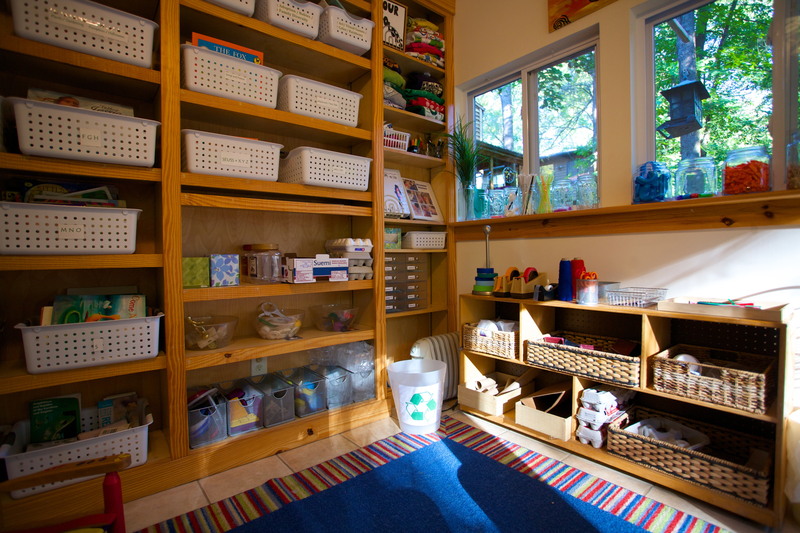 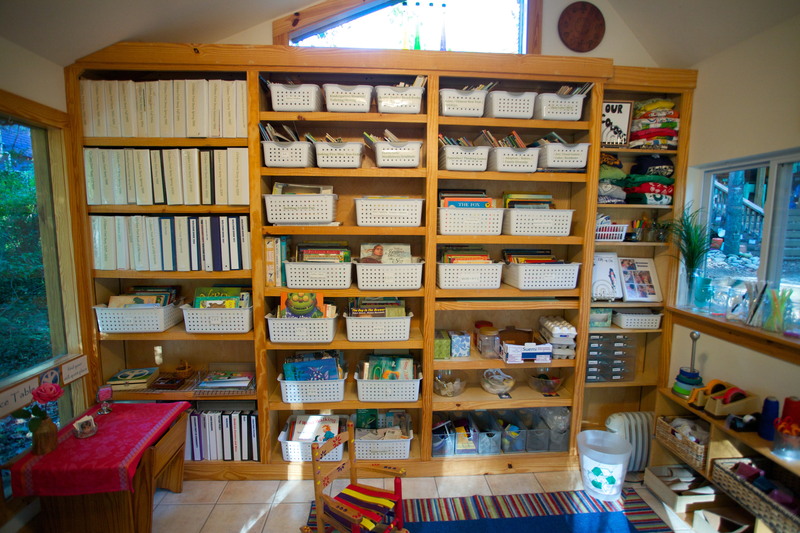 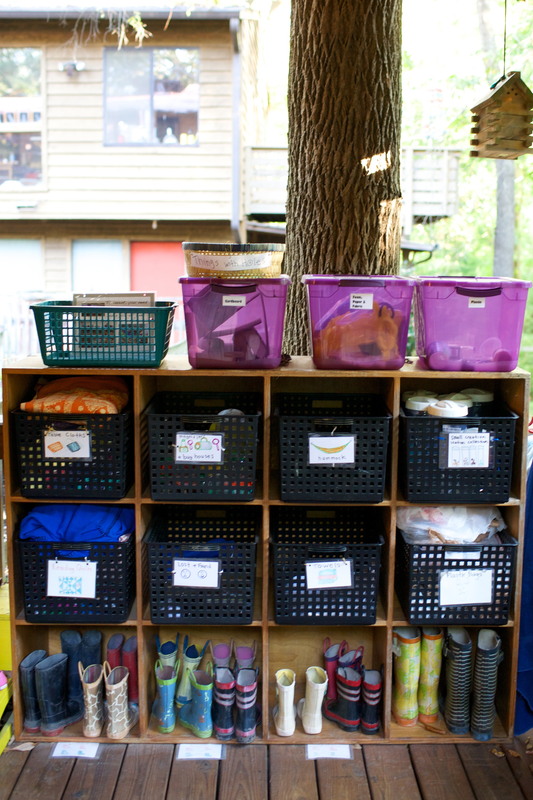 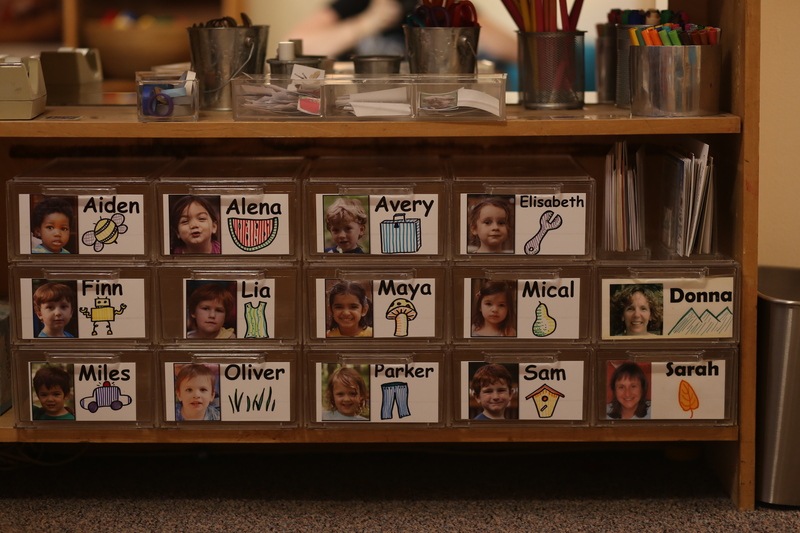 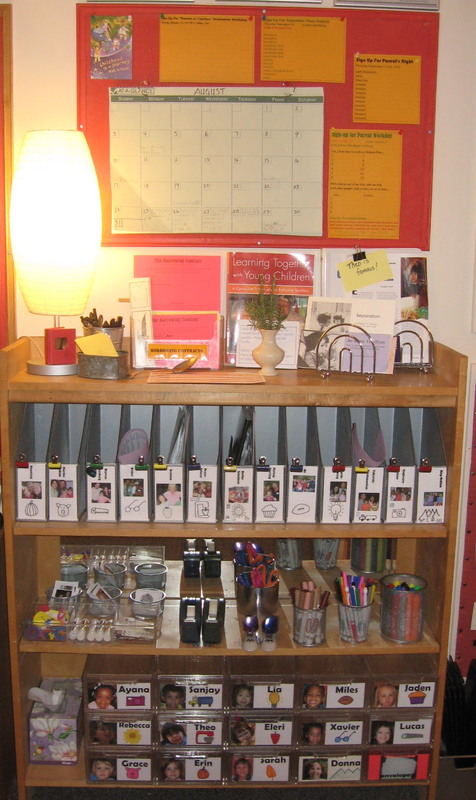 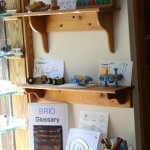 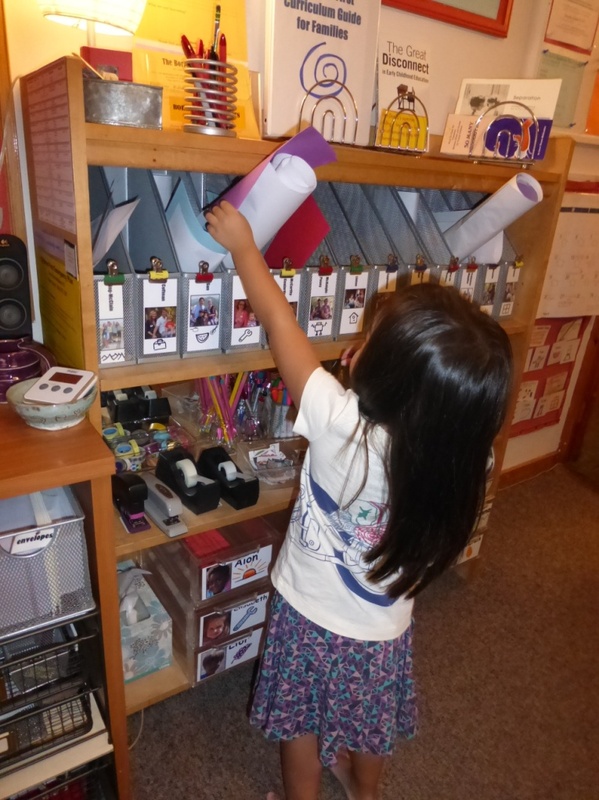 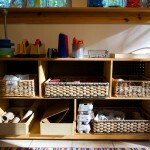 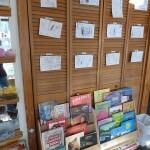 Math Shelf—a variety of materials for sorting, sequencing, matching, measuring, balancing and building. 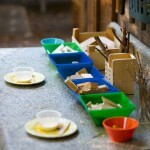 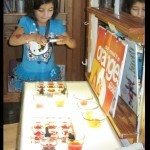 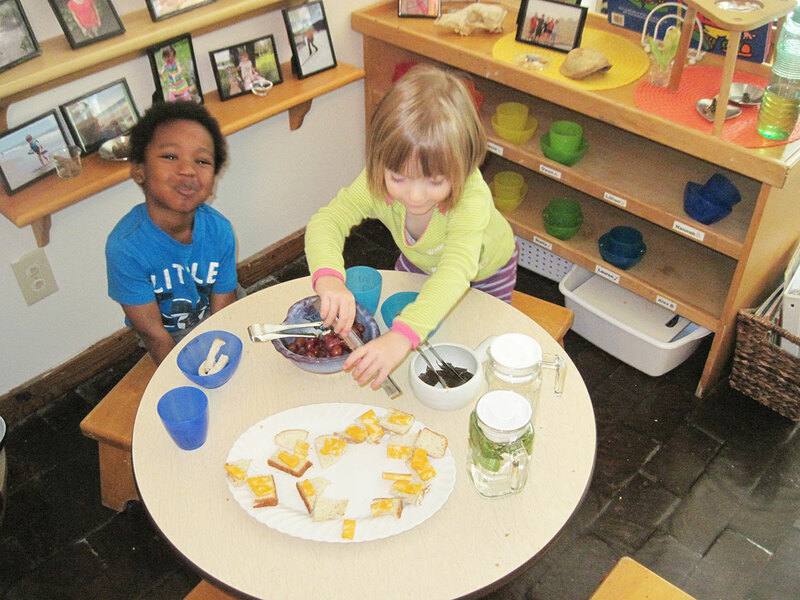 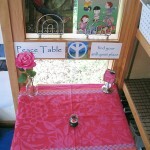 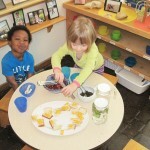 Snack Table—where children help themselves to food and drink throughout the morning whenever they are hungry. 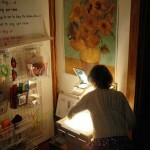 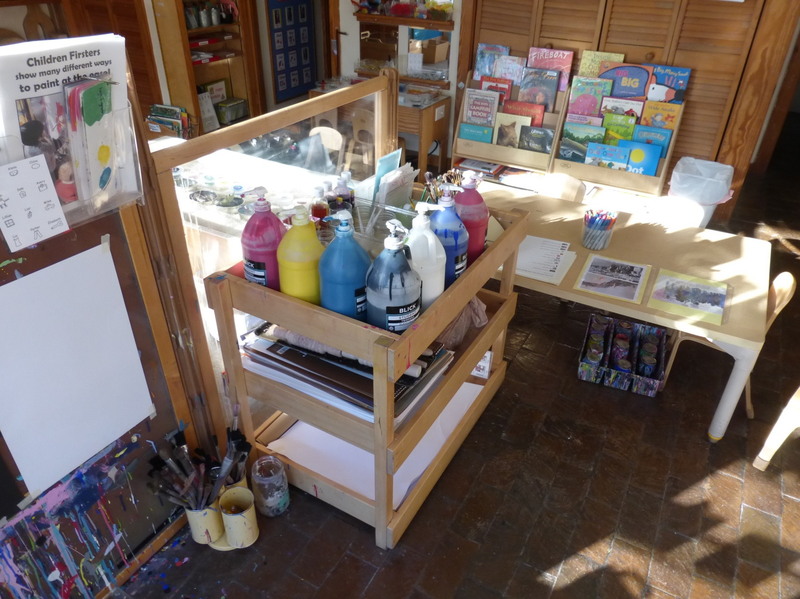 Light Table—a small table with a lighted surface, ideal for watercolor painting, mixing colors, and designing with colorful and transparent materials. 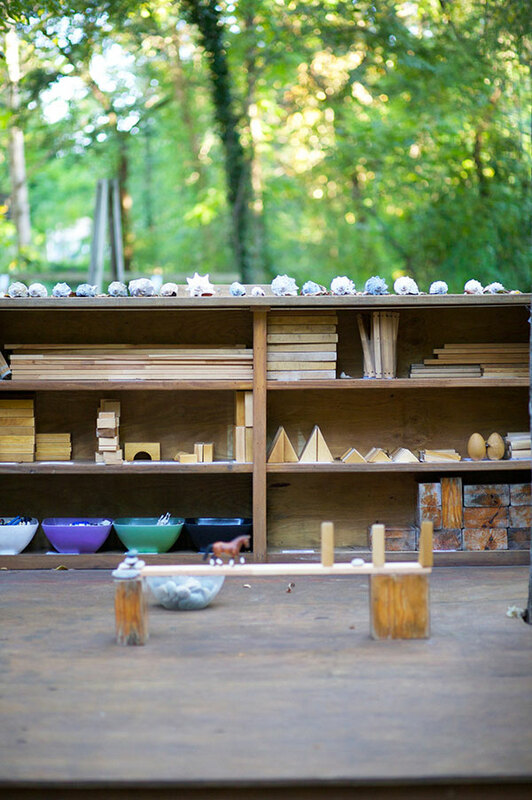 Rice Table—a big basin where children work with fragrant jasmine rice and a variety of tools, design elements and builders. 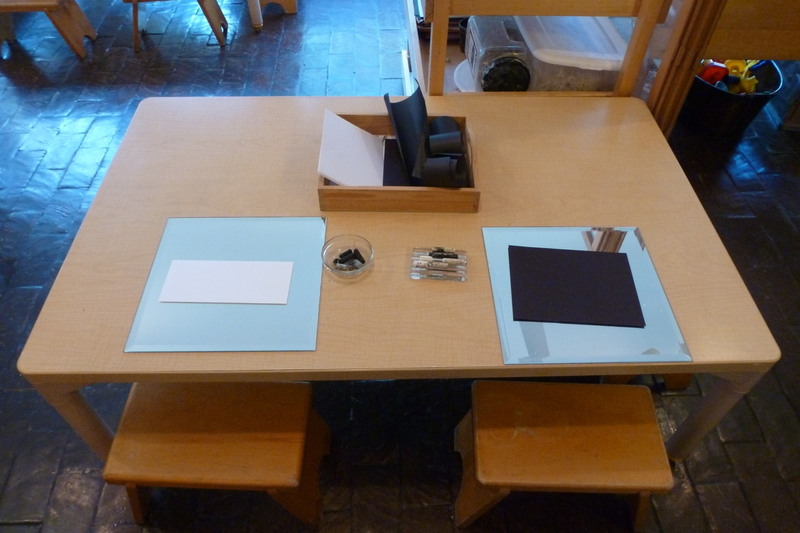 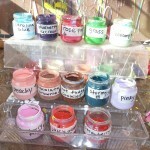 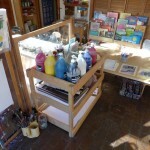 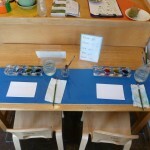 Art Tables—for work with clay, paint, marker, oil pastels, color pencils, drawing pens, collage, design, and wire. 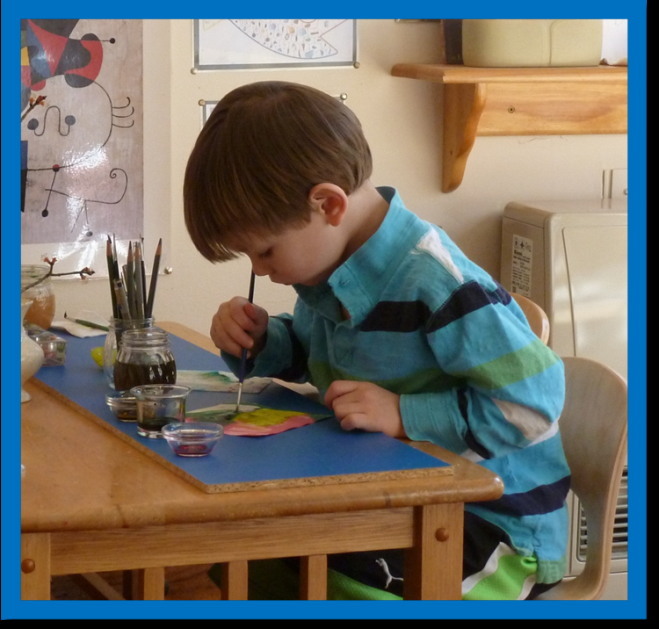 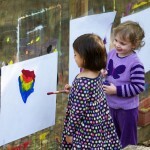 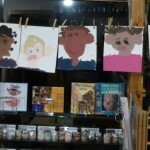 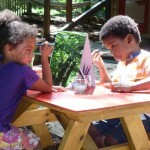 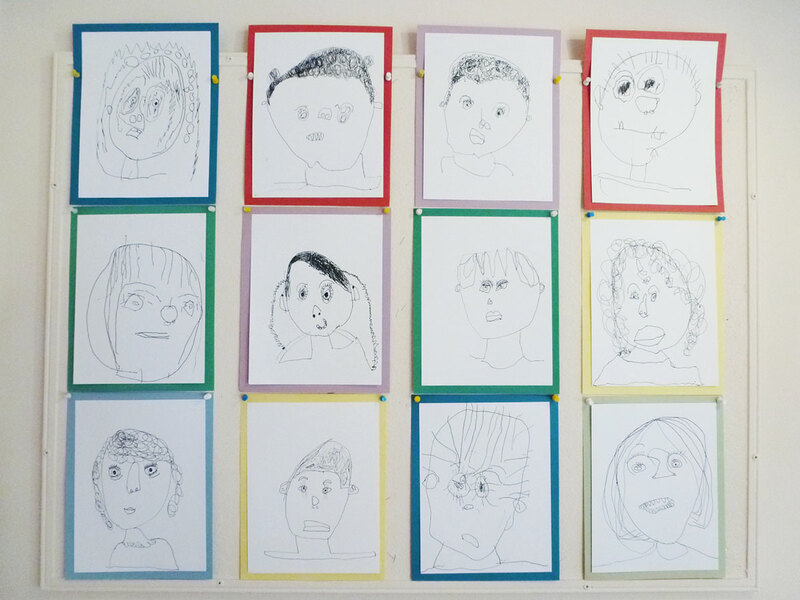 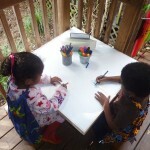 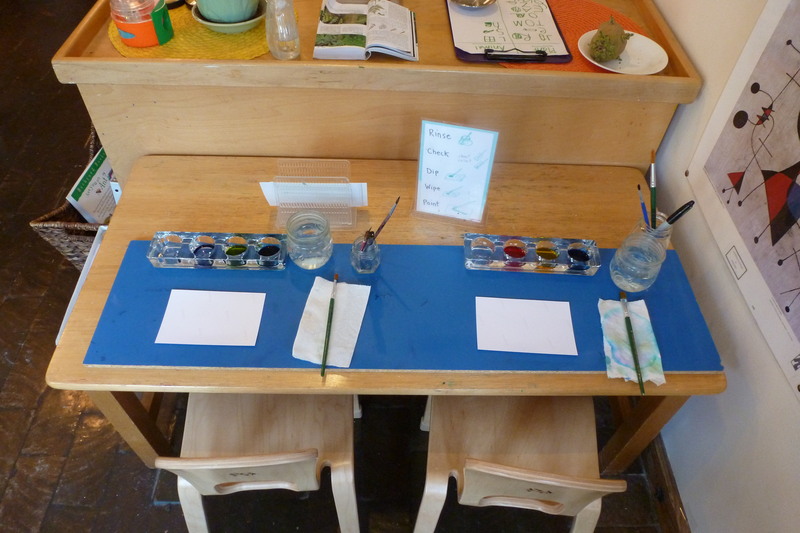 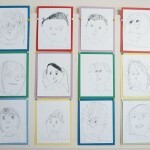 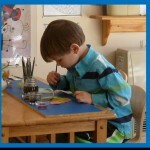 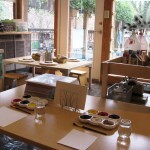 Easels —where children paint and draw alone or with friends. 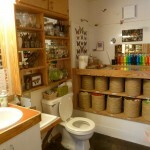 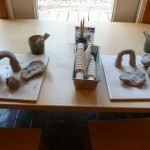 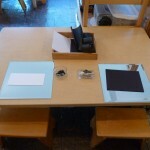 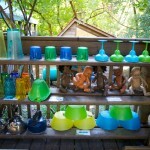 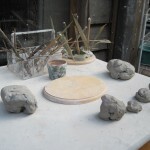 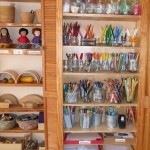 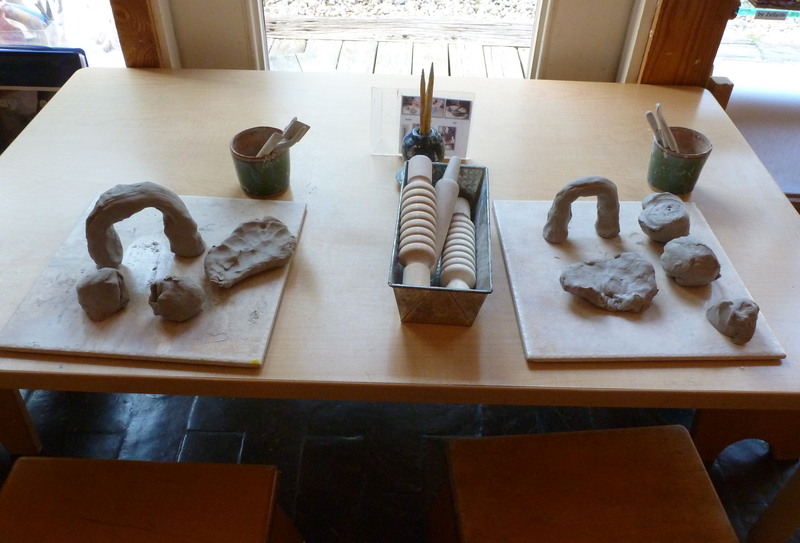 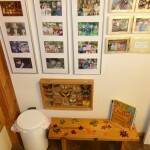 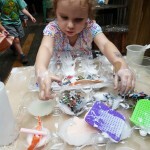 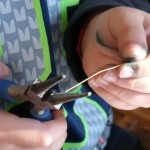 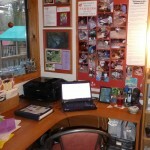 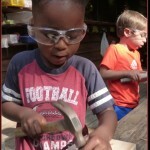 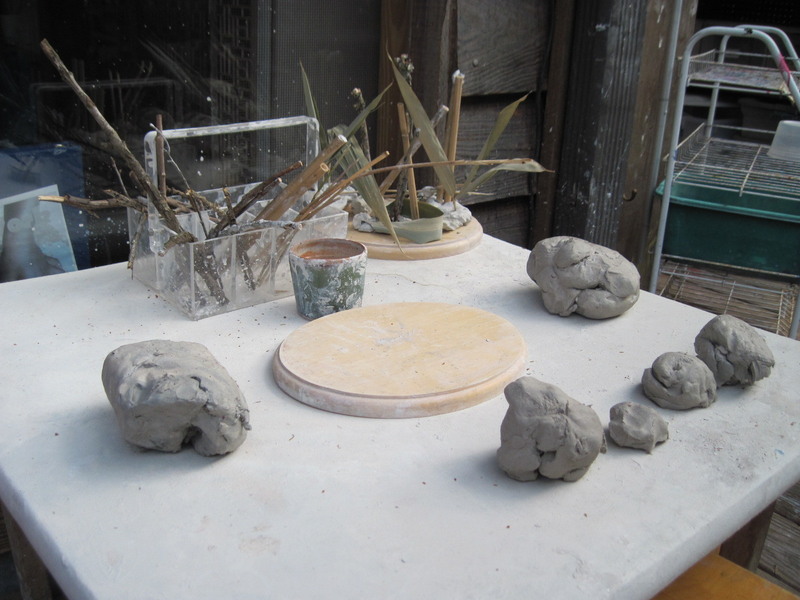 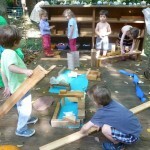 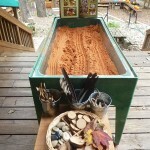 Creation Station—–for construction with recycled materials. 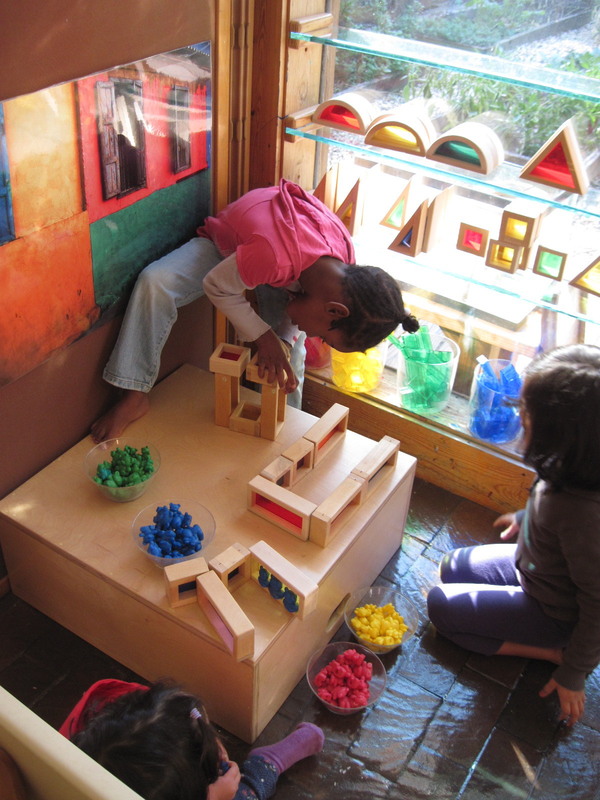 Blocks—a carpeted workspace for unit blocks, design materials, and props for small-scale pretending. 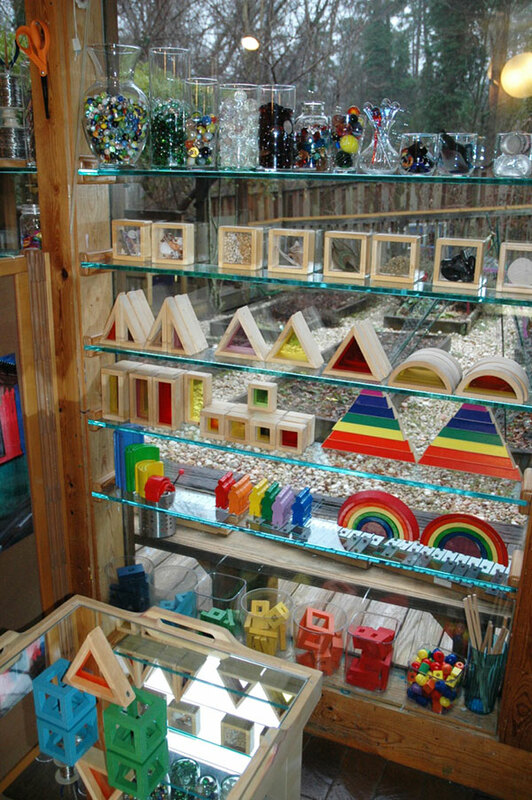 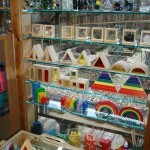 Rainbow Blocks —an array of colorful builders and loose parts. 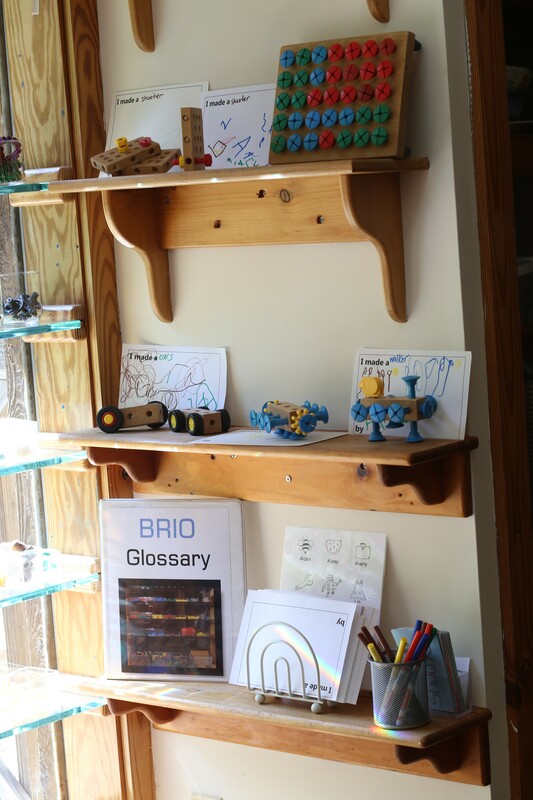 Brios —a collection of tools, builders and hardware for making things like props for loft room pretending and vehicles for block building play. 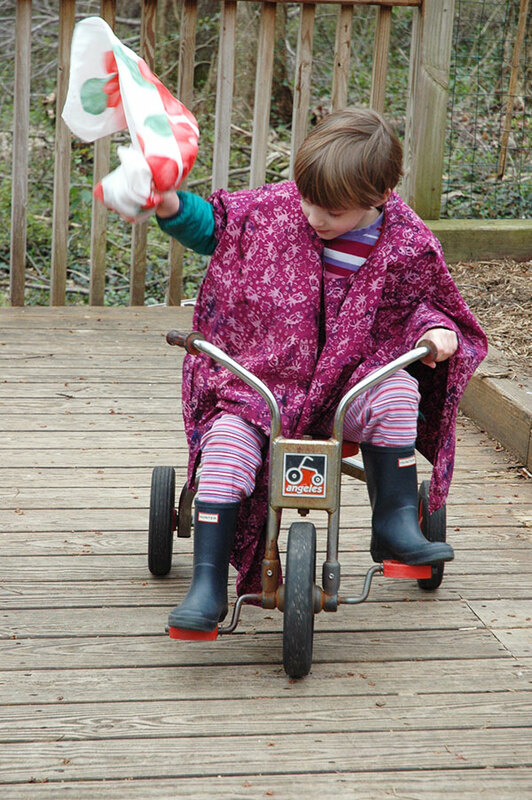 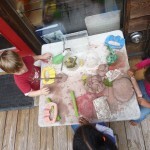 Dress-Up and Play Kitchen —baby dolls, pocketbooks, recycled phones, capes, fabric, doctor tools, and other loose parts and props for pretend play. 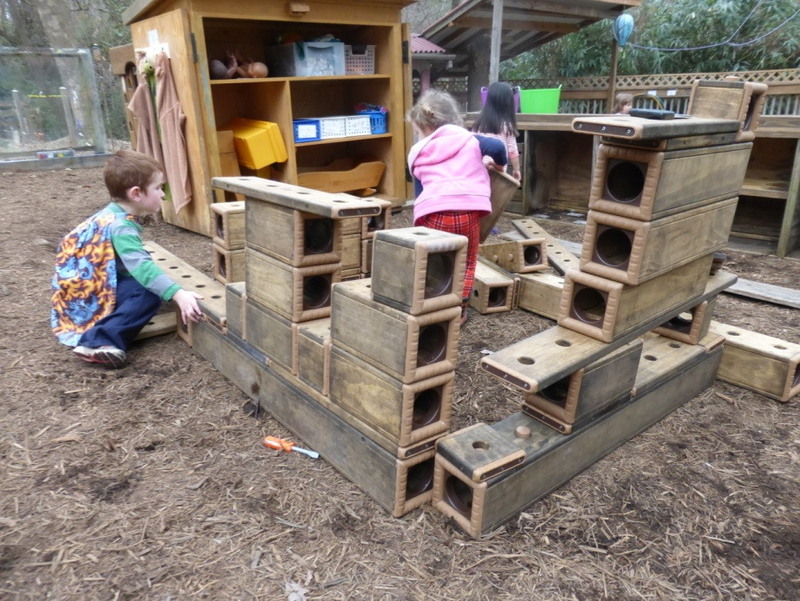 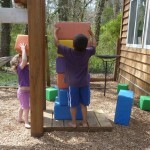 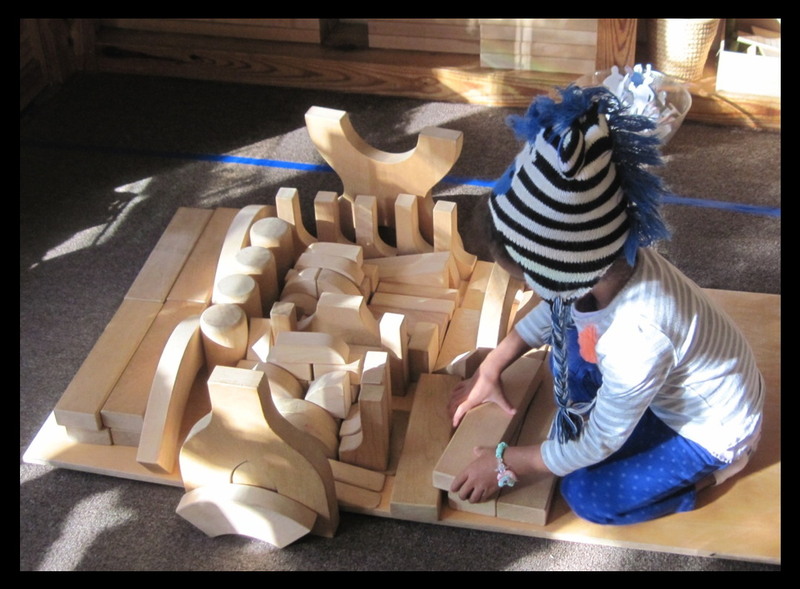 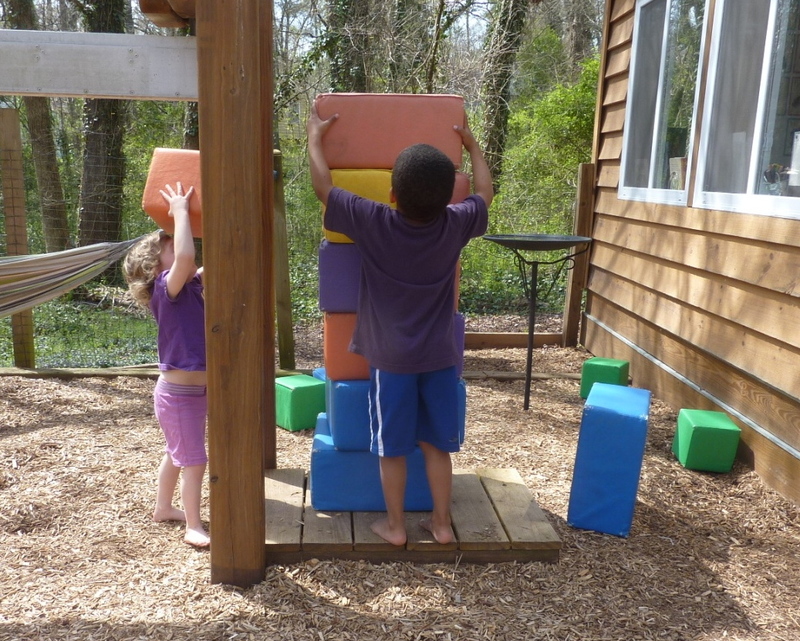 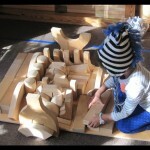 Big Blocks— for building settings for pretend play. 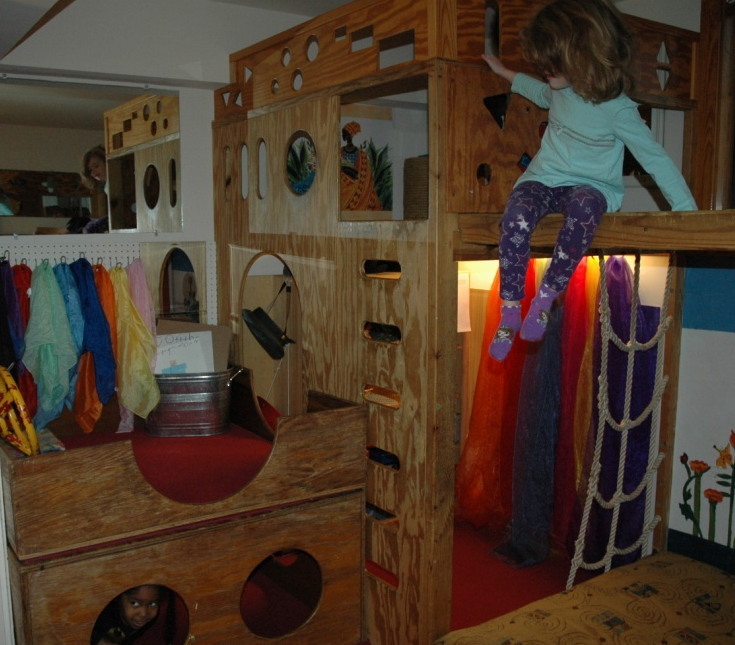 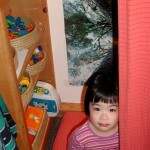 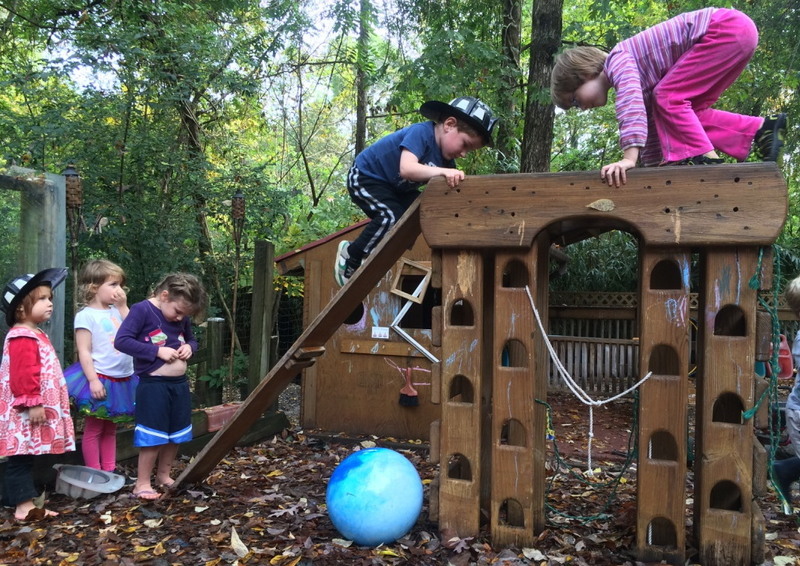 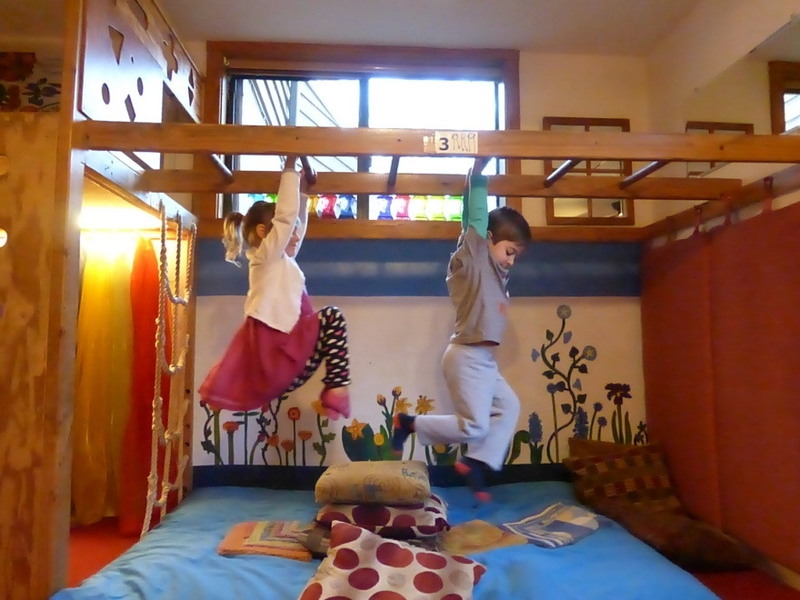 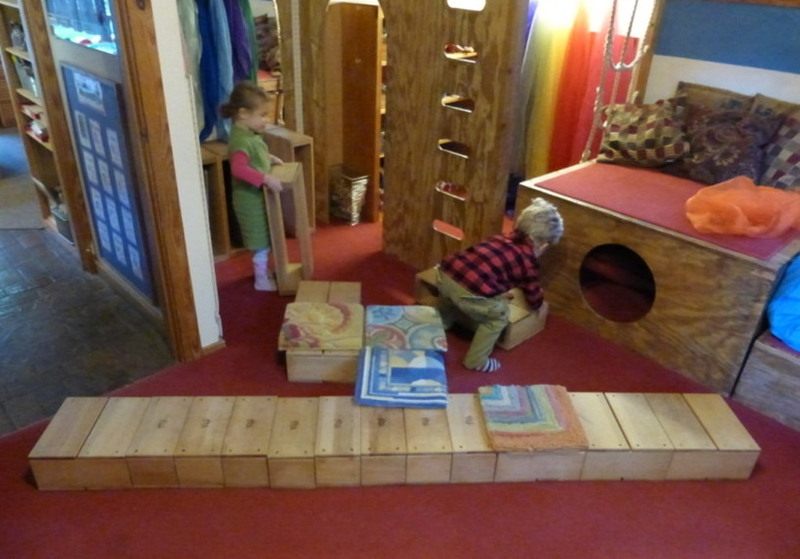 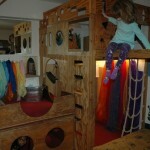 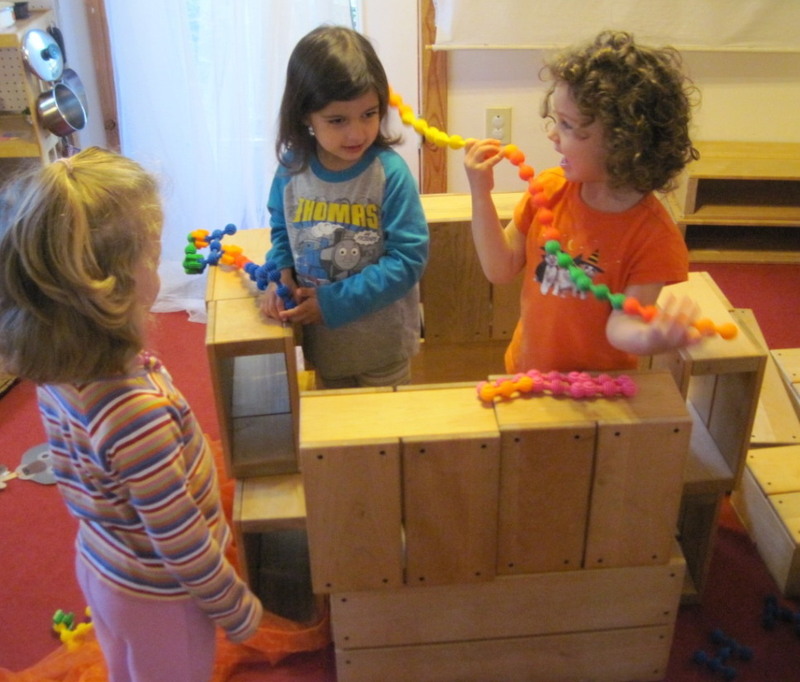 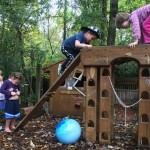 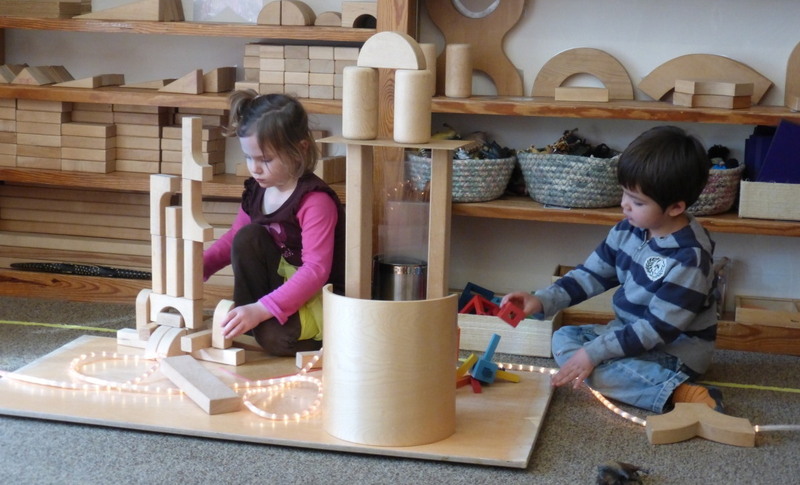 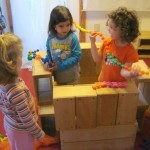 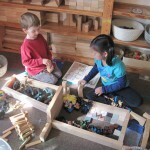 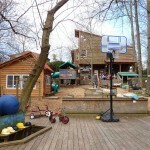 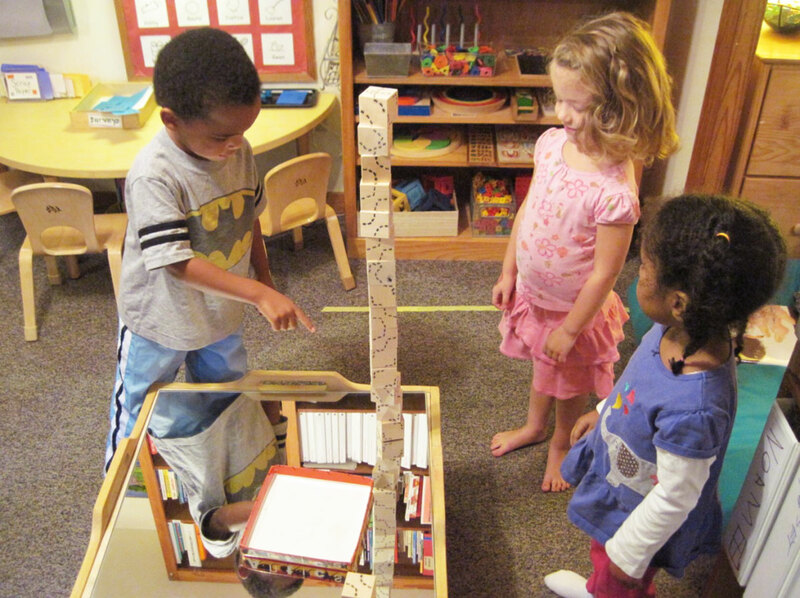 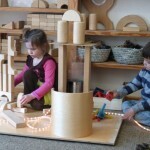 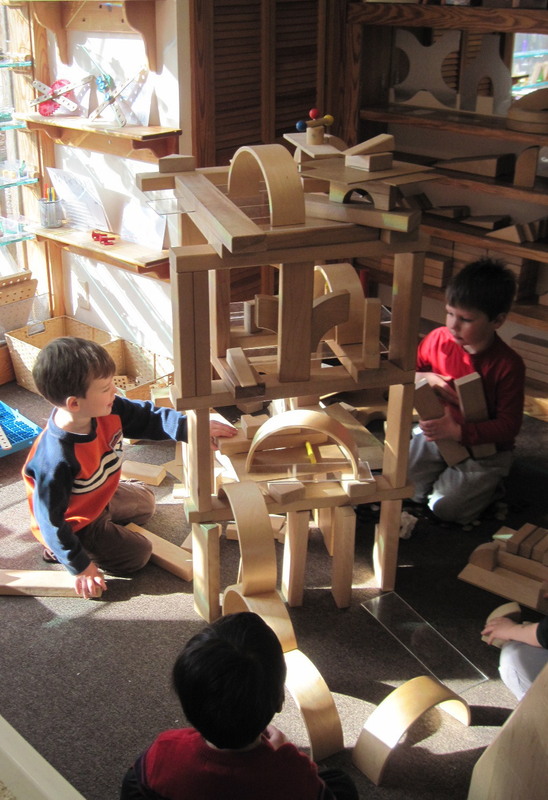 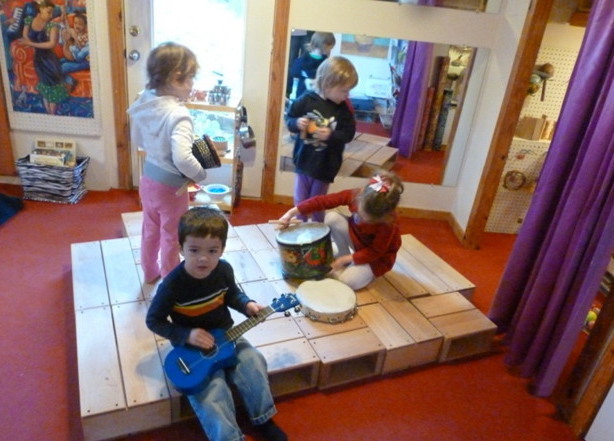 Loft, Big Boxes and Monkey Bars—a change-able indoor structure for pretending and large-motor play. 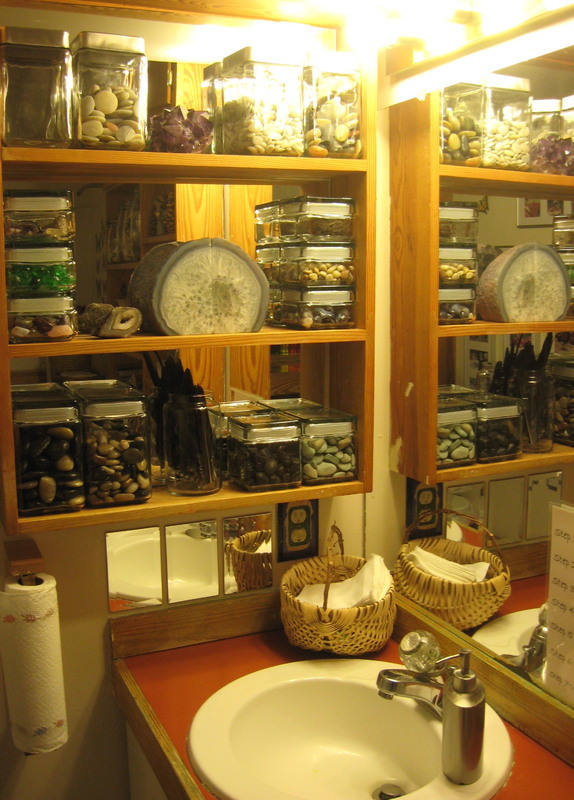 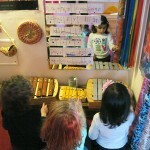 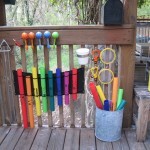 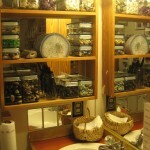 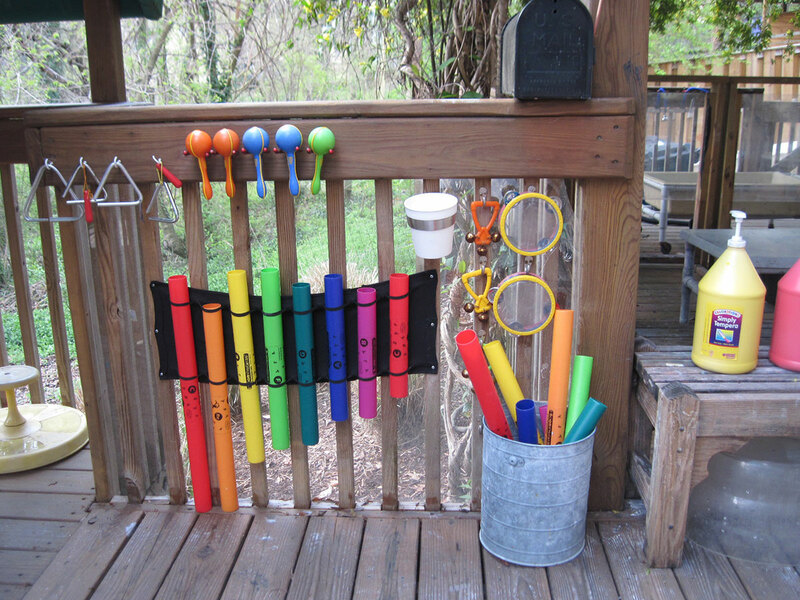 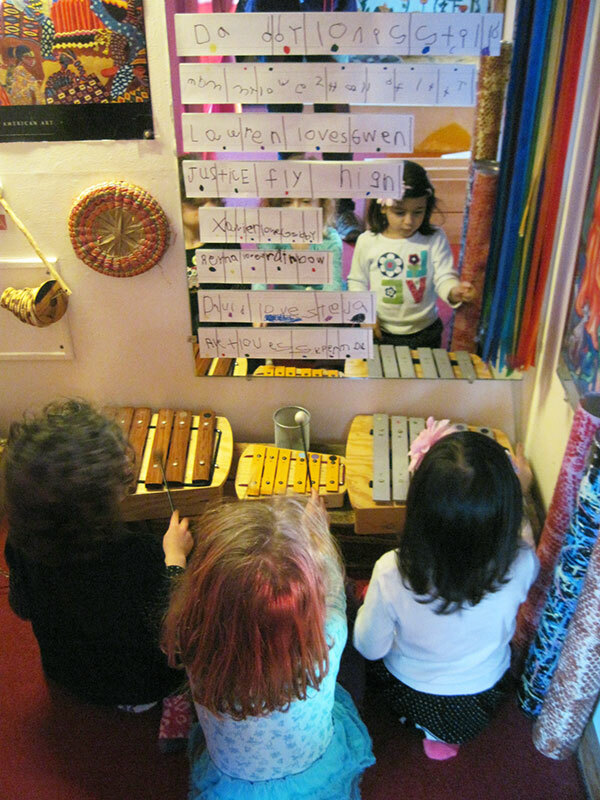 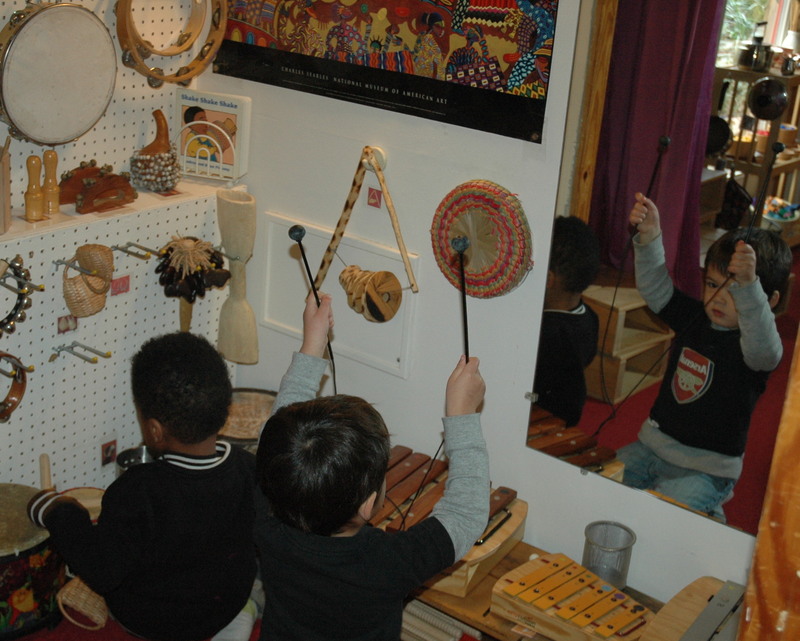 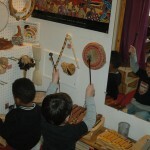 Music Closet—a variety of musical and percussion instruments. 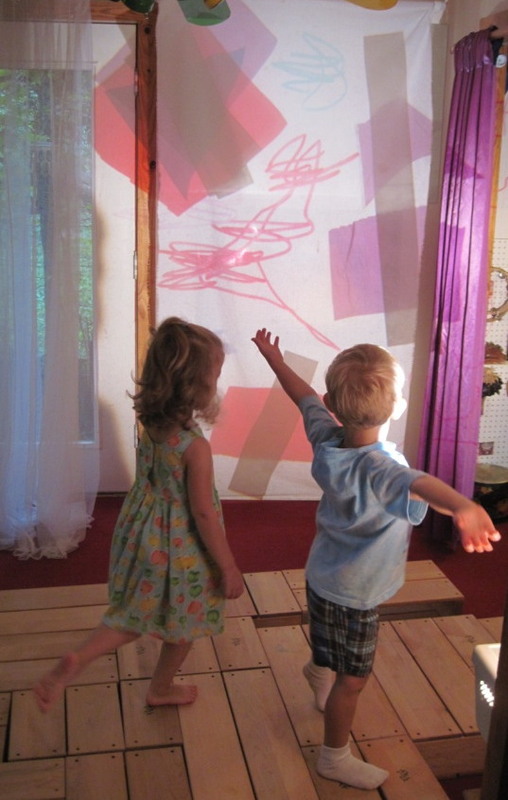 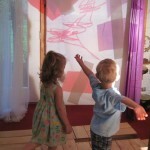 Projector — for experimentation with light, shadow, and color. 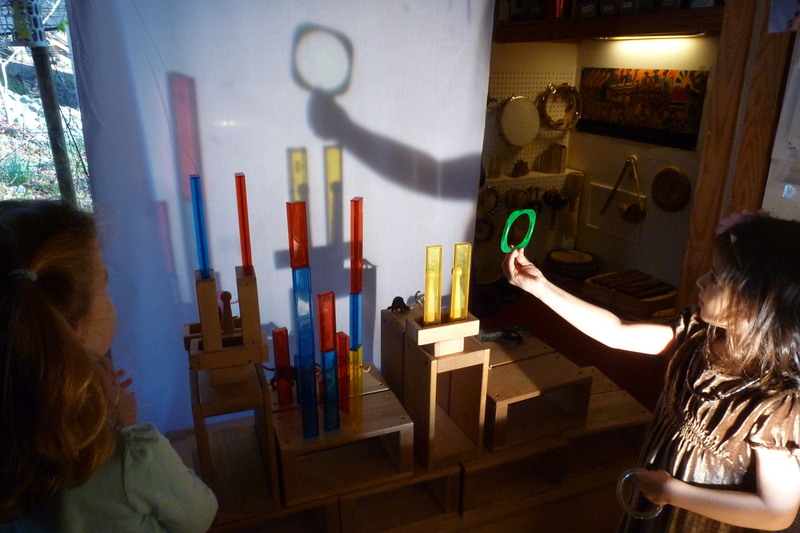 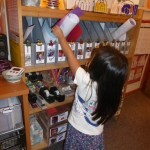 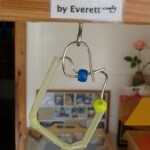 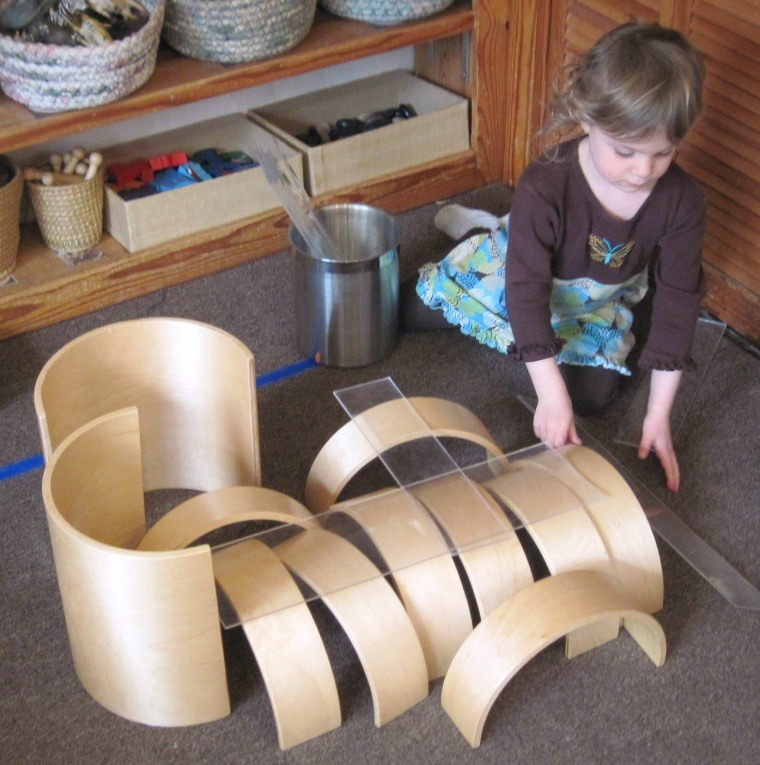 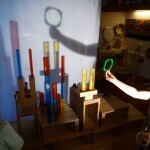 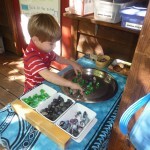 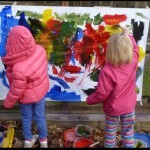 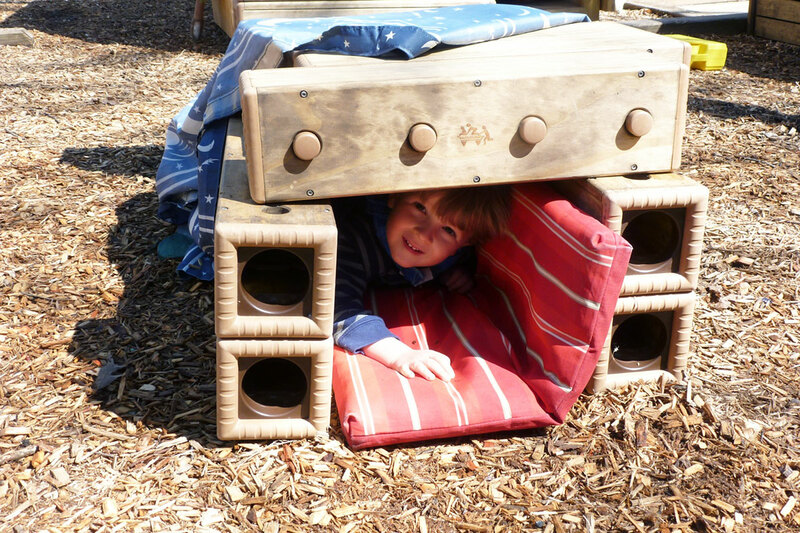 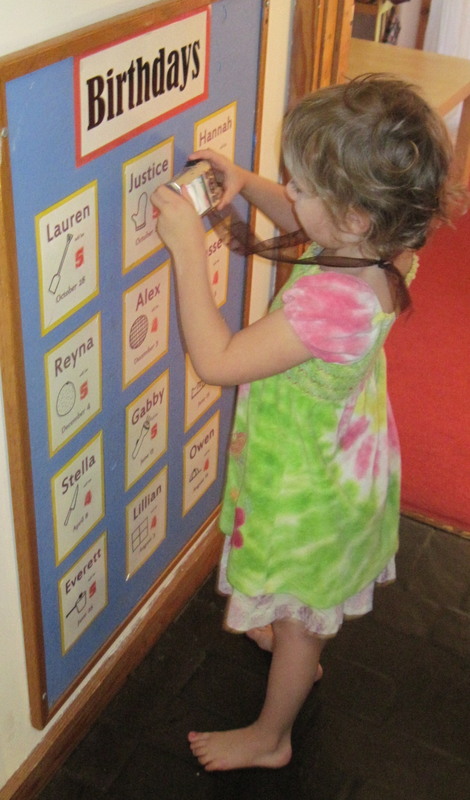 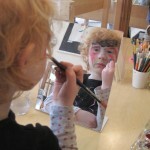 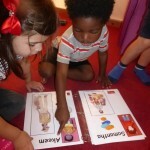 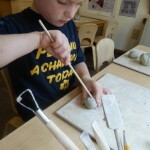 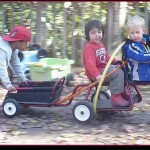 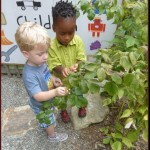 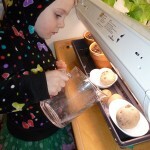 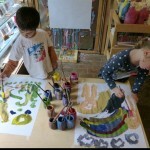 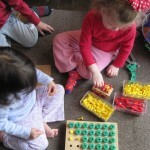 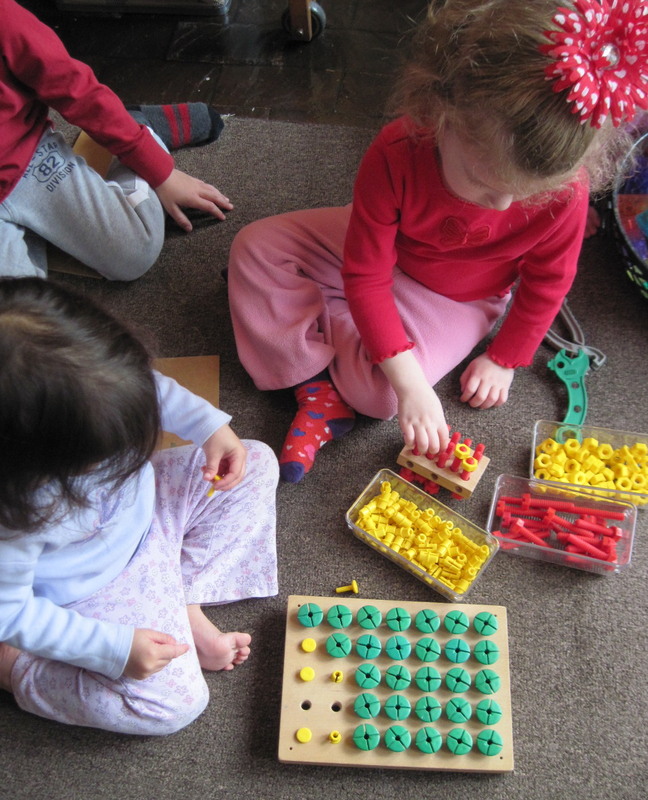 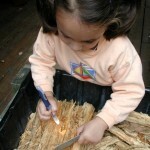 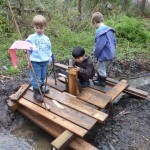 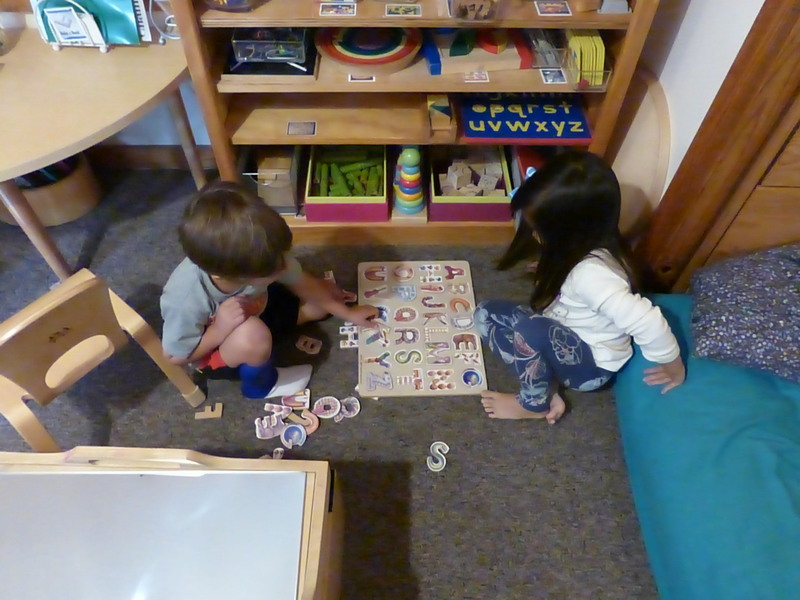 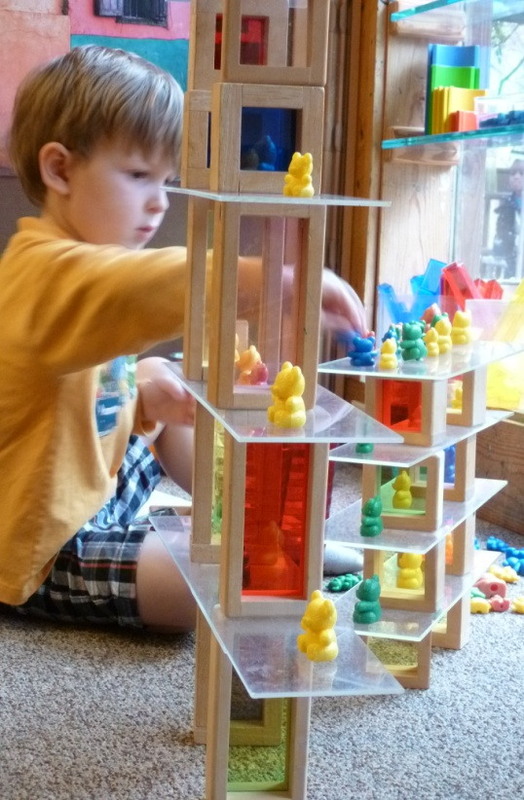 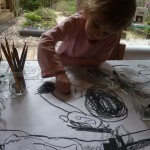 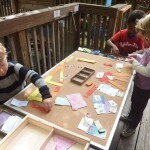 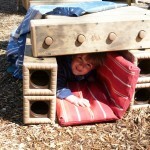 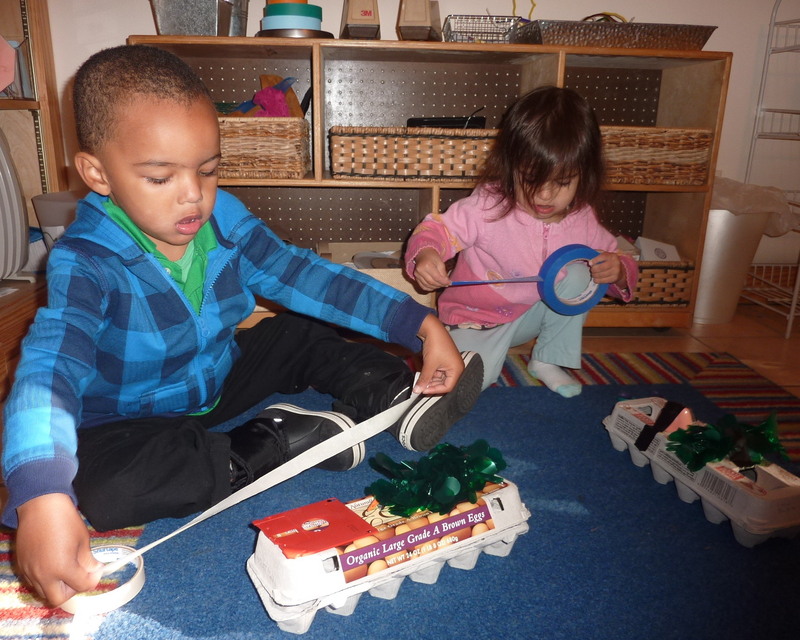 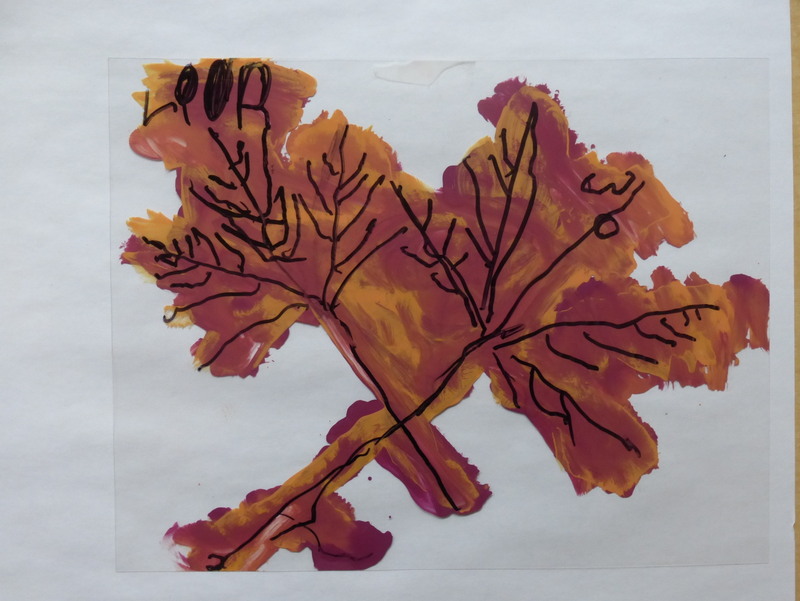 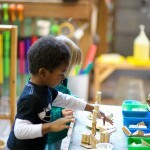 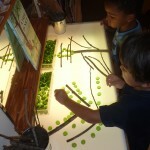 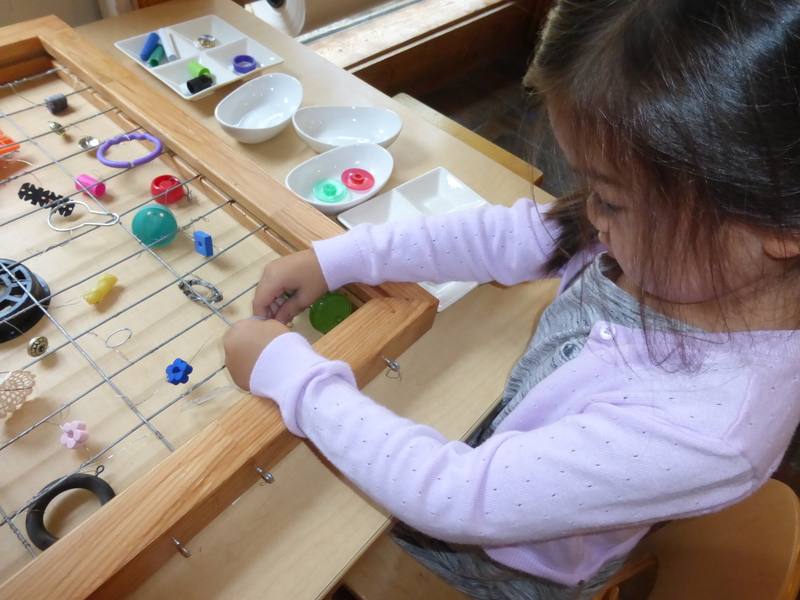 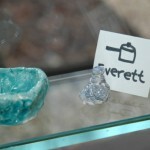 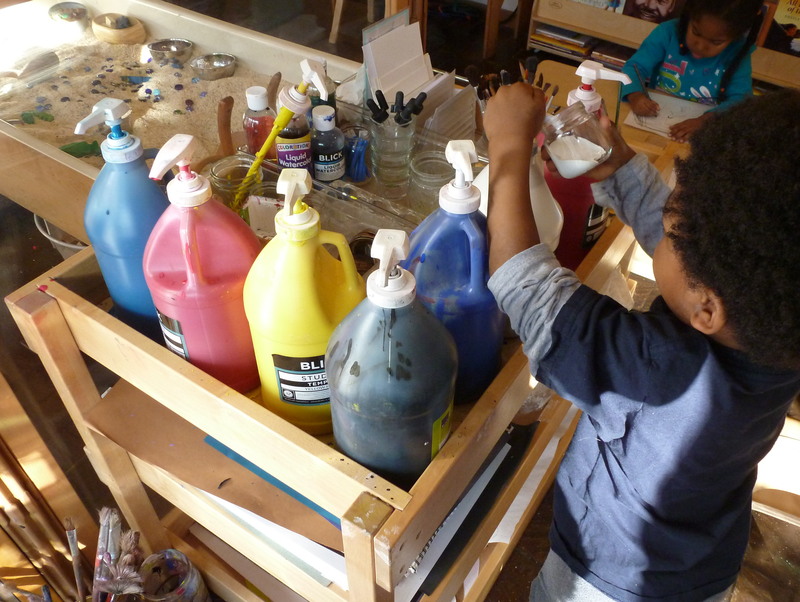 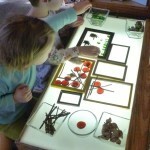 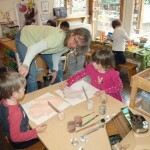 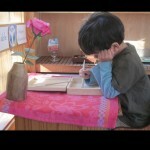 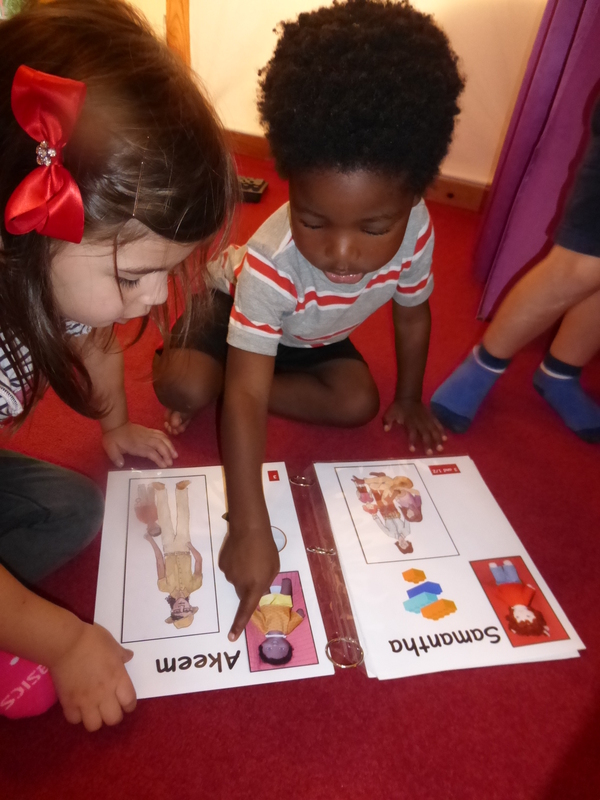 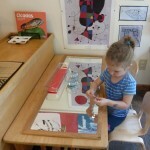 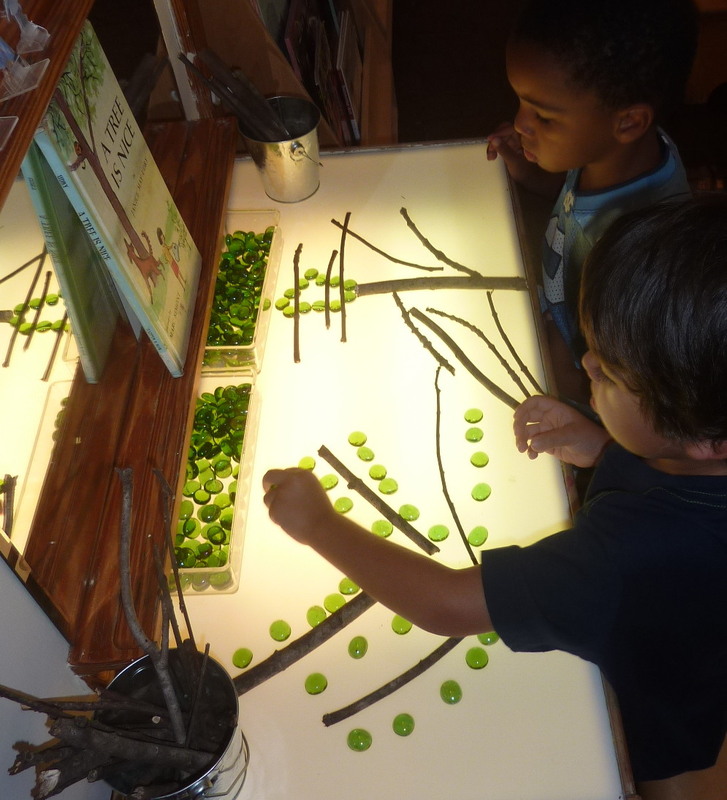 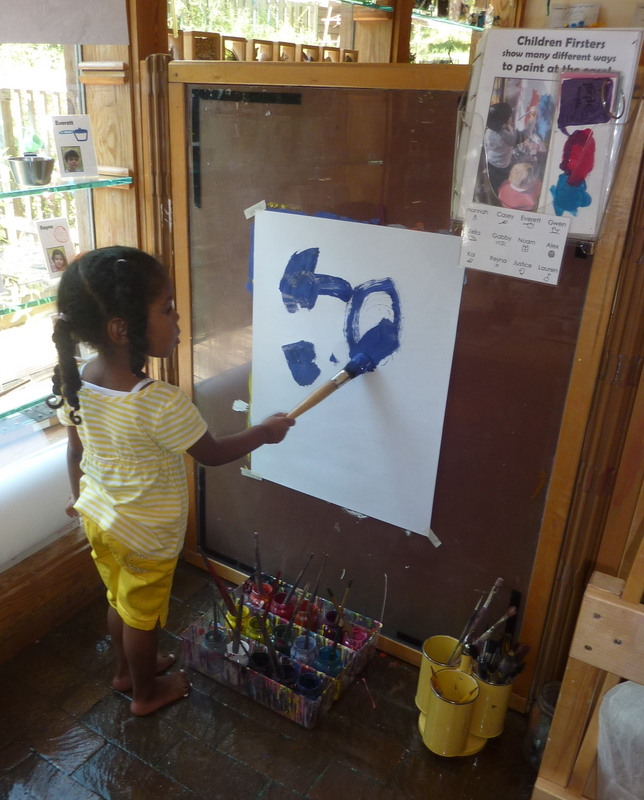 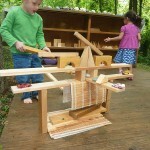 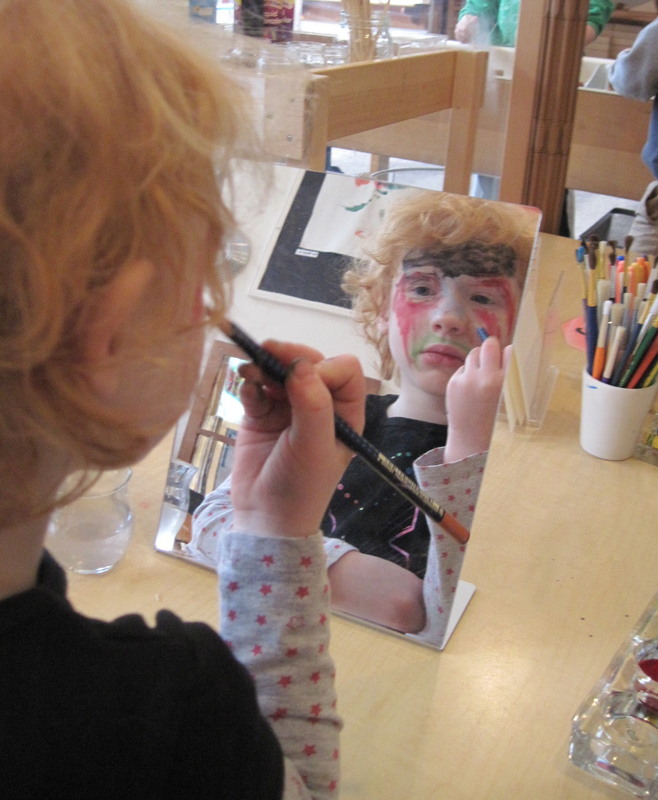 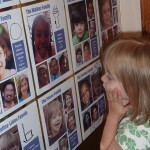 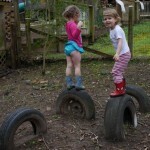 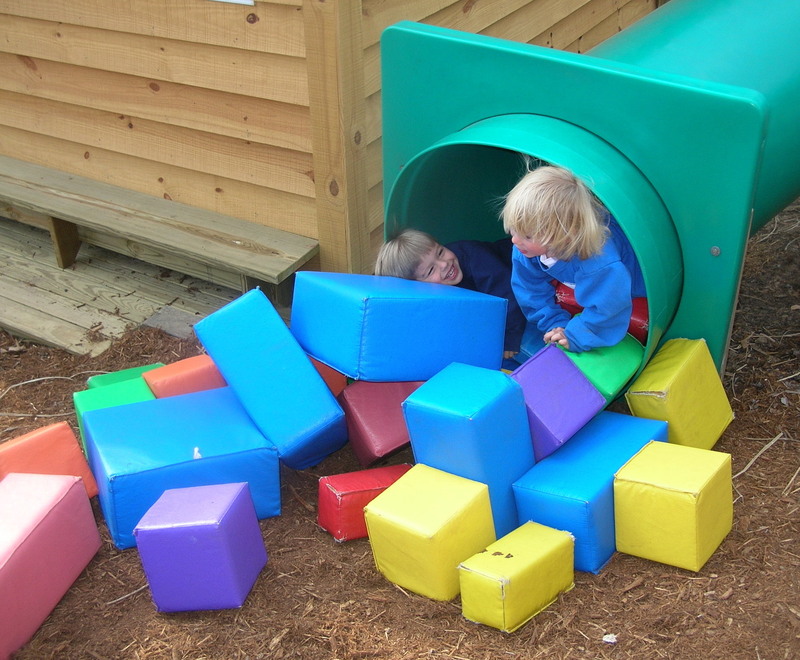 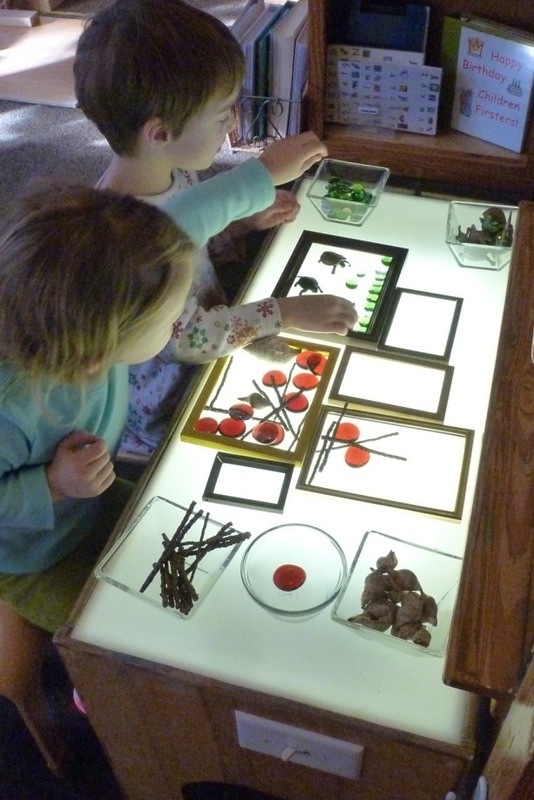 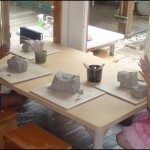 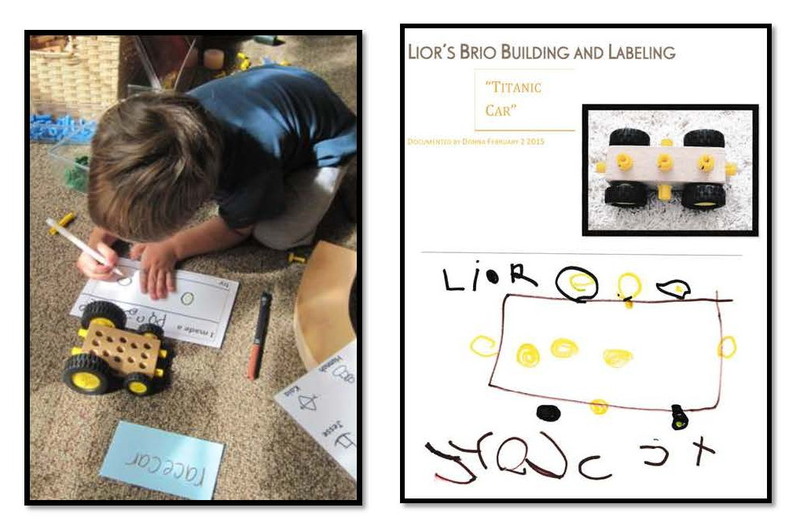 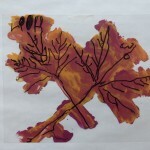 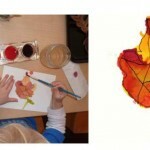 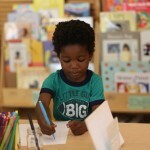 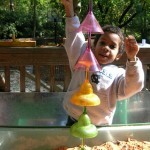 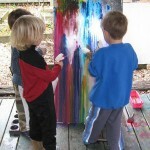 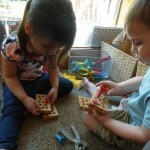 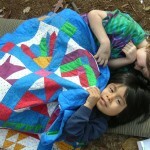 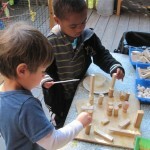 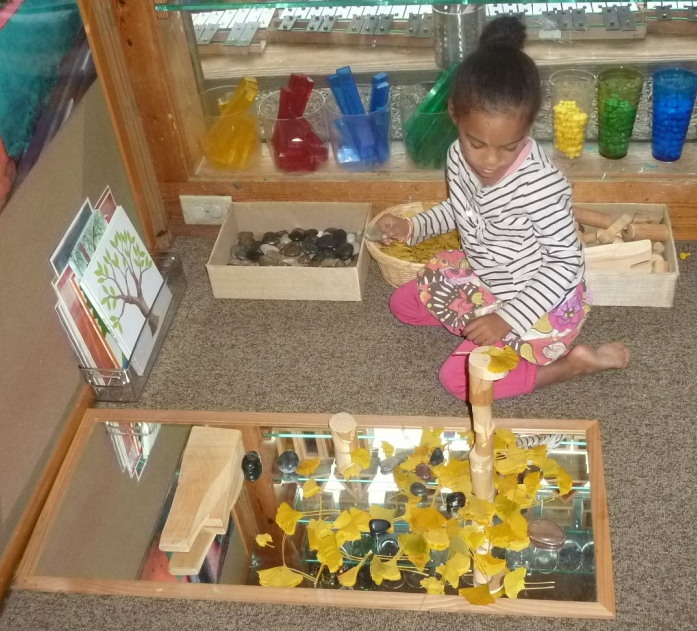 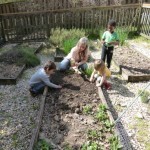 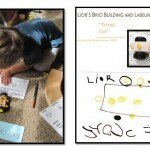 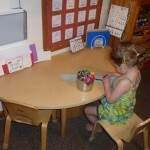 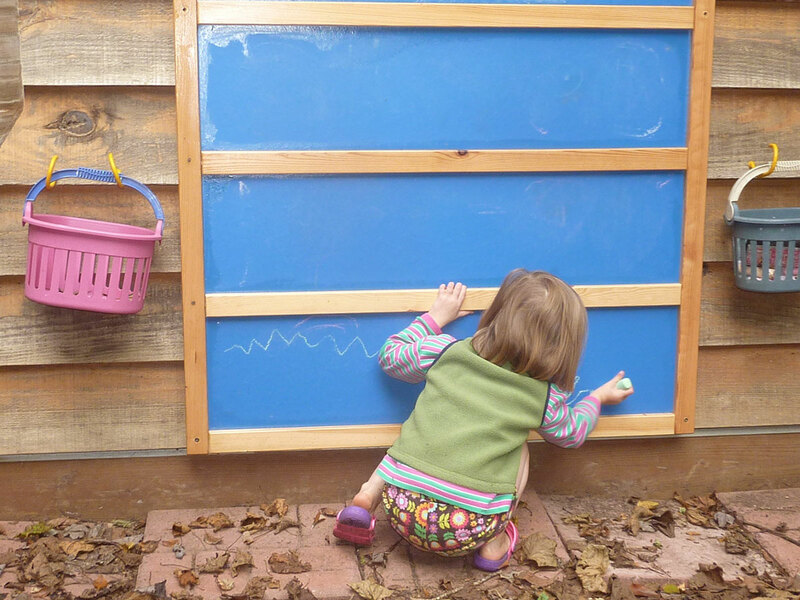 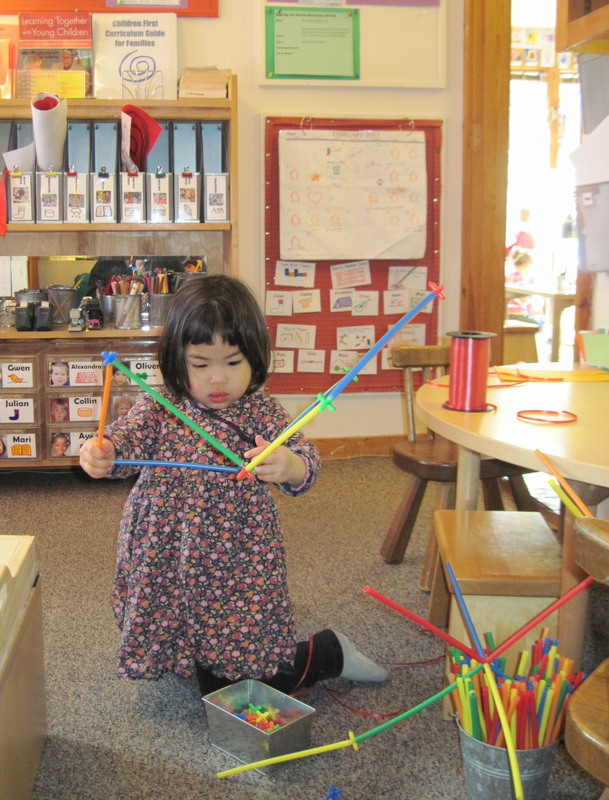 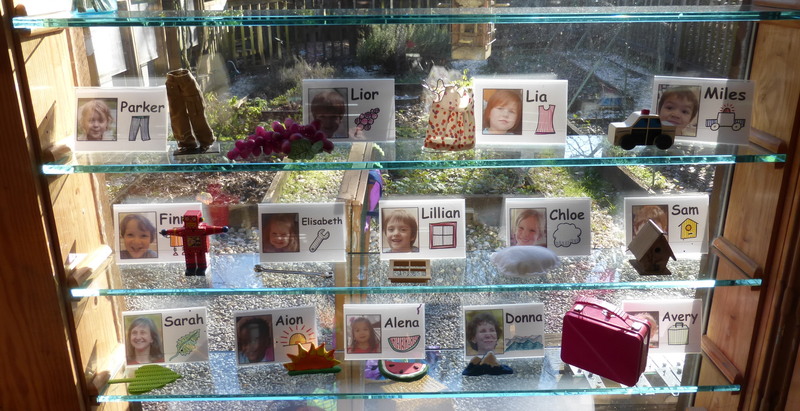 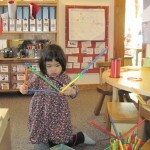 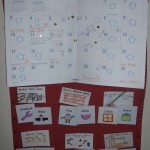 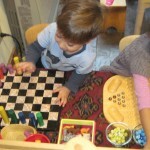 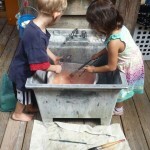 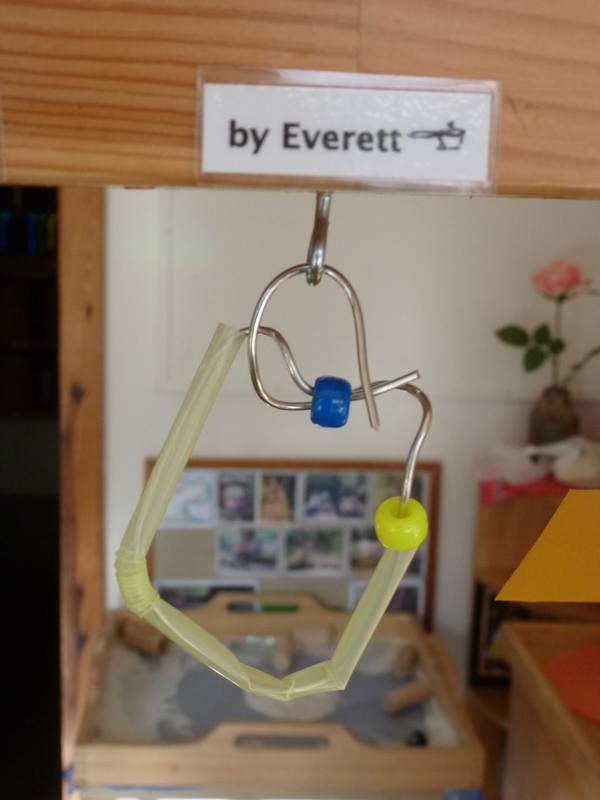 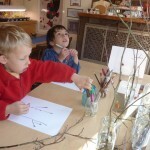 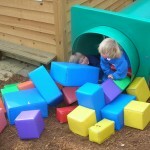 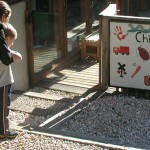 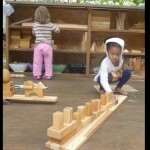 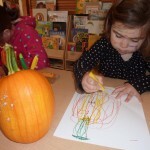 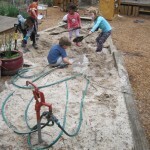 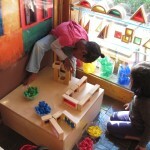 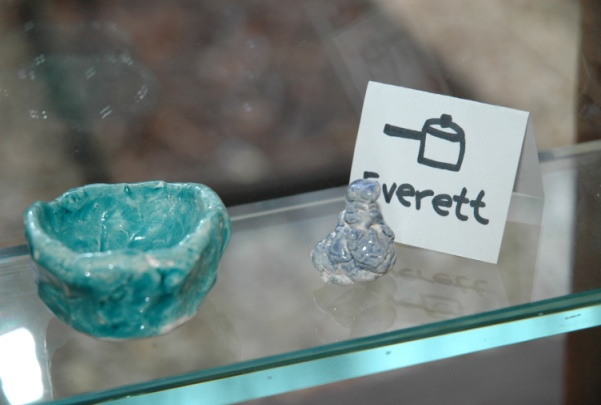 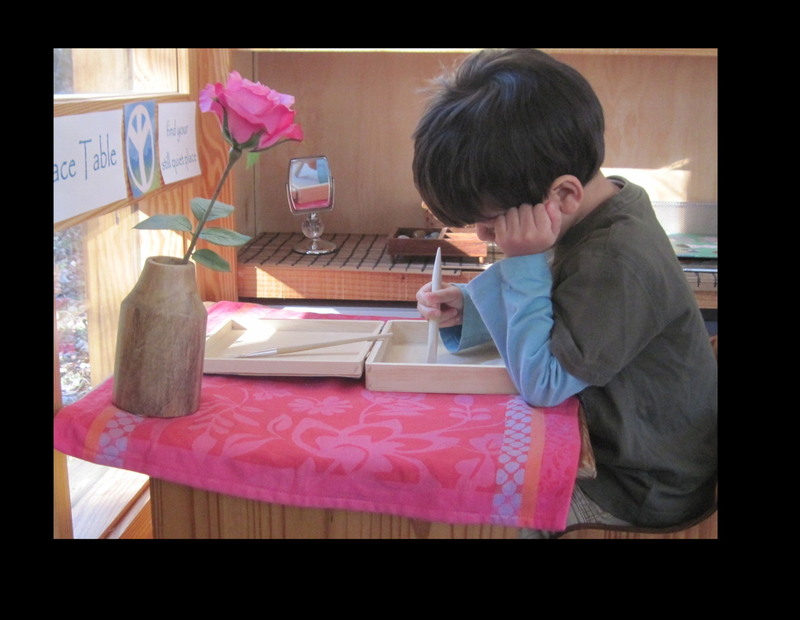 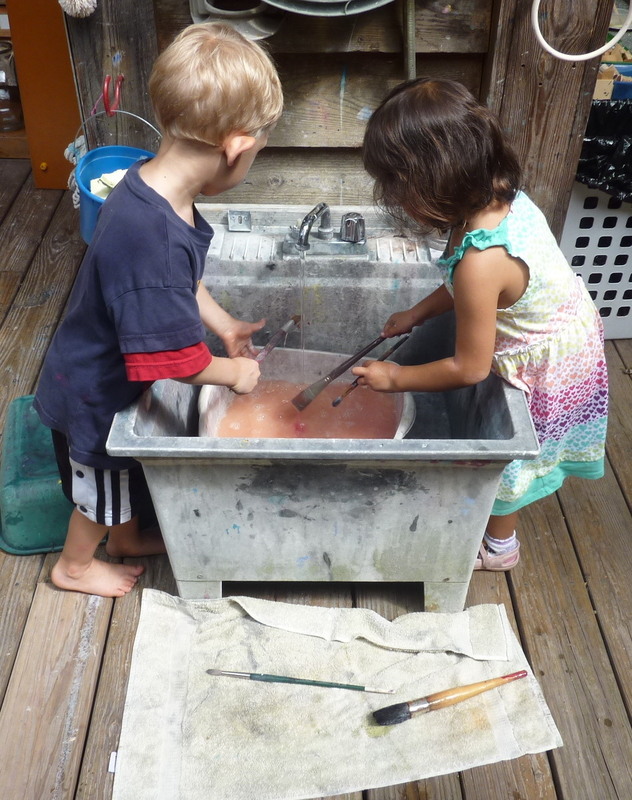 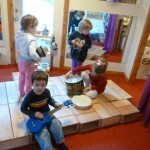 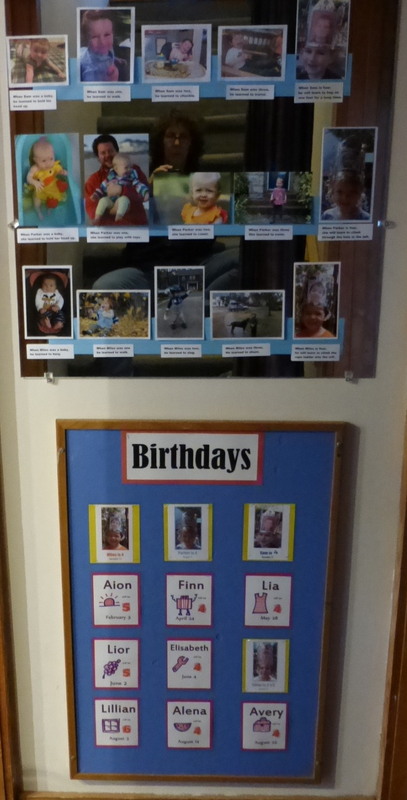 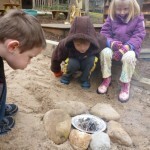 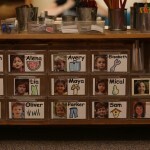 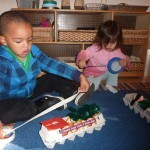 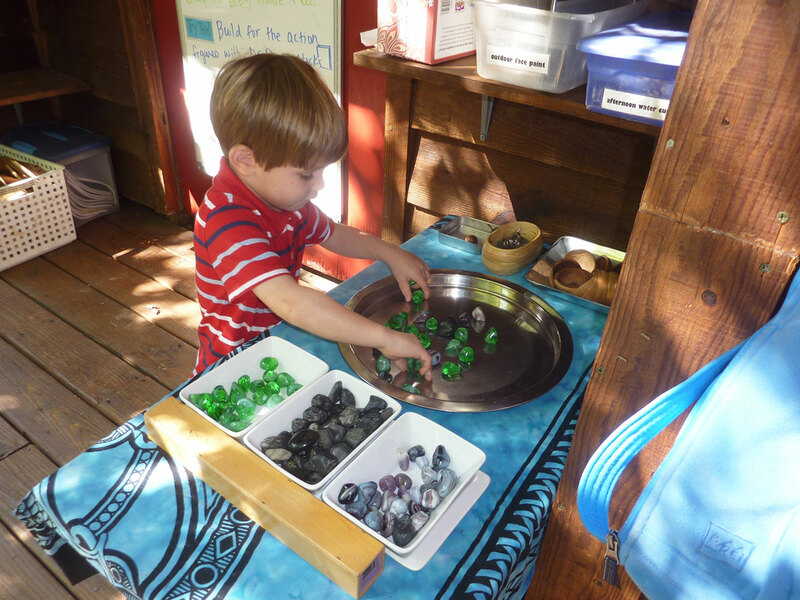 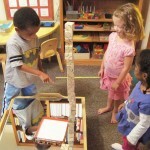 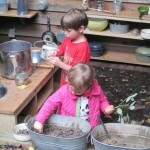 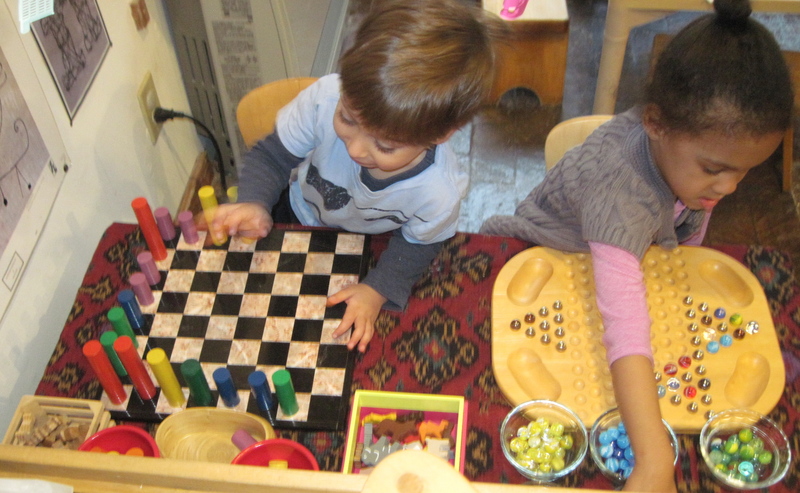 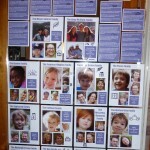 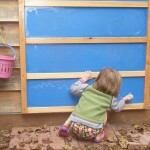 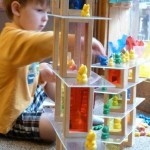 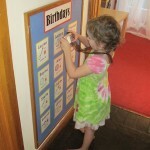 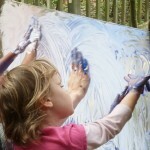 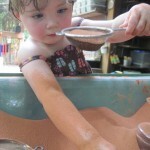 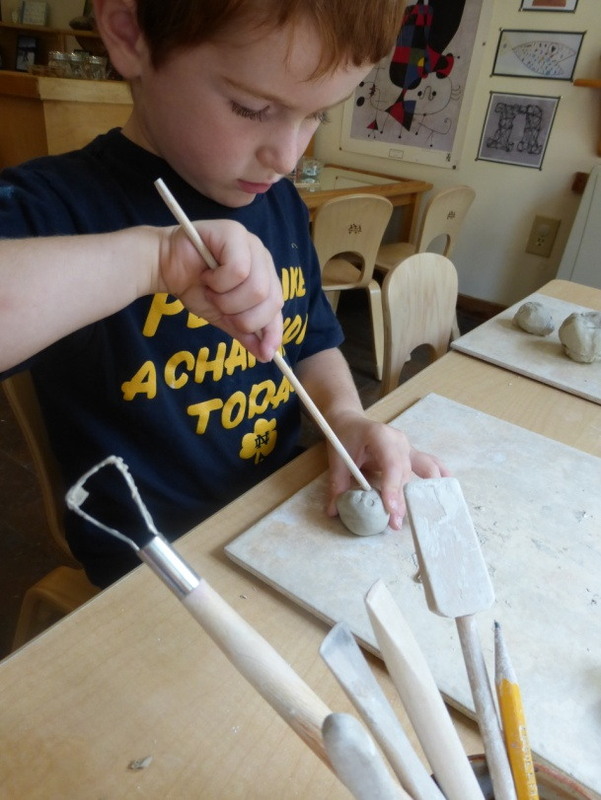 children being able to help themselves to a rich variety of responsive, open-ended materials. 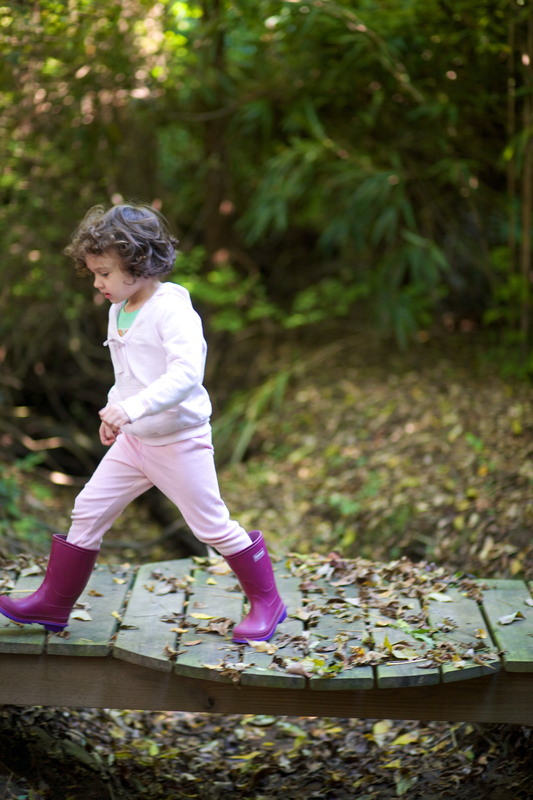 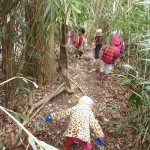 We believe that children want to and should be outdoors a lot every day. 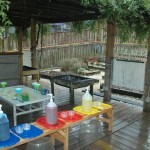 We also believe that outdoor time should offer just as many interesting options for work and play as indoor time. 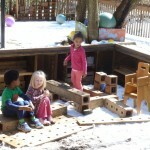 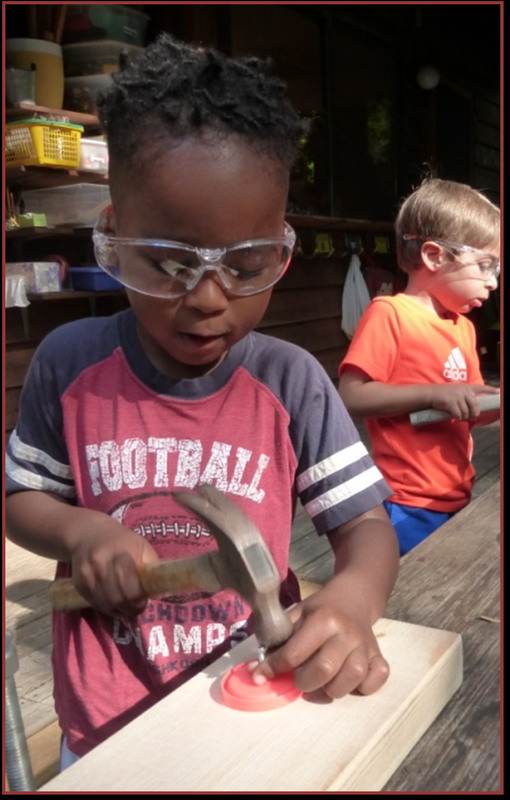 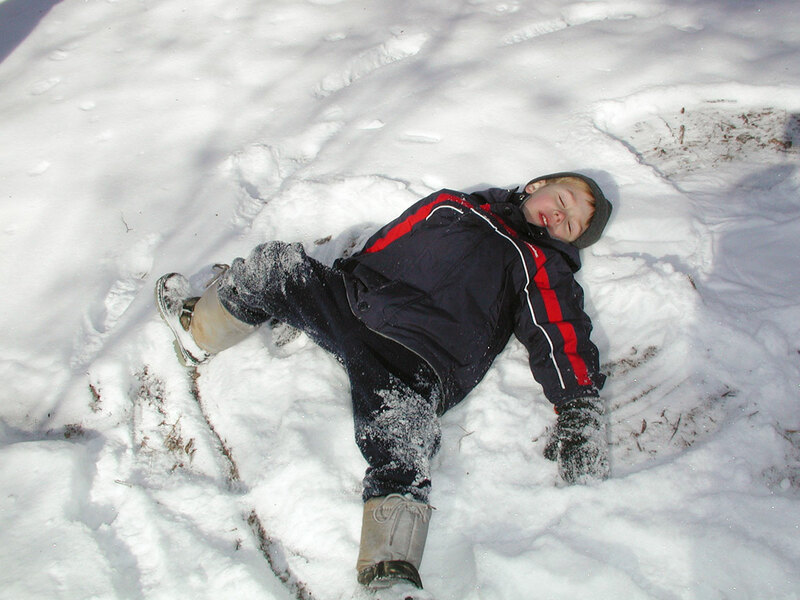 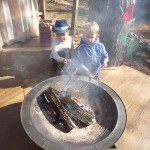 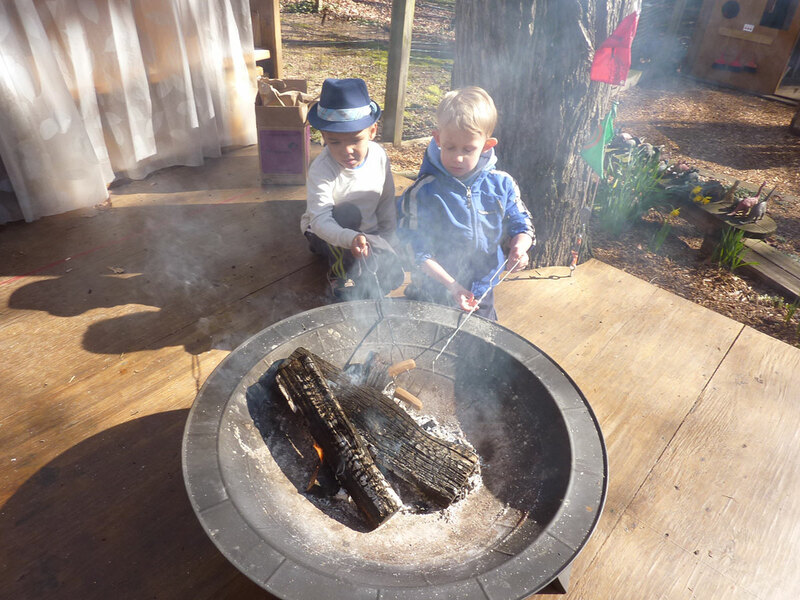 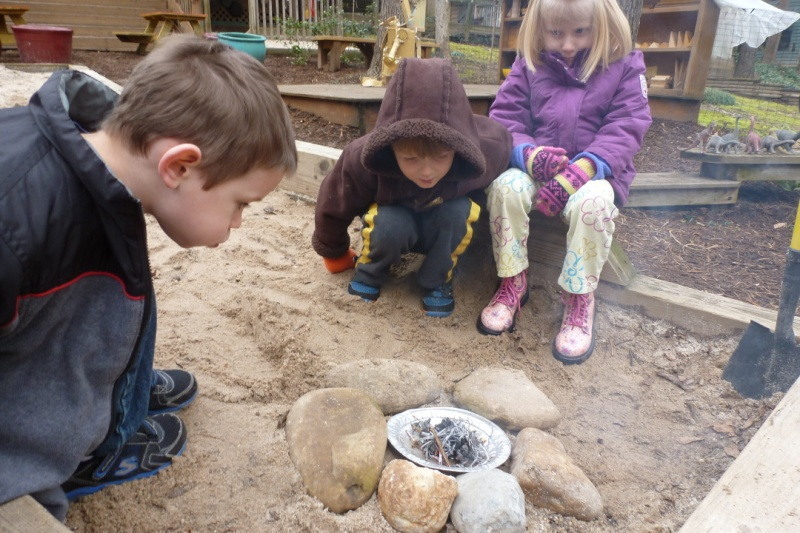 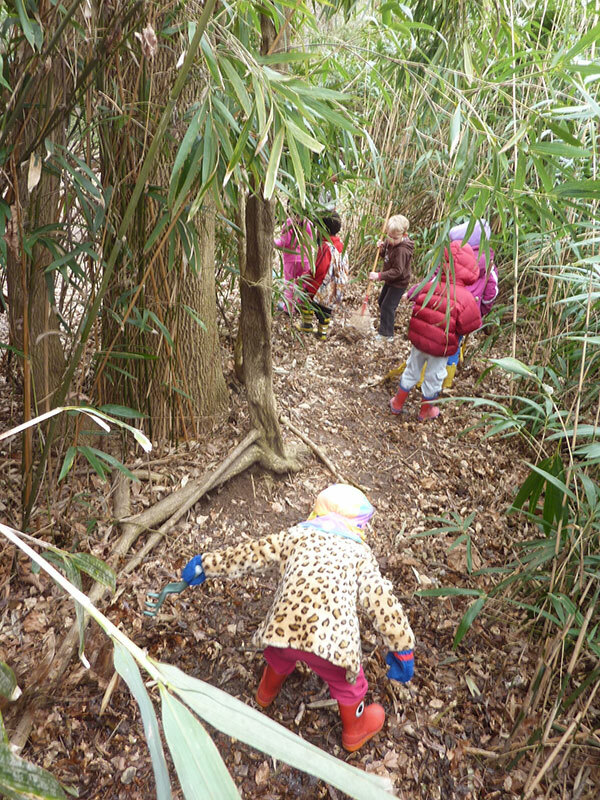 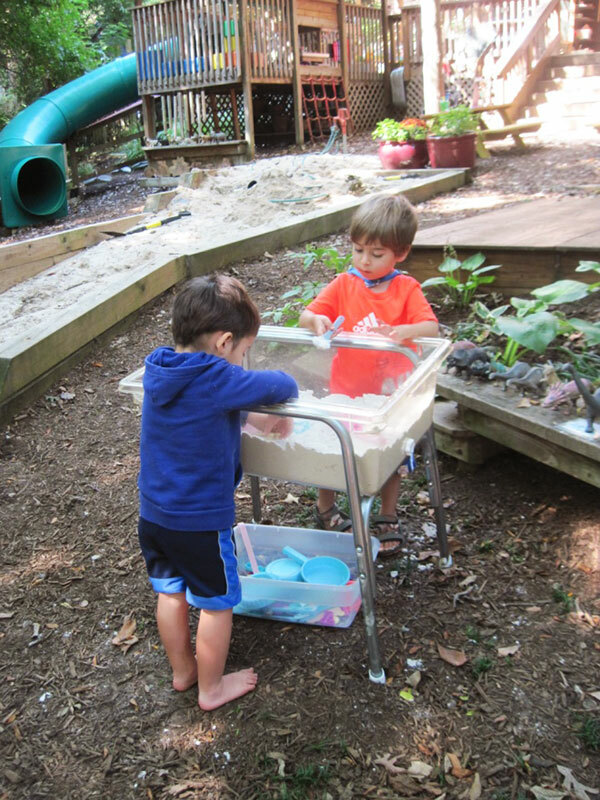 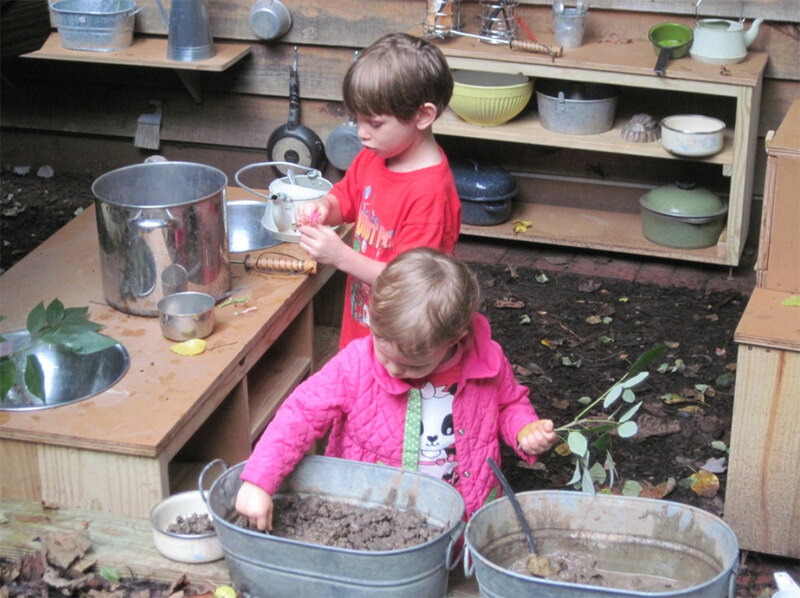 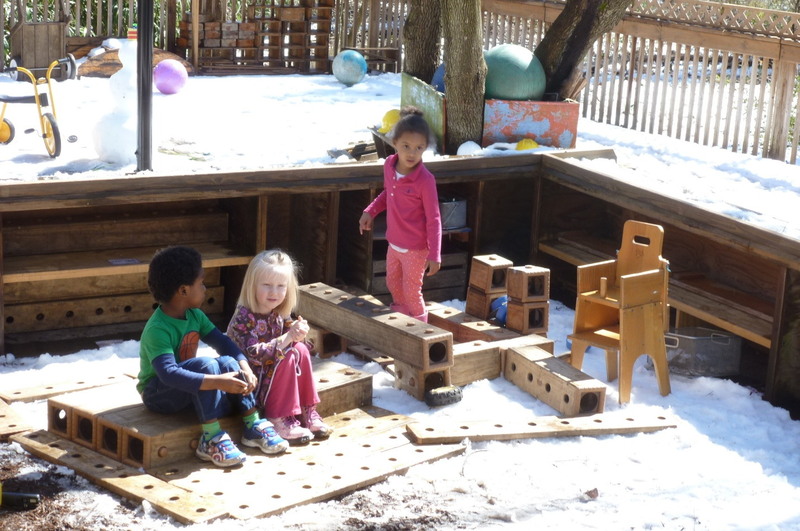 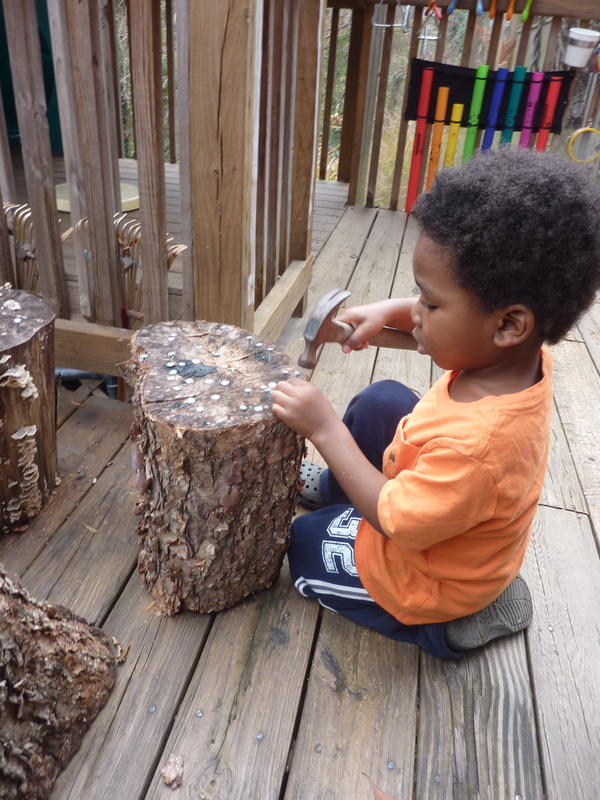 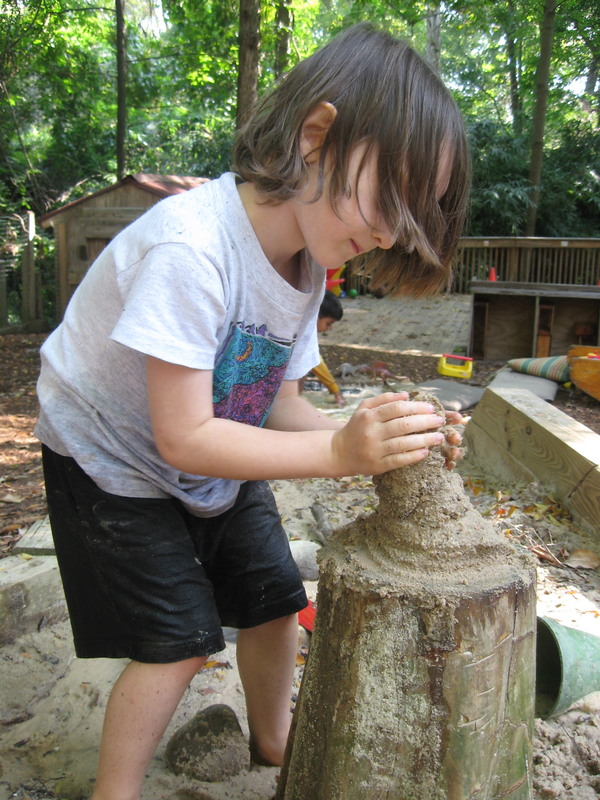 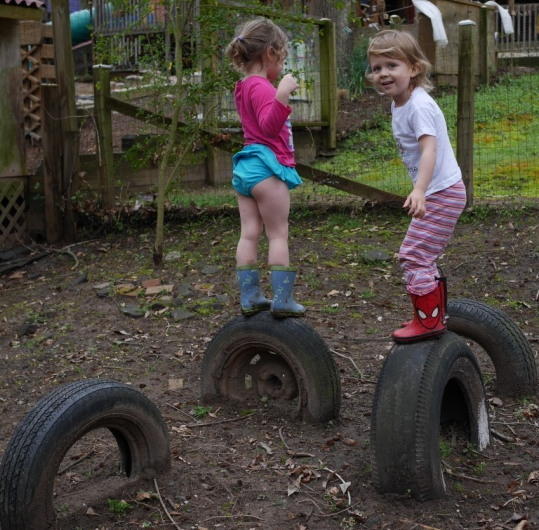 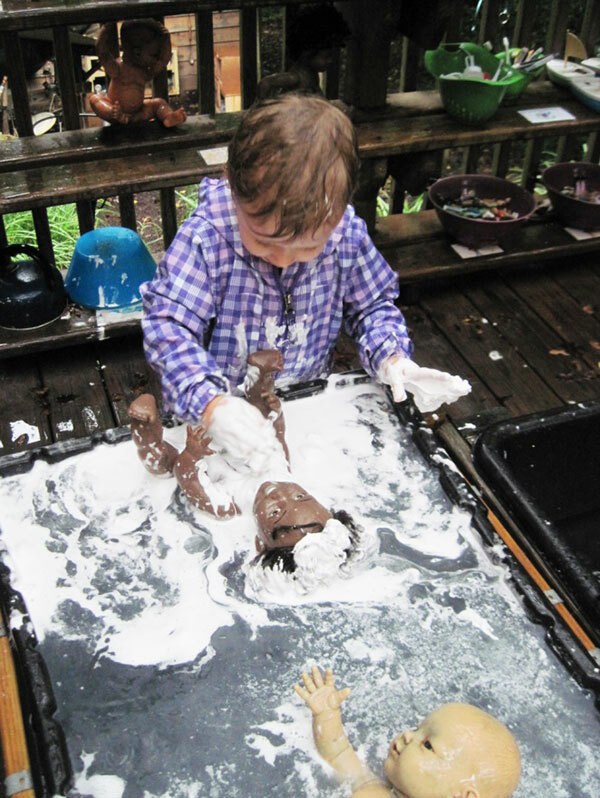 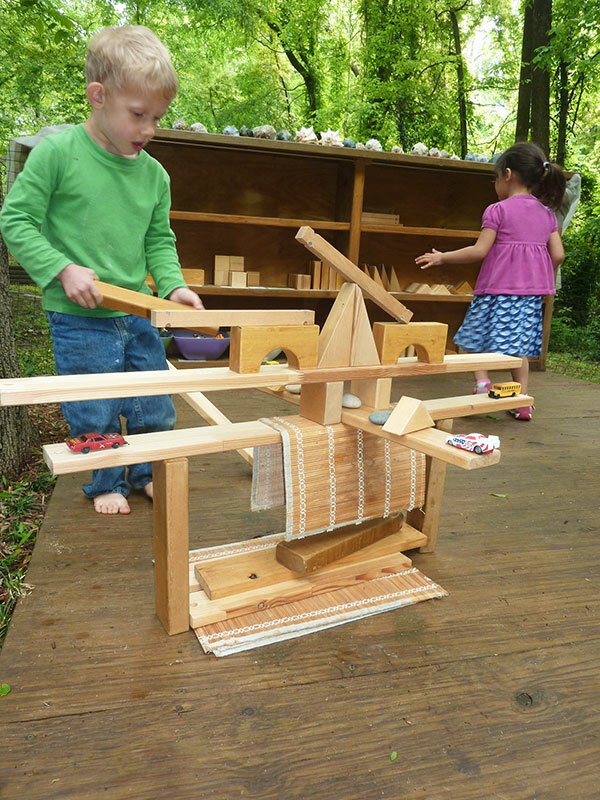 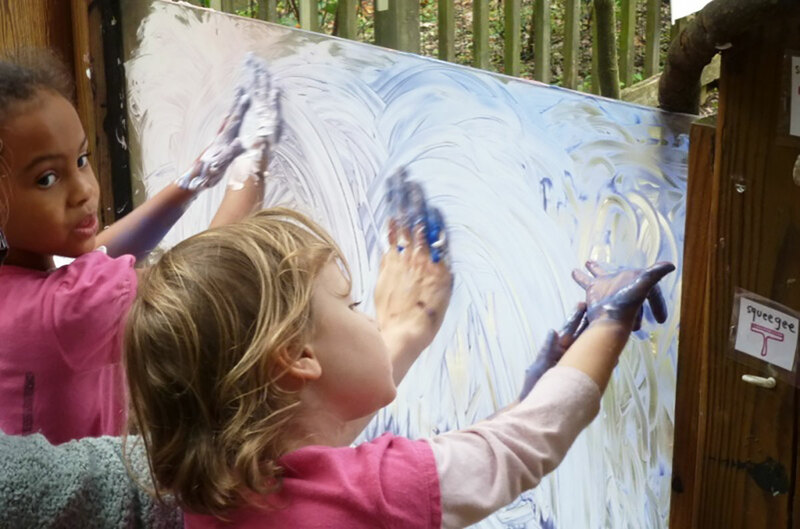 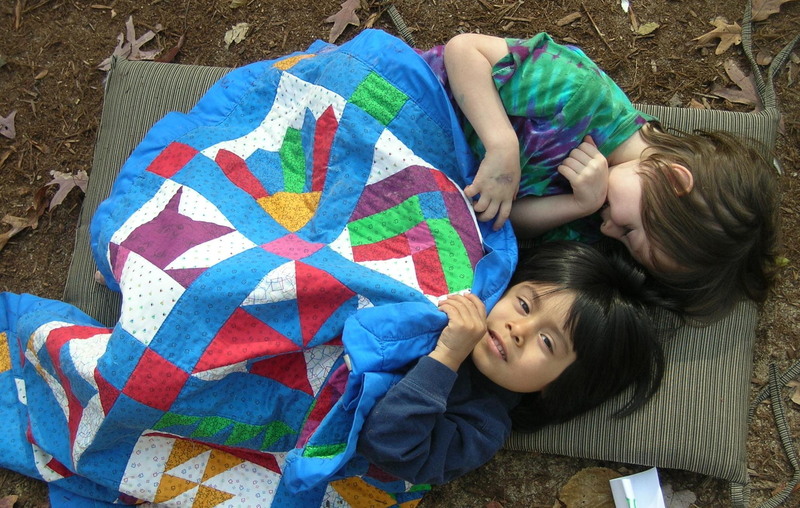 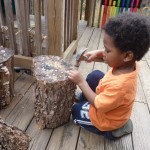 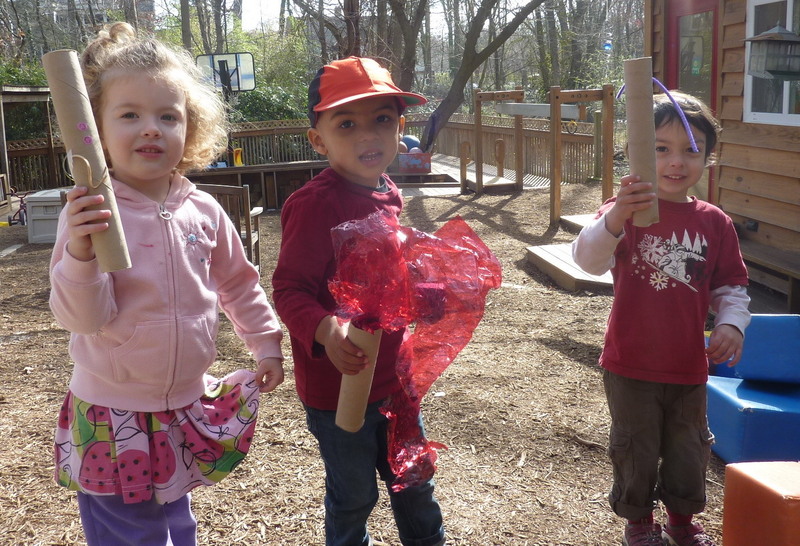 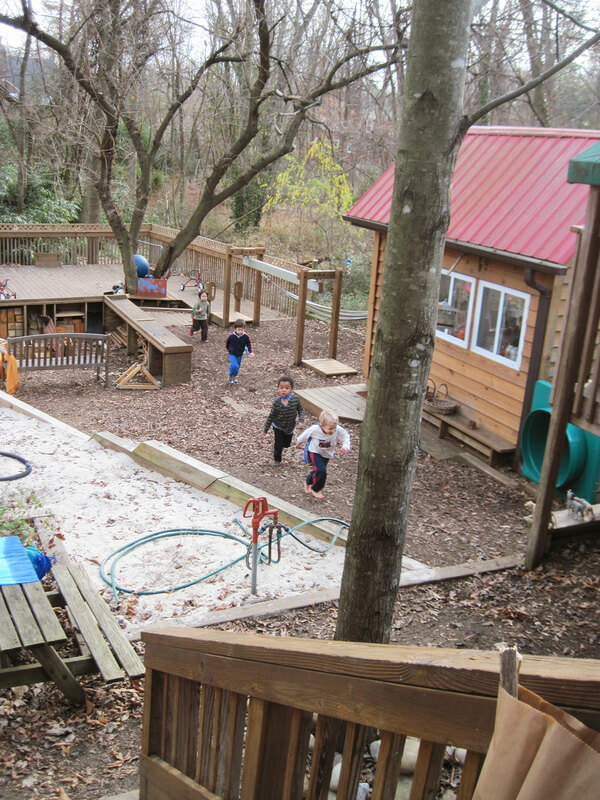 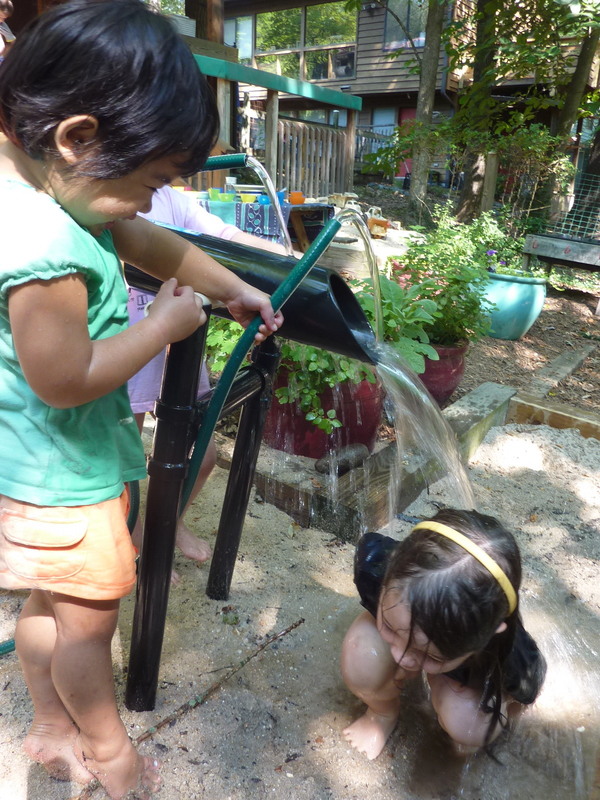 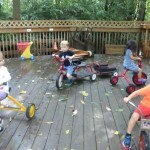 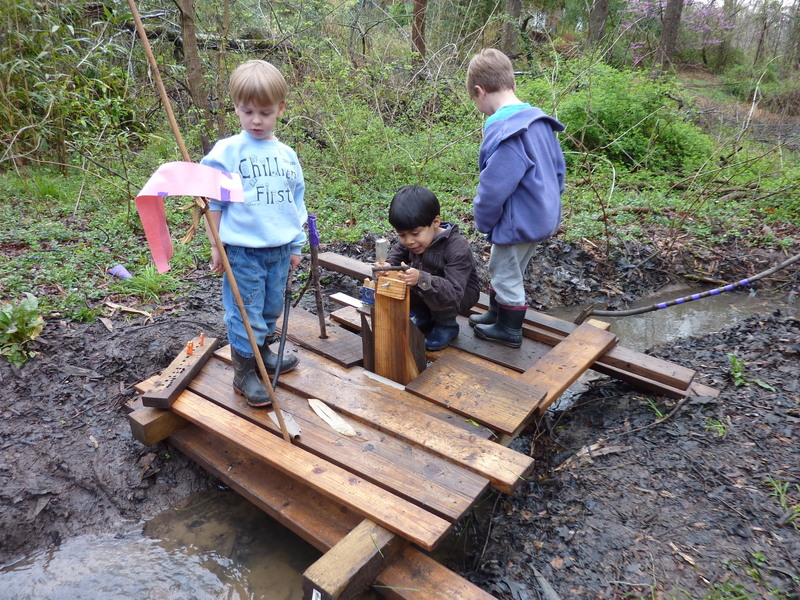 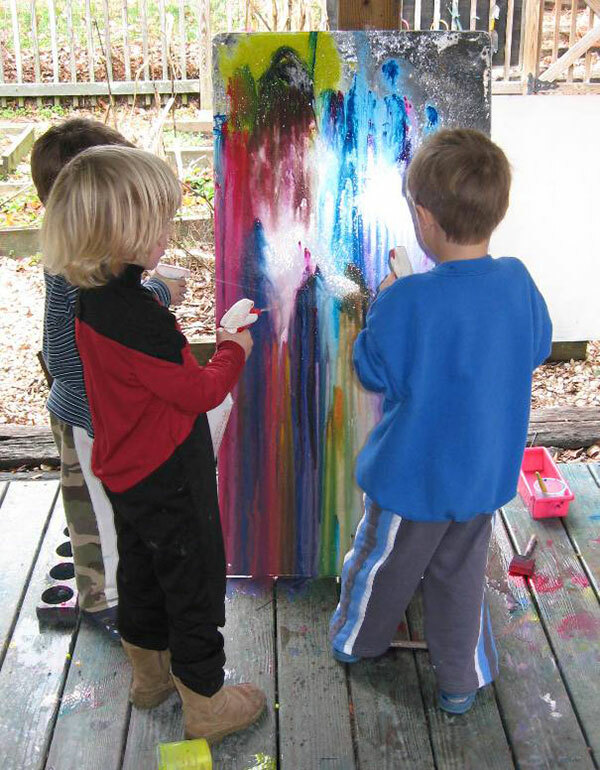 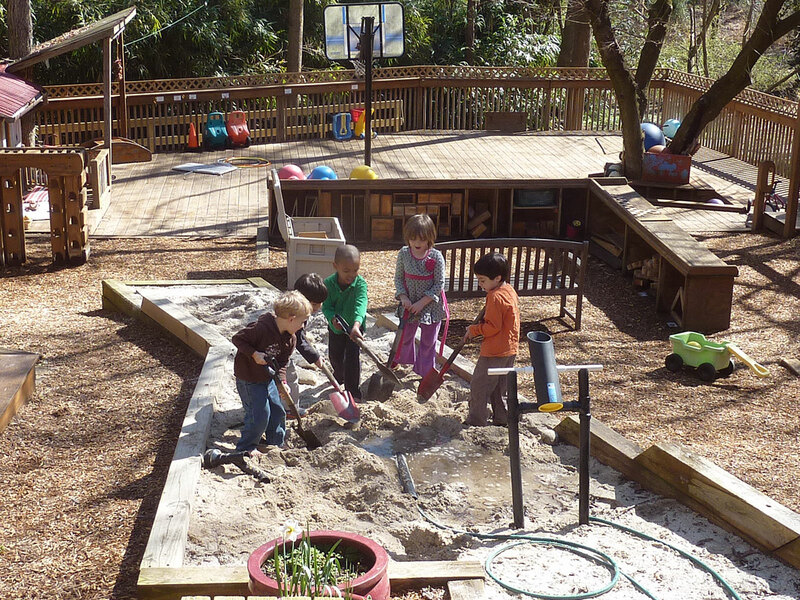 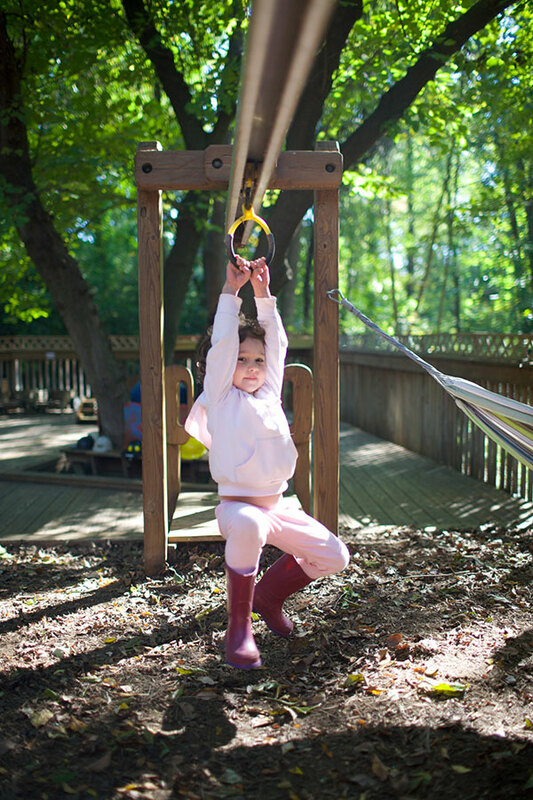 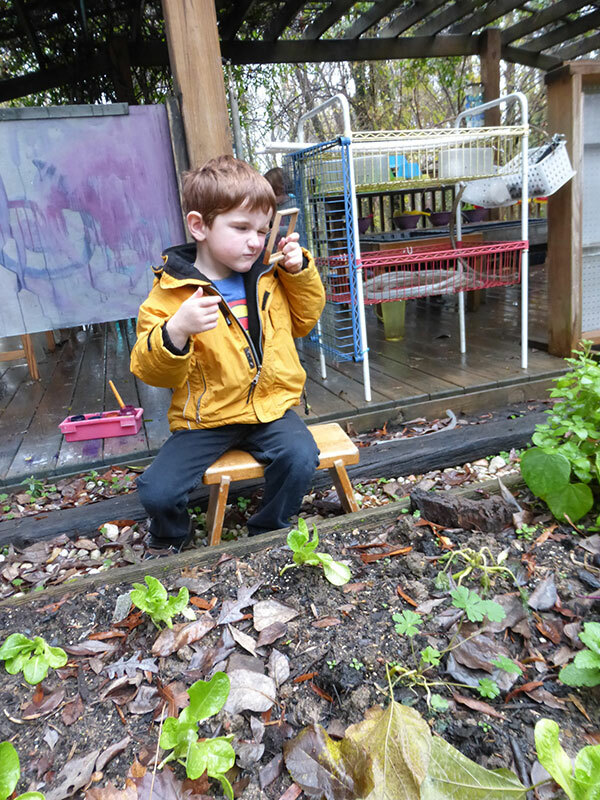 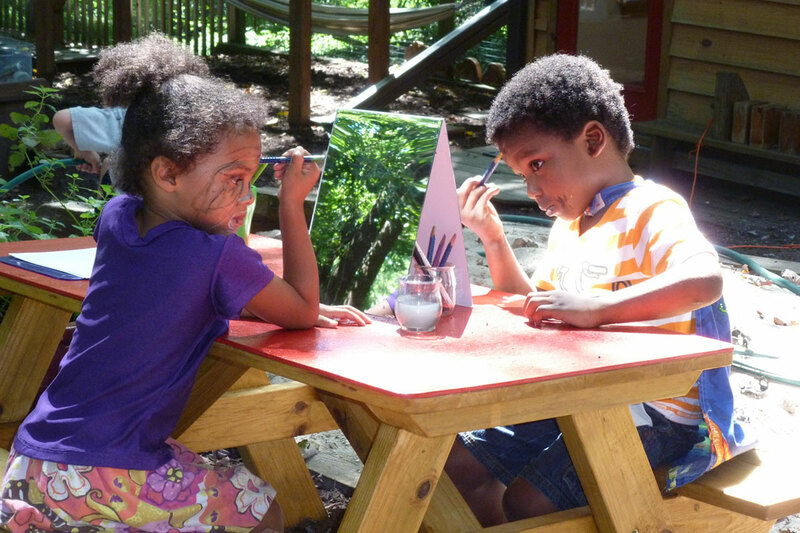 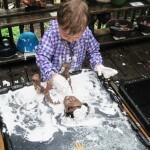 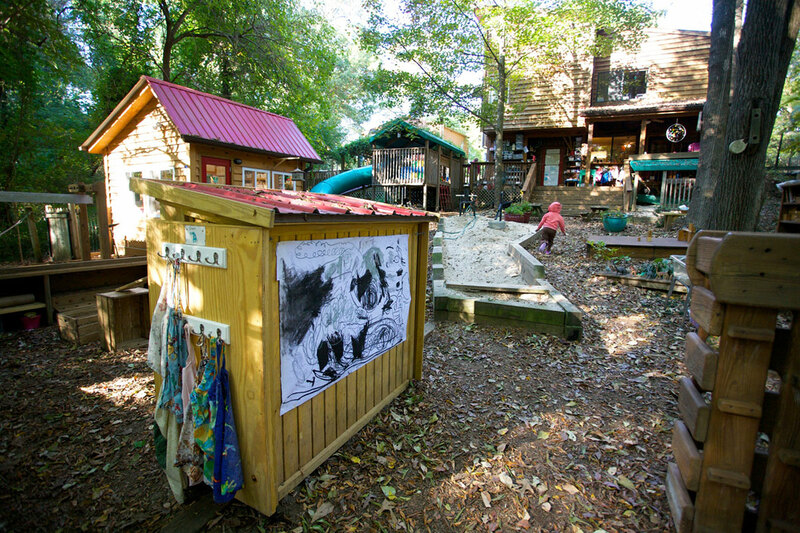 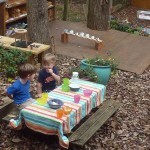 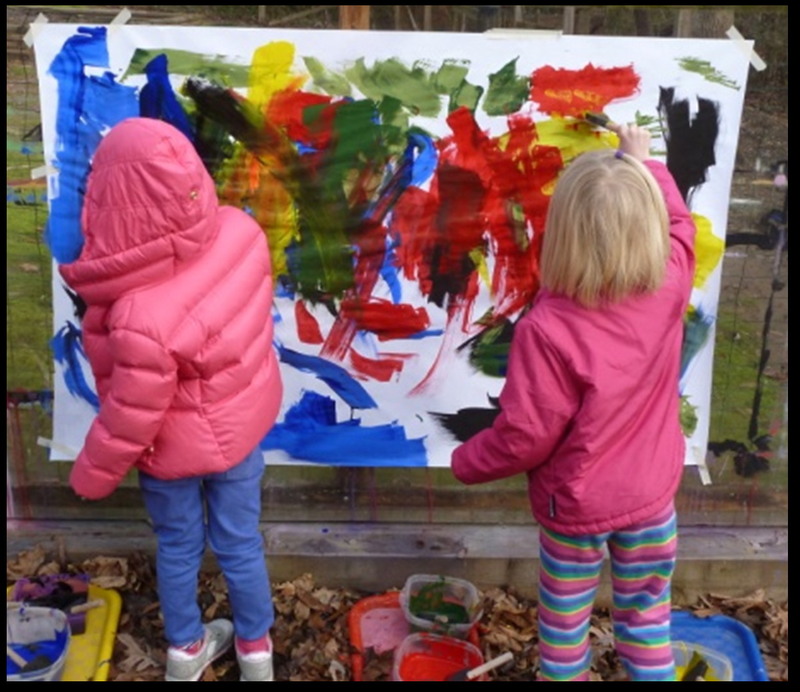 In fact, we believe all the important things that happen indoors—pretending, building, painting, making music, dancing, reading books, sensory play, working with teachers, and so much more—can happen outdoors as well. 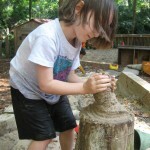 Even better, when those things happen outdoors, they can happen in the wilder, louder, messier way that is natural to children. 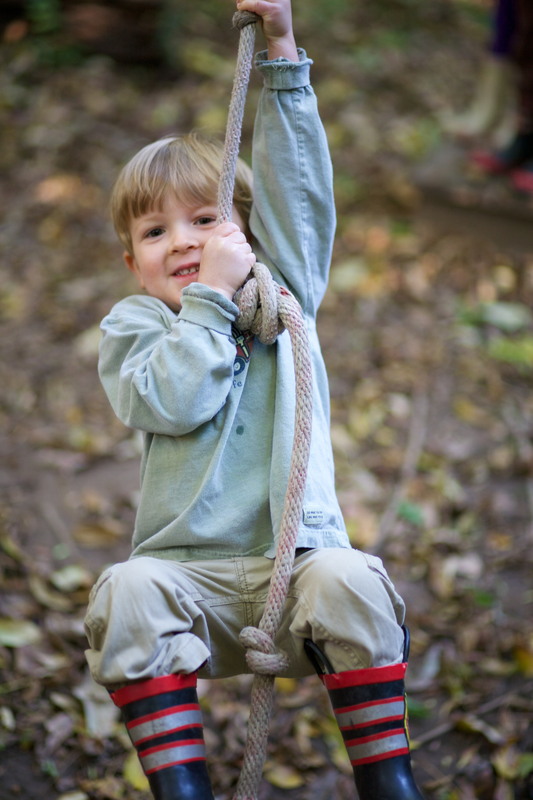 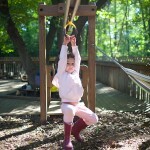 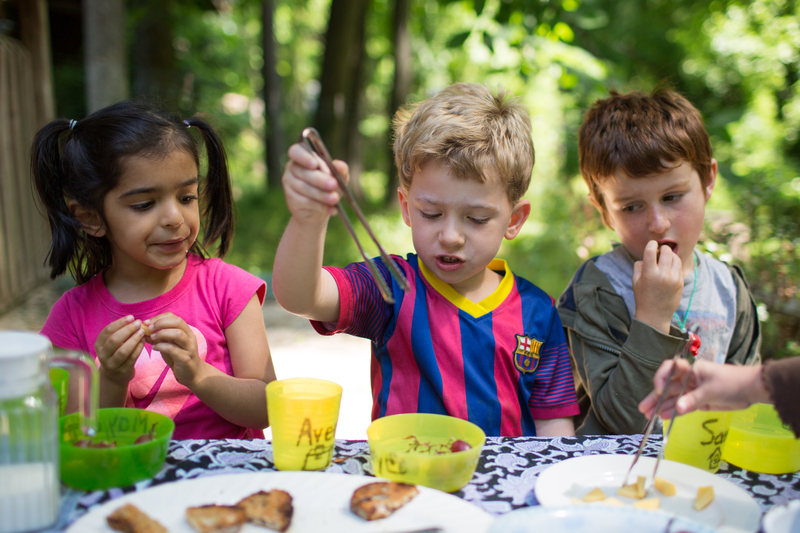 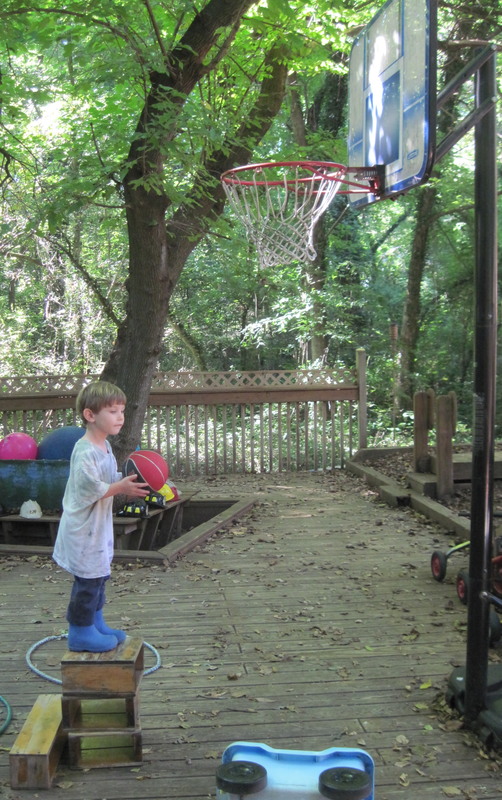 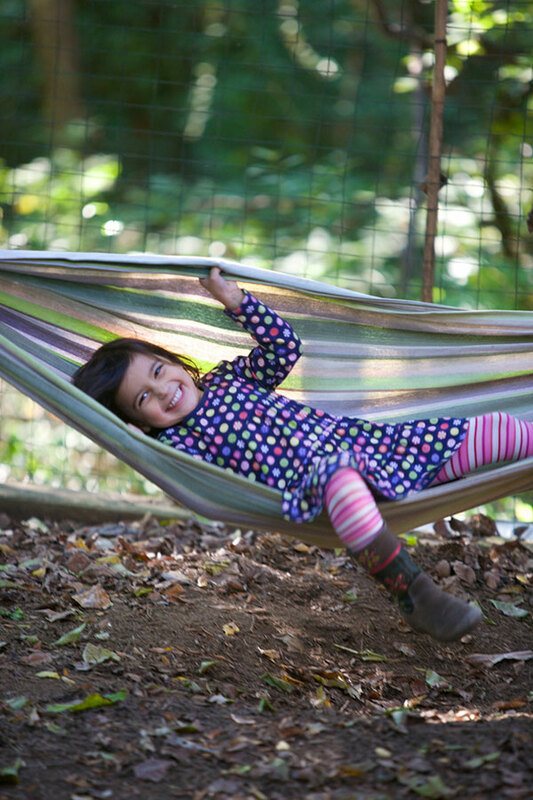 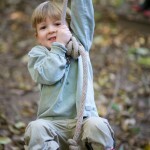 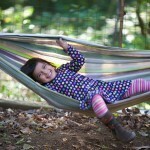 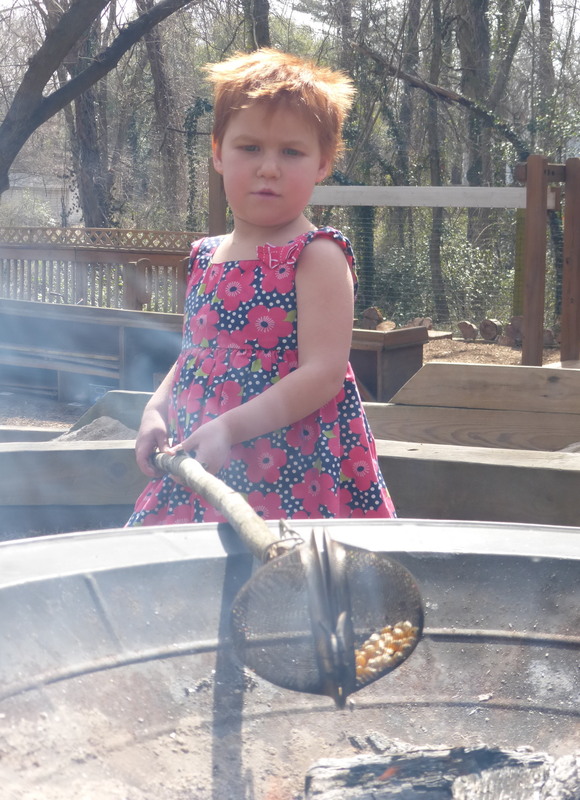 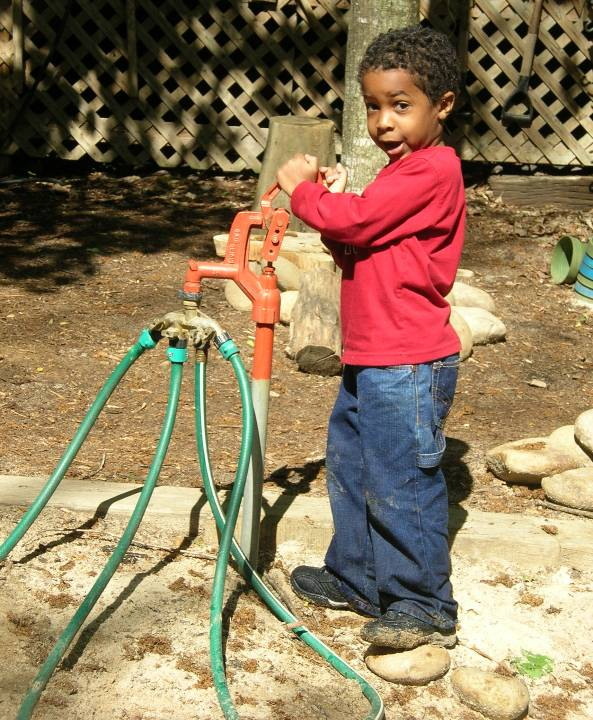 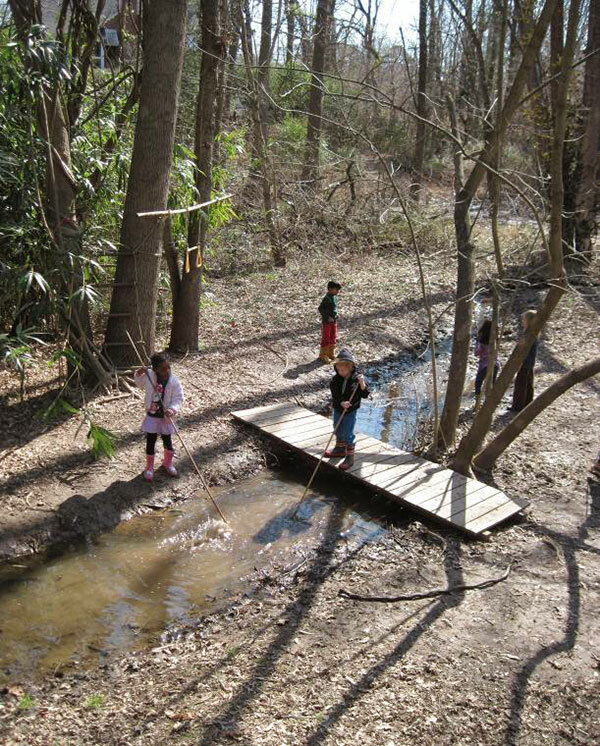 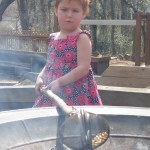 Outdoors is full of YES, and we think children need a high ratio of Yes to No in their lives. 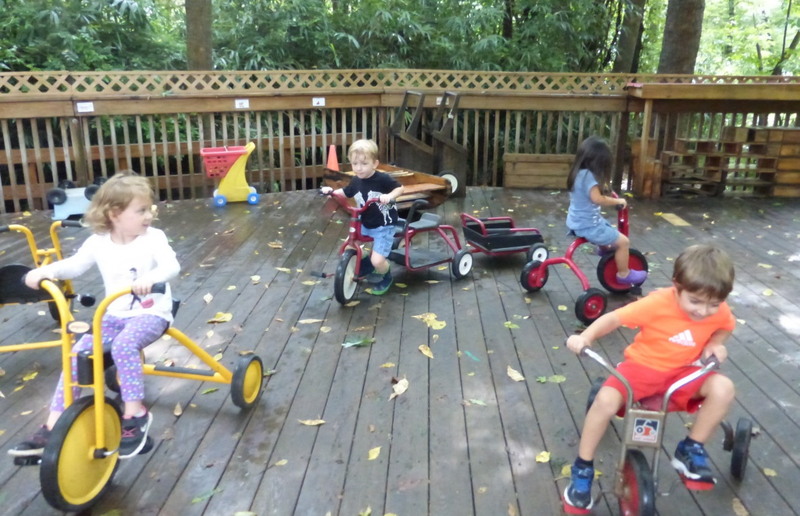 The Bike Deck—an expansive deck for wheel toys and ball play. 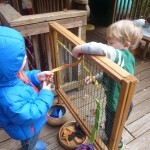 The Climbing Arch and the “Busy Dizzy Deck”—both climbing structures, one with a big green tube slide. 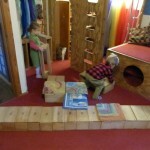 Big Blocks—a large area for building with a set of interlocking Outlast Blocks. 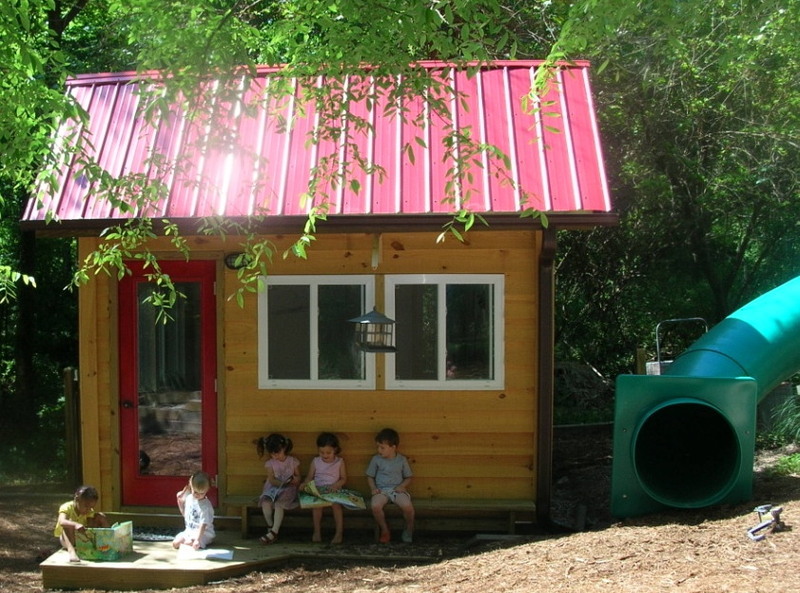 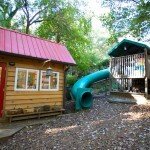 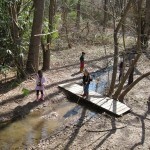 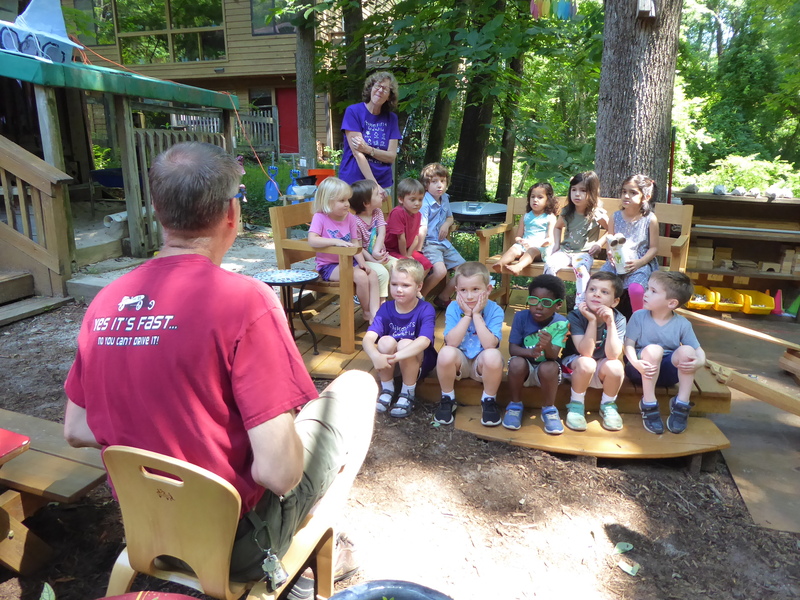 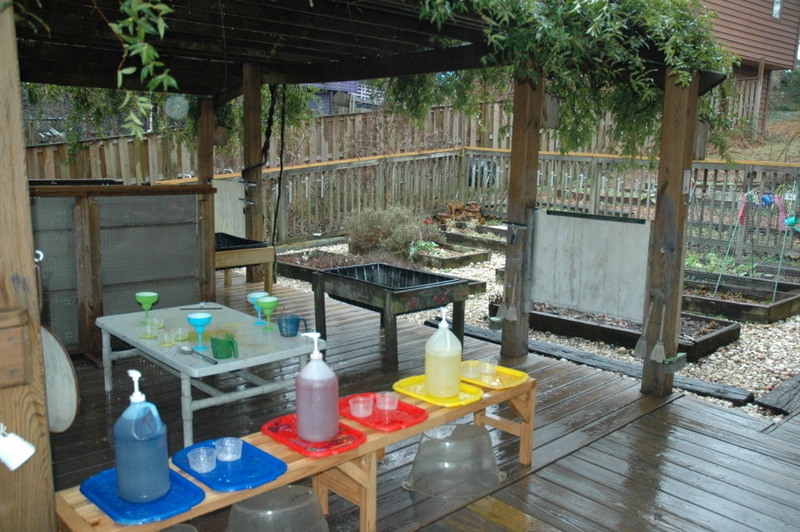 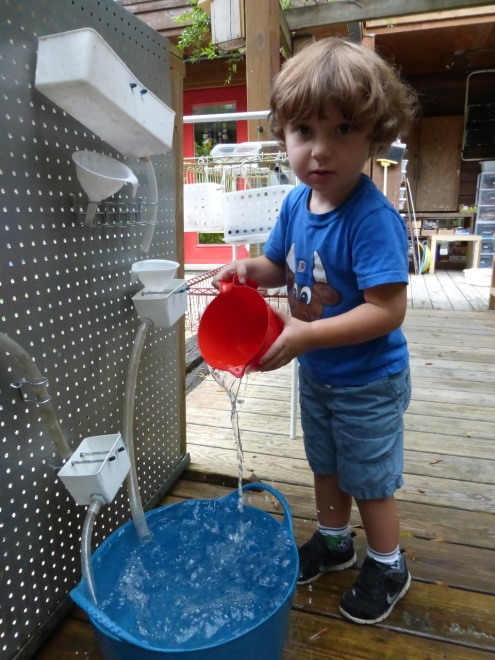 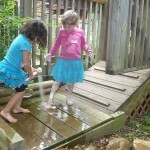 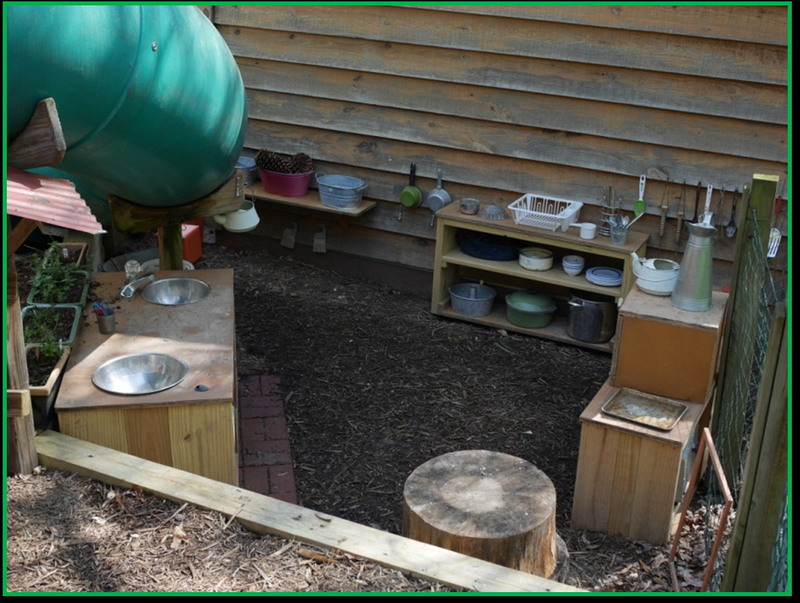 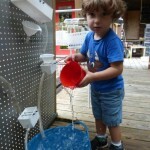 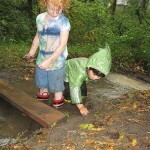 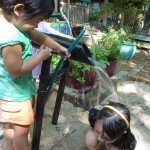 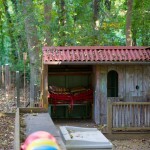 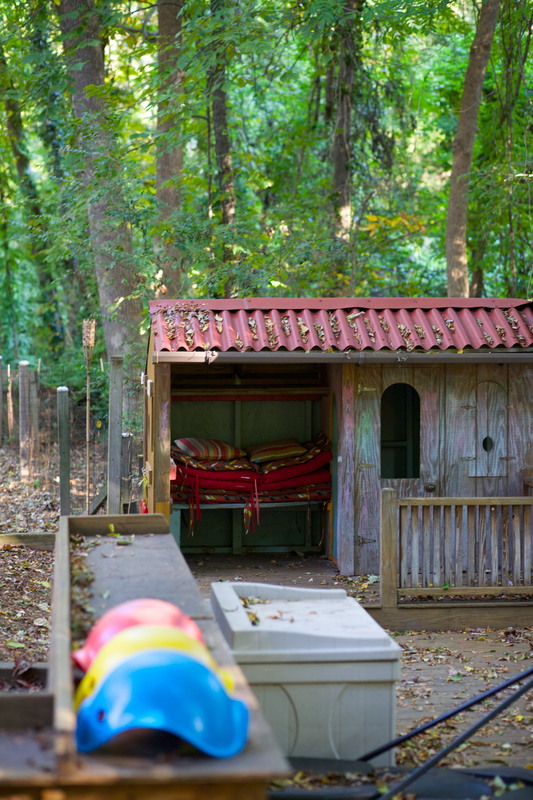 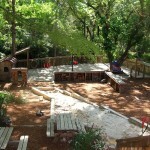 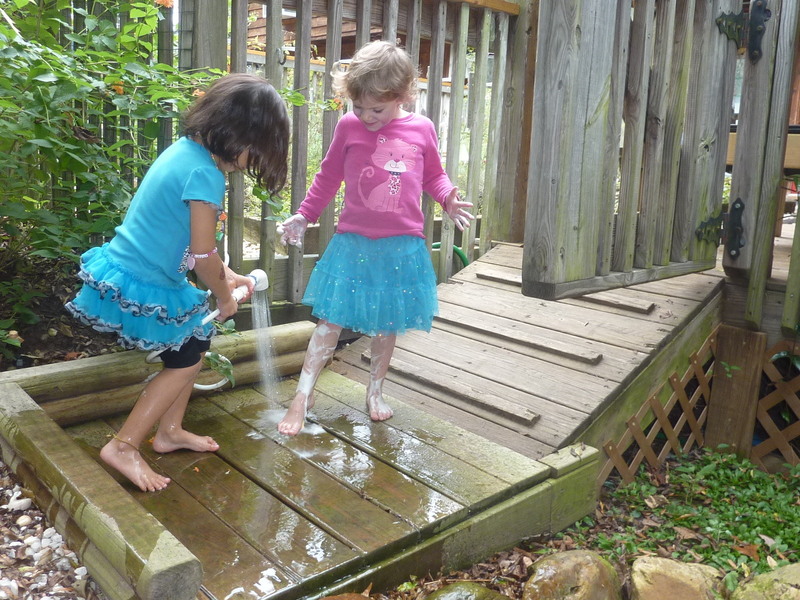 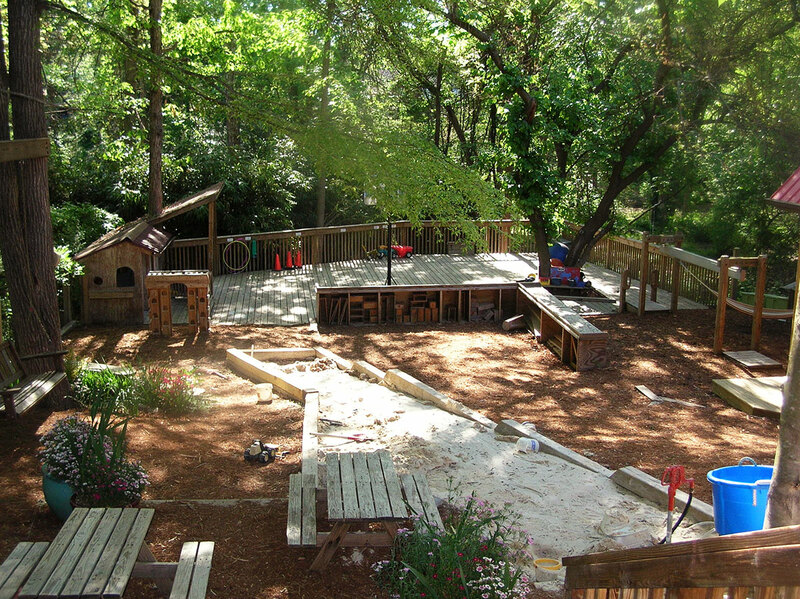 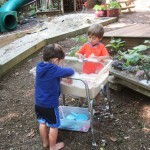 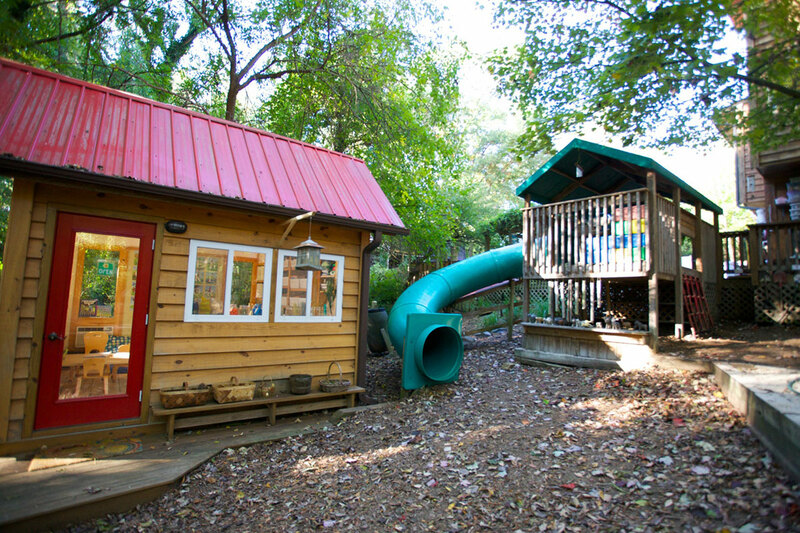 The Water Deck—sheltered by an arbor and outfitted for sensory play and water science. 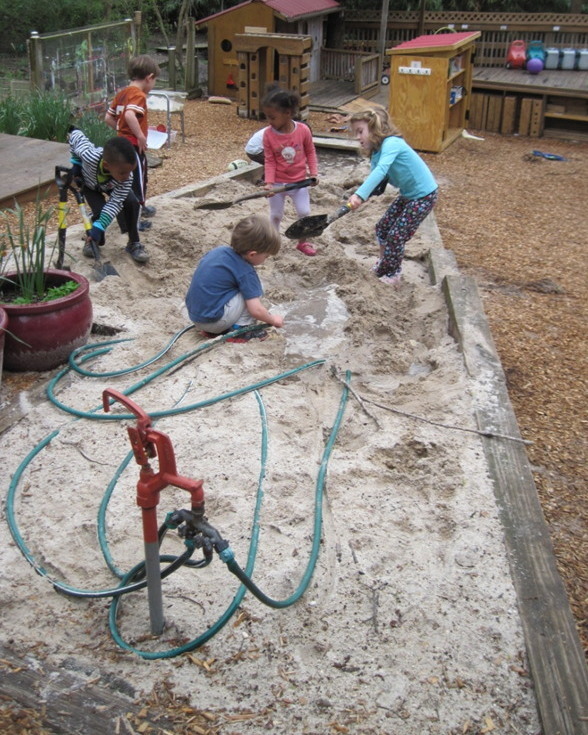 The Sand River—a large sloped area bounded by timbers, heaped with sand, and equipped with a water source at the top that feeds multiple hoses. 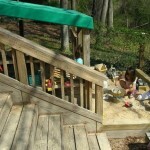 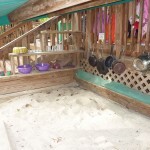 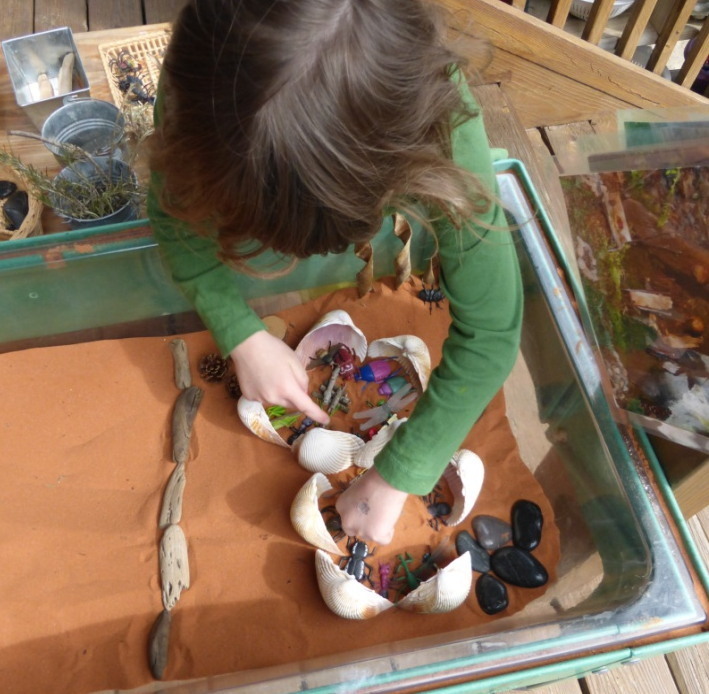 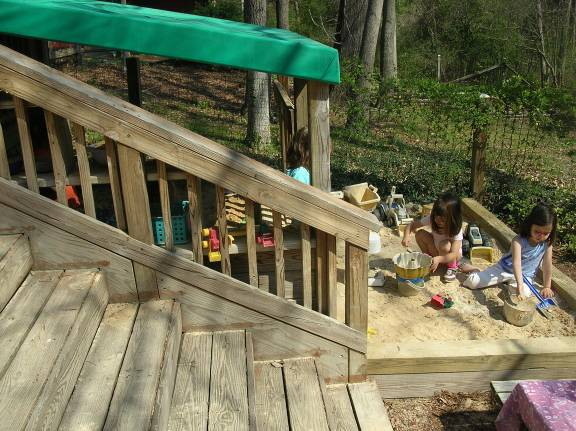 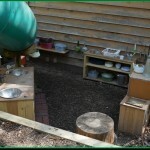 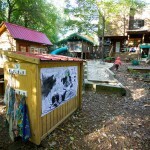 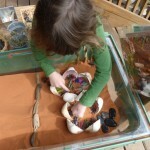 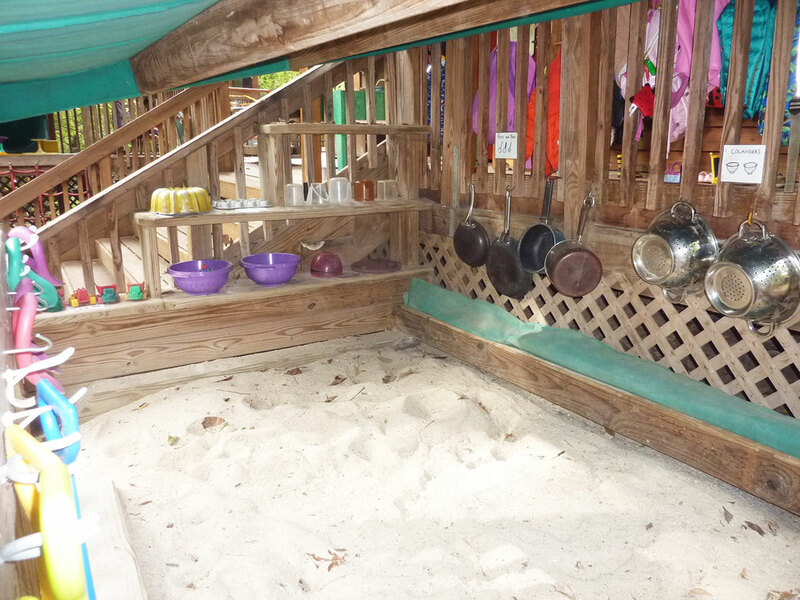 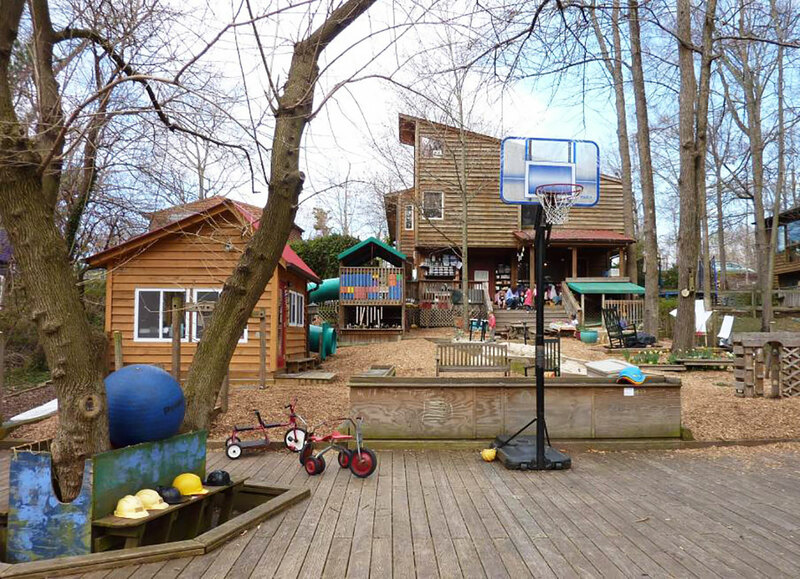 The Sandbox—partially covered, with lots of props for digging and pretend cooking. 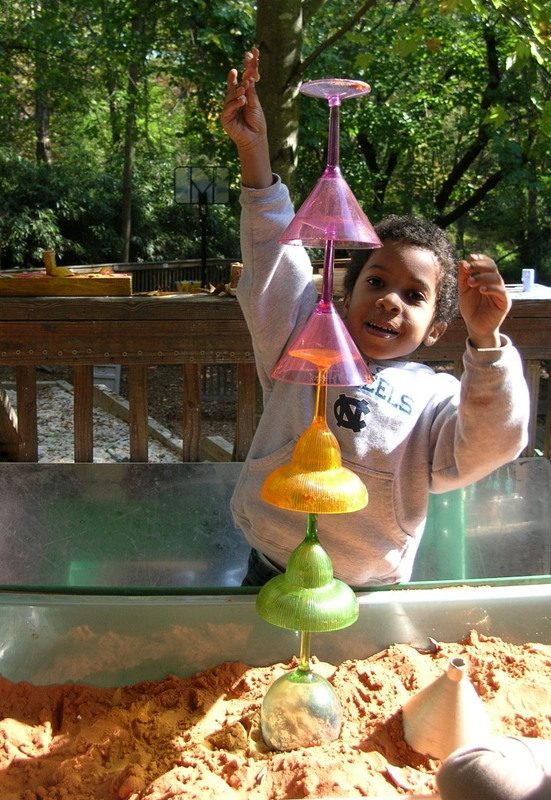 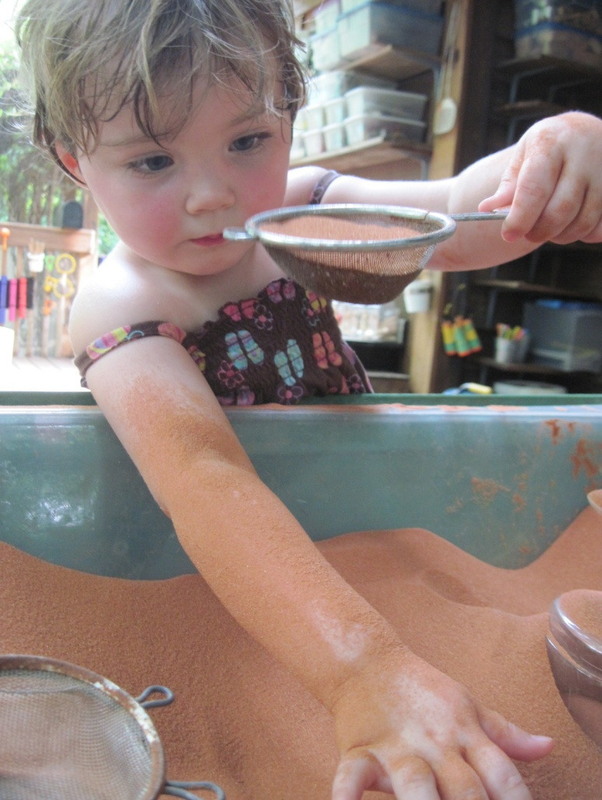 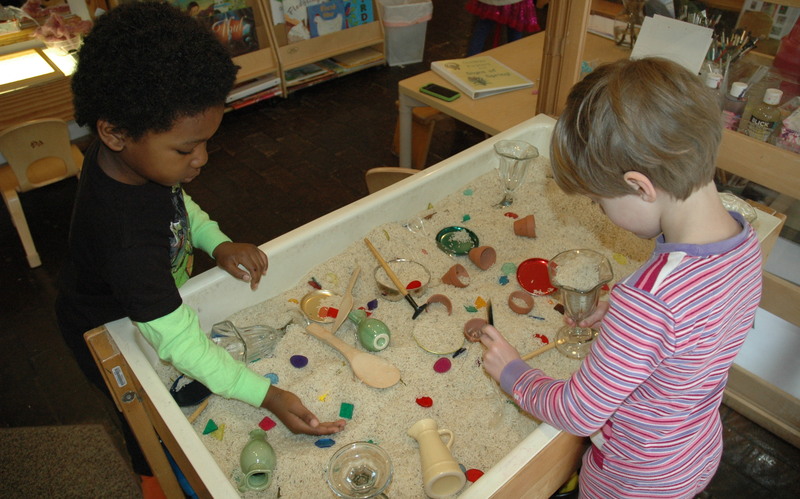 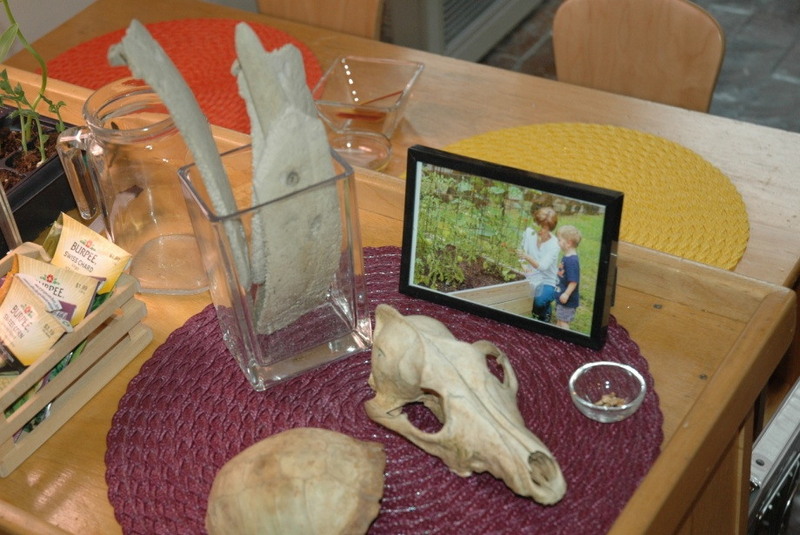 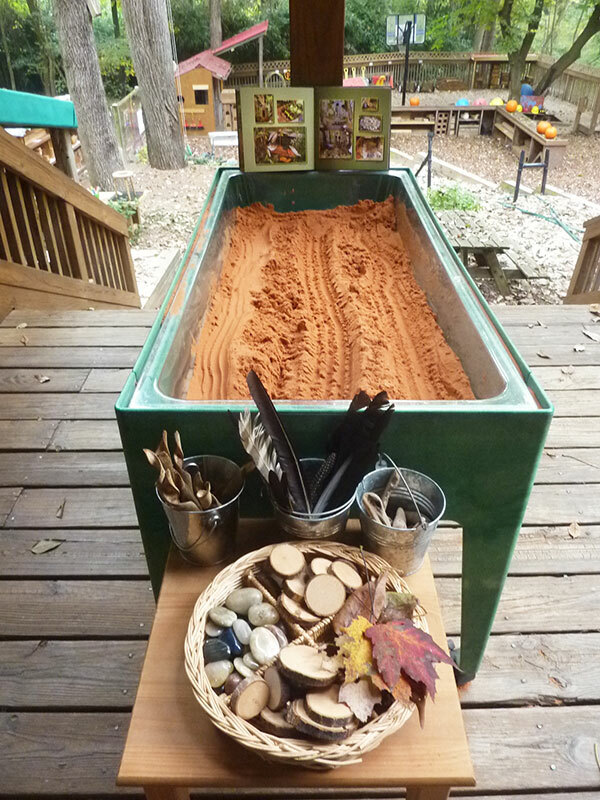 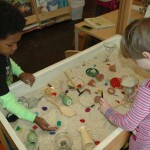 Sand Tables –—one with silky red sand and another with white modeling sand. 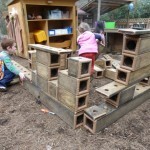 The Block Platform—for unit block building. 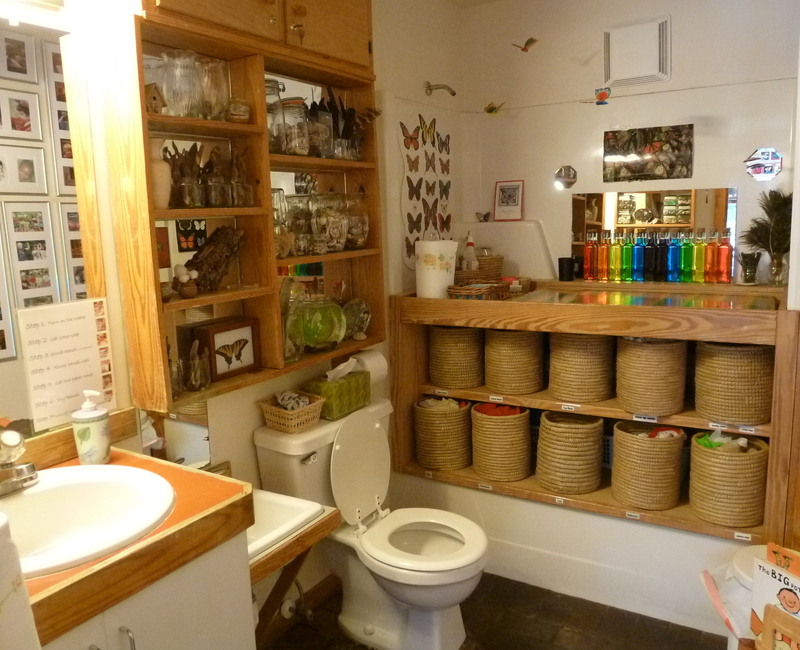 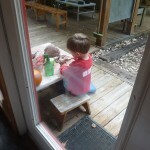 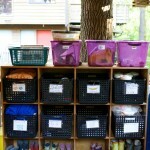 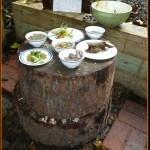 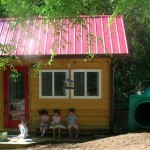 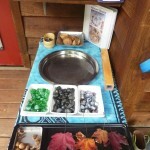 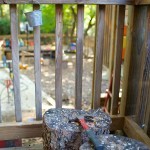 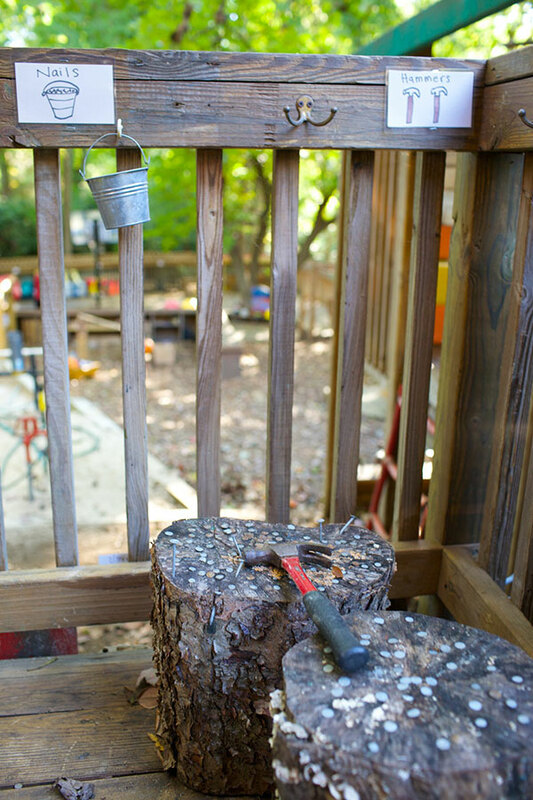 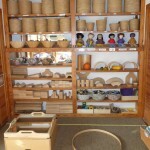 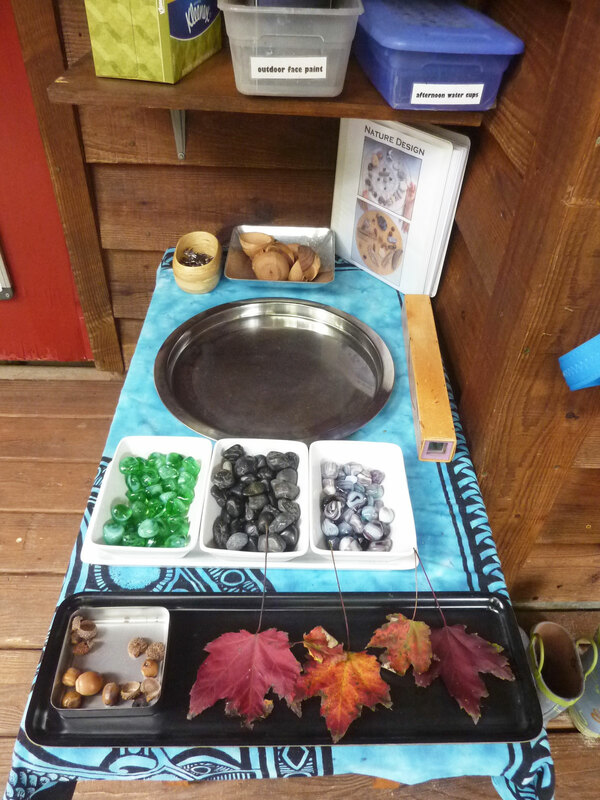 The Pretending Shed—housing loose parts for outdoor pretend play. 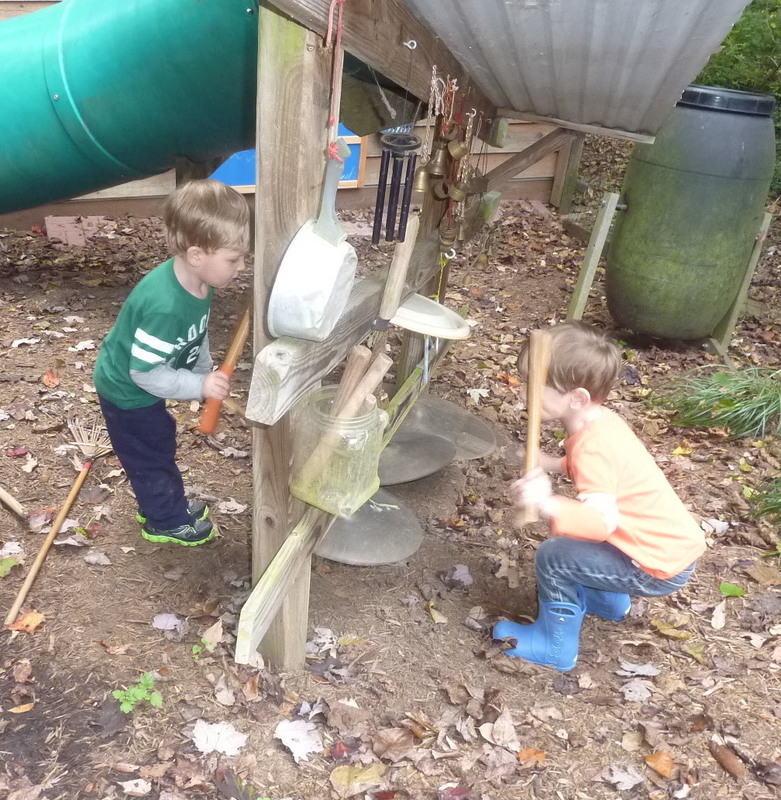 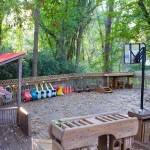 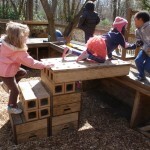 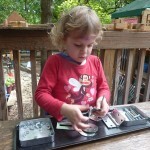 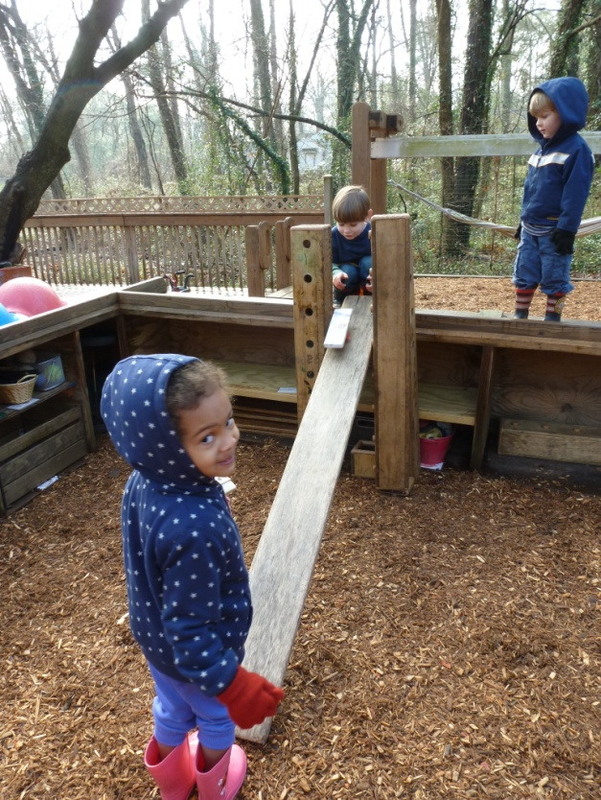 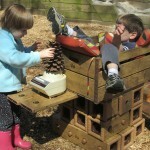 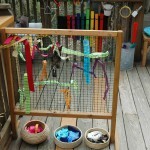 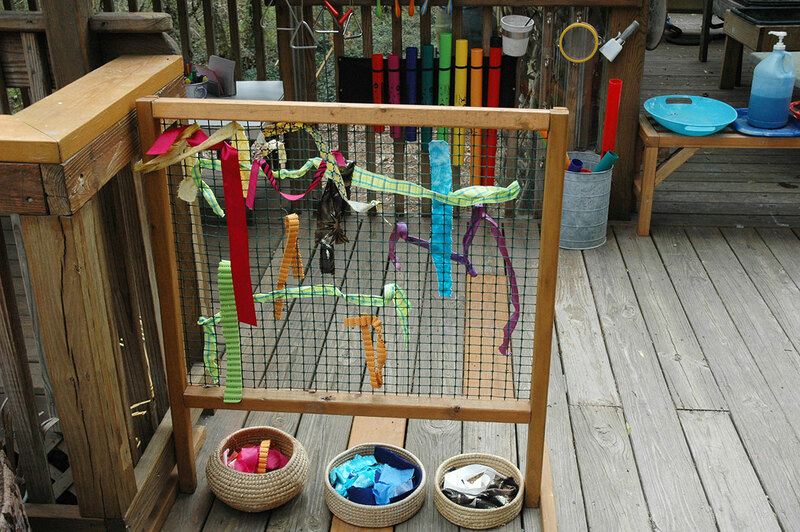 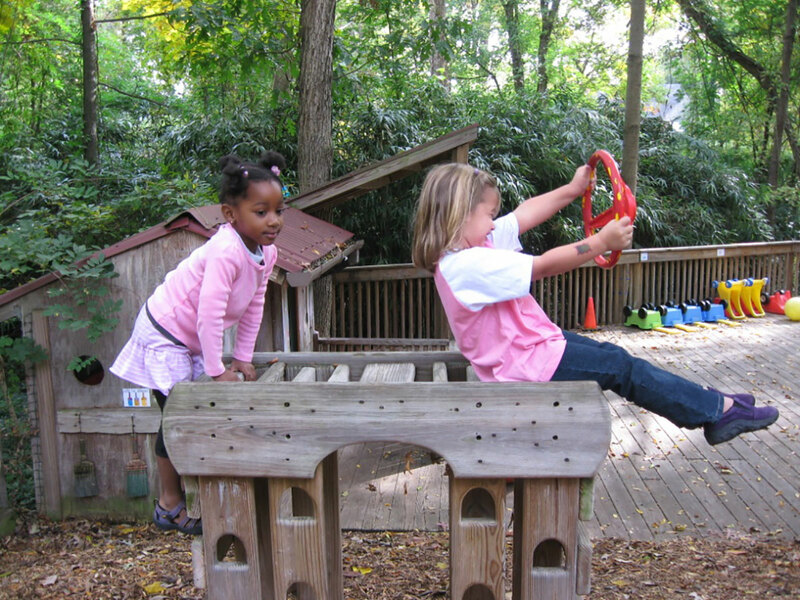 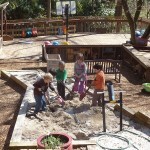 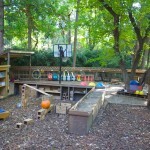 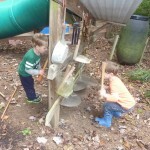 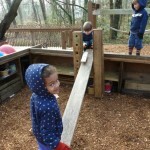 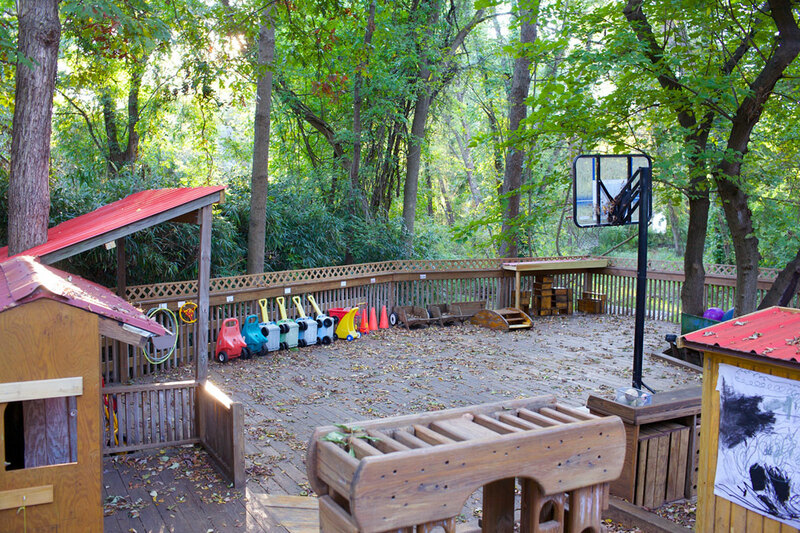 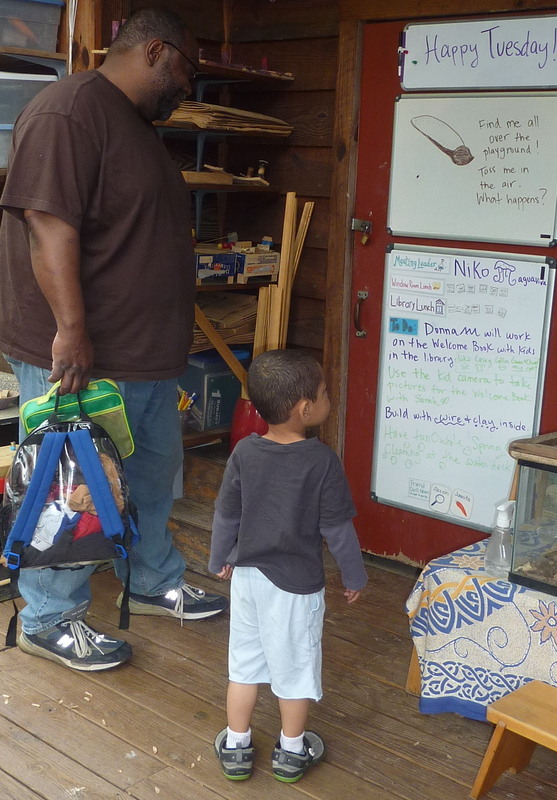 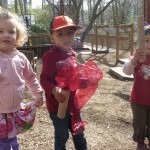 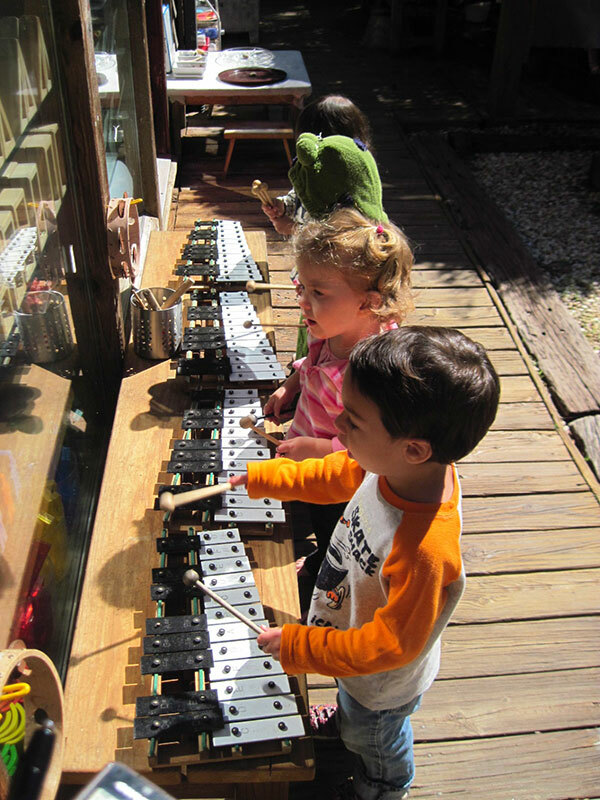 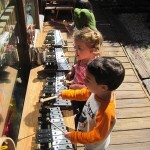 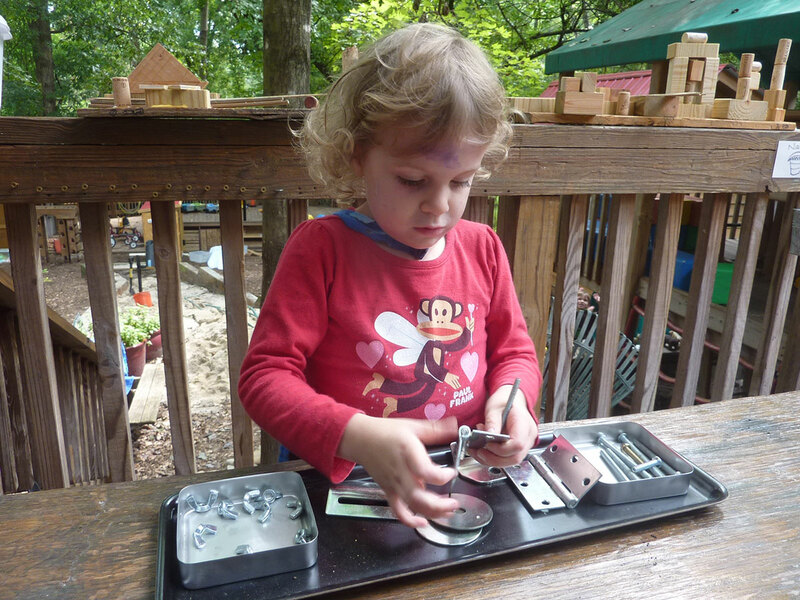 Sound-makers and musical instruments—in multiple places around the playground. 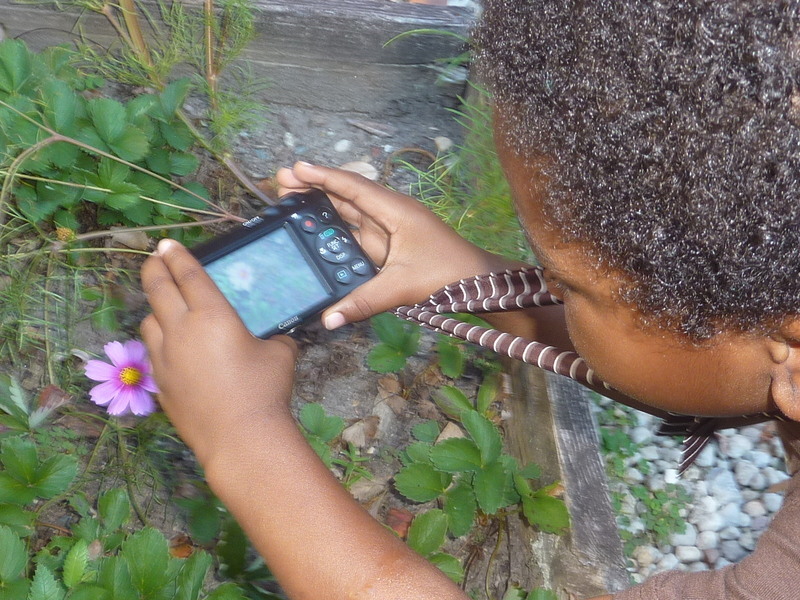 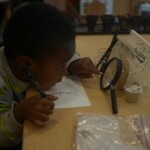 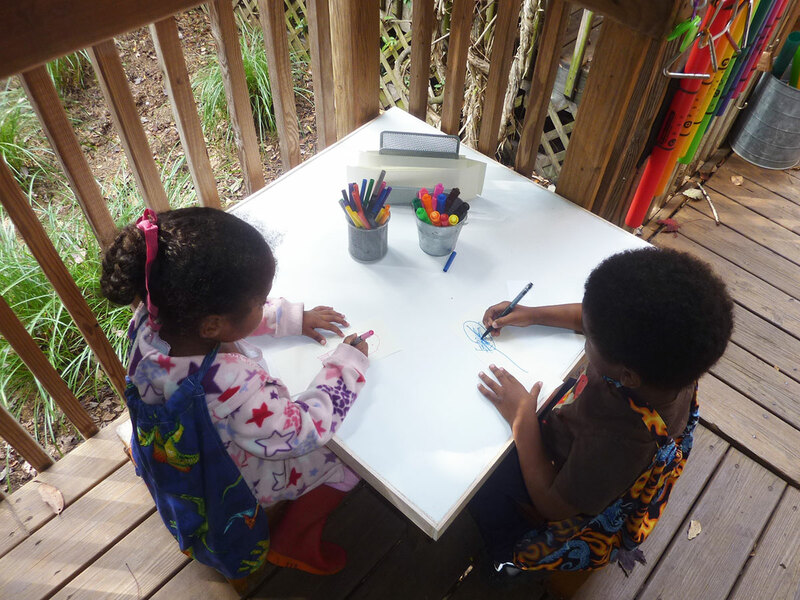 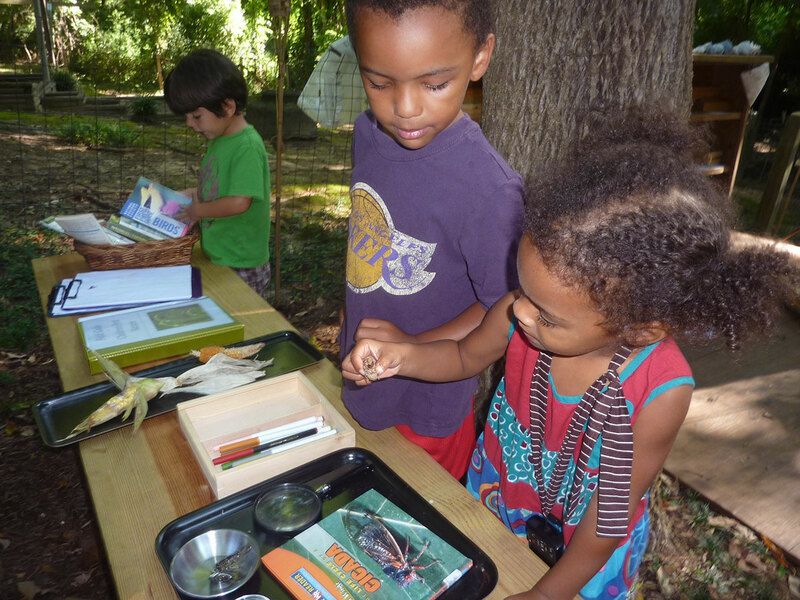 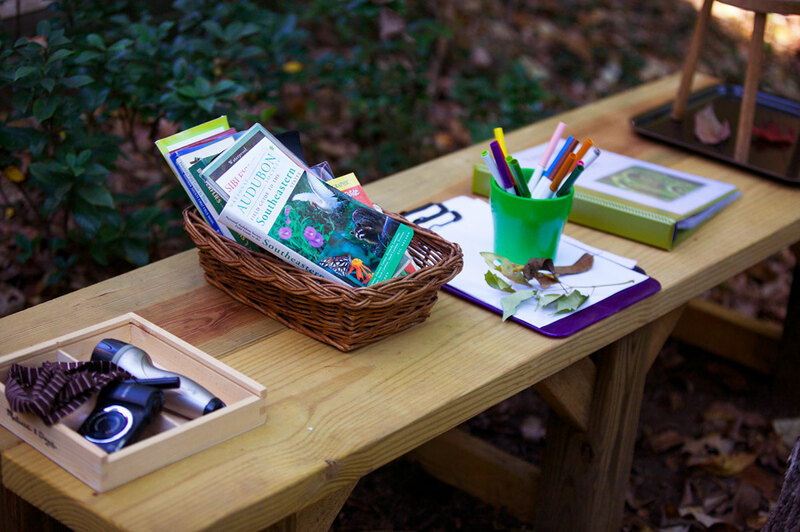 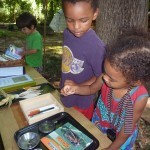 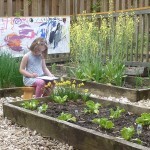 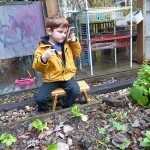 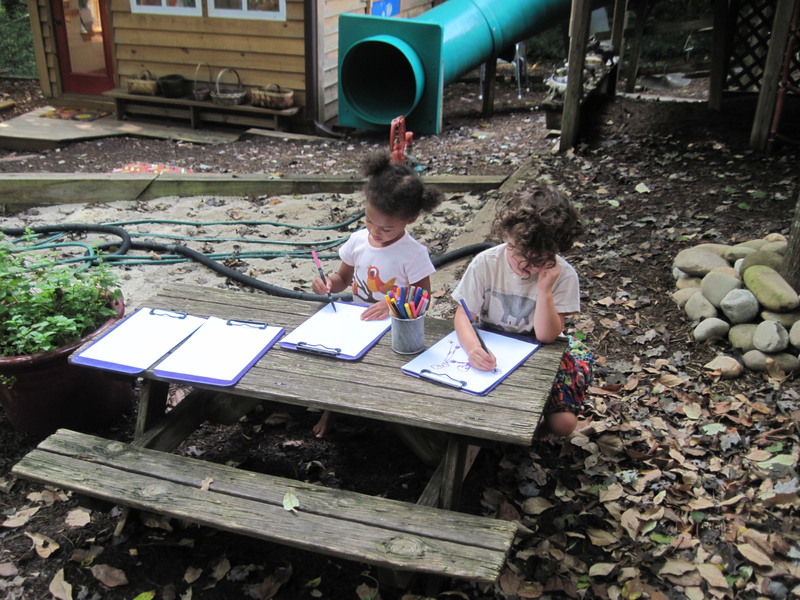 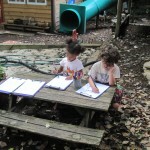 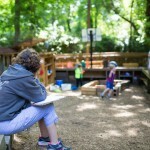 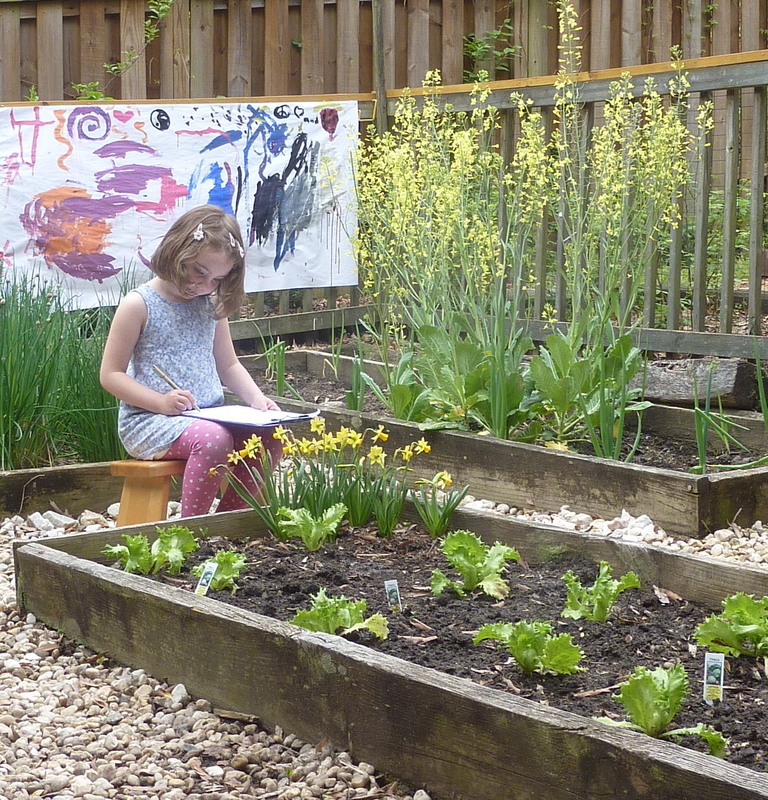 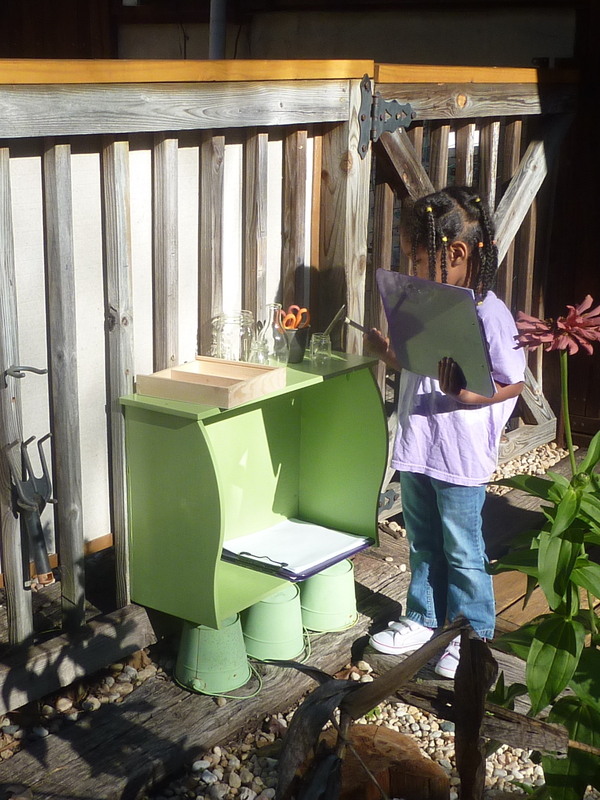 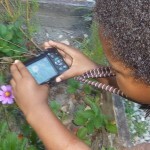 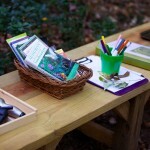 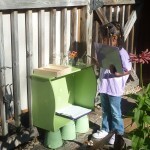 Nature Study Bench—with field guides, a kid camera, and magnifiers for studying playground plants and animals. 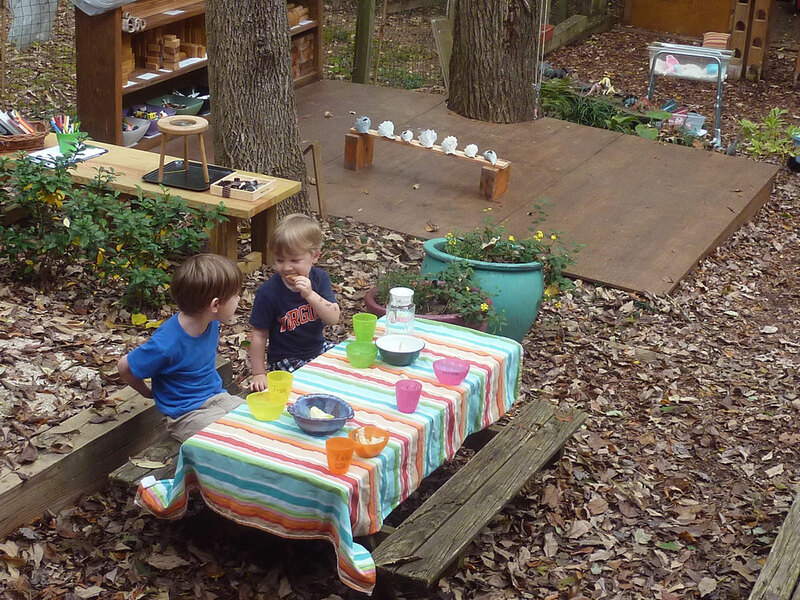 Picnic tables—for eating snack and sometimes lunch. 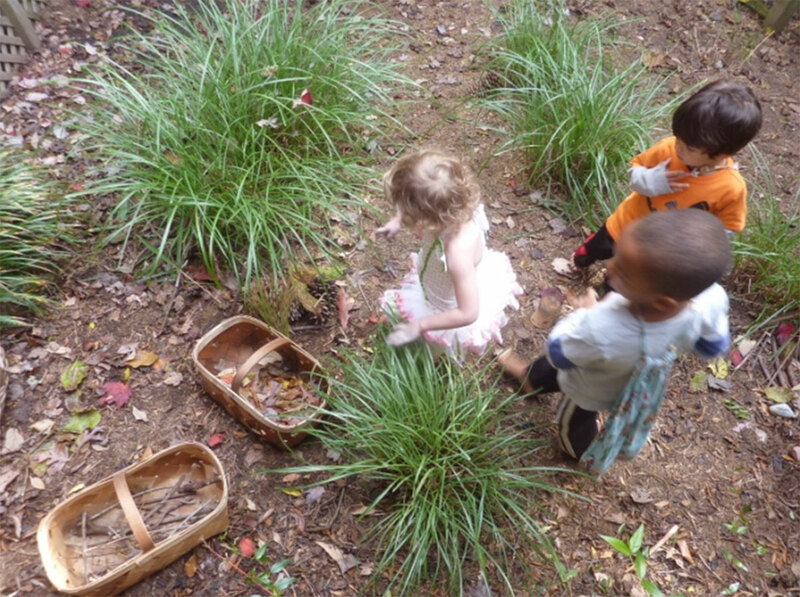 The Fairy Garden—where large grasses create hiding and pretending places. 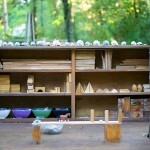 Tables—for carpentry, drawing, clay, nature design and wood sculpture. 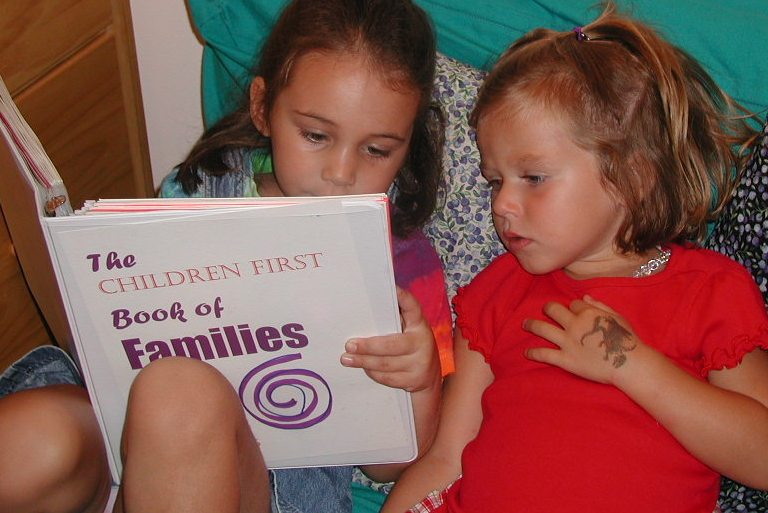 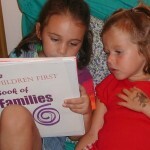 Children First is one of the programs featured in both editions of the book Designs for Living and Learning by Margie Carter and Deb Curtis. 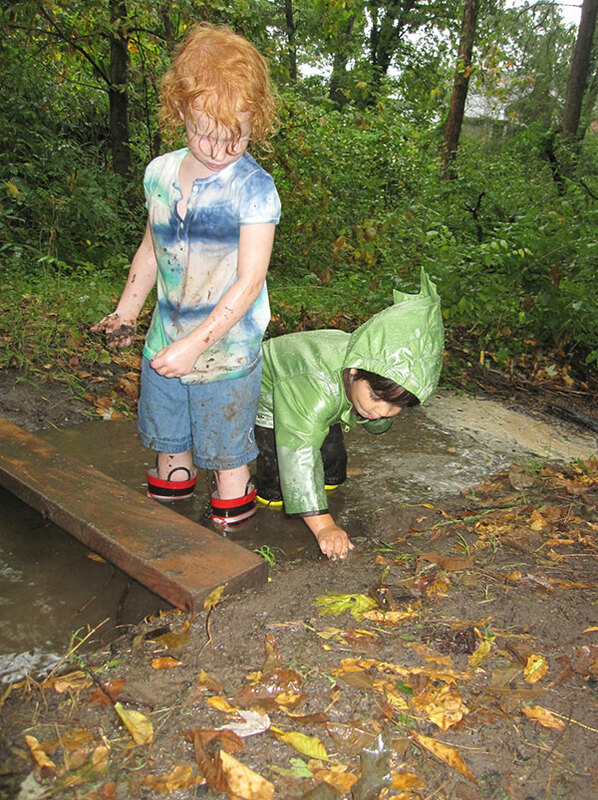 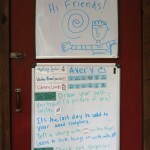 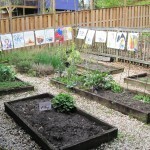 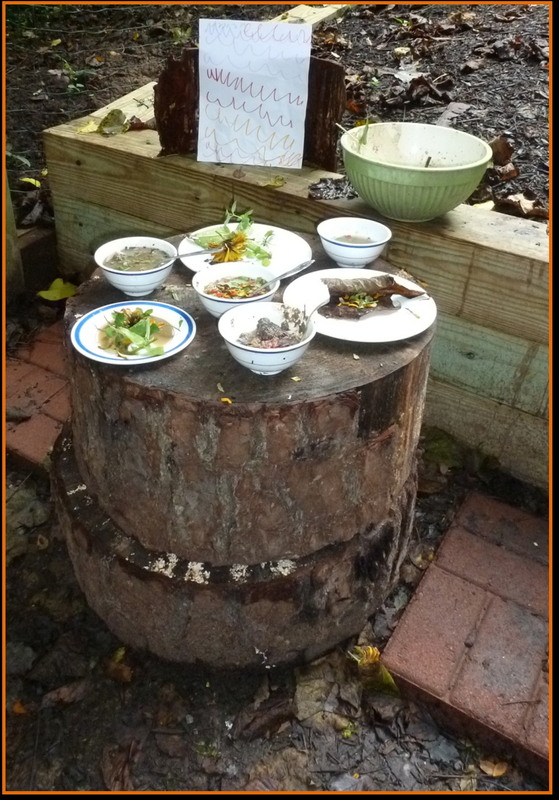 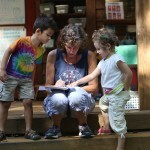 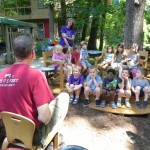 We were a primary research site for Wendy Banning and Ginny Sullivan’s book Lens on Outdoor Learning. 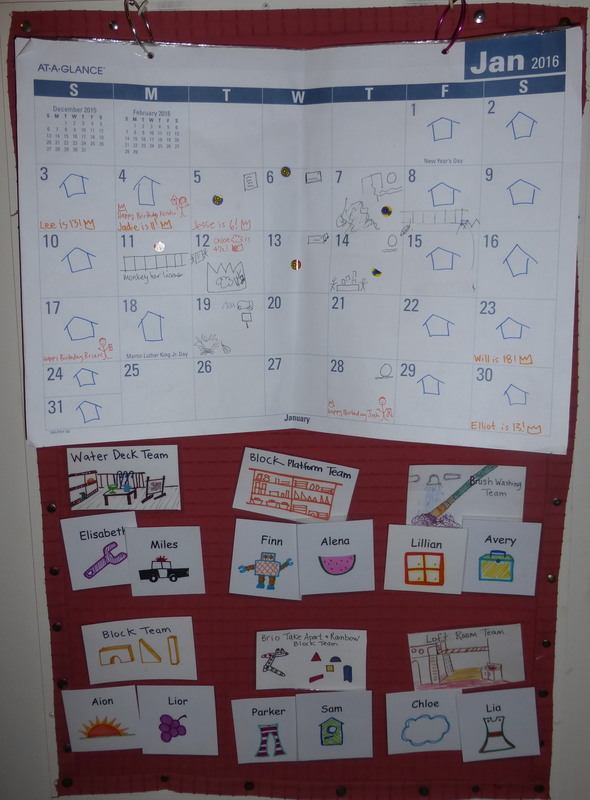 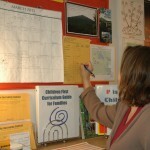 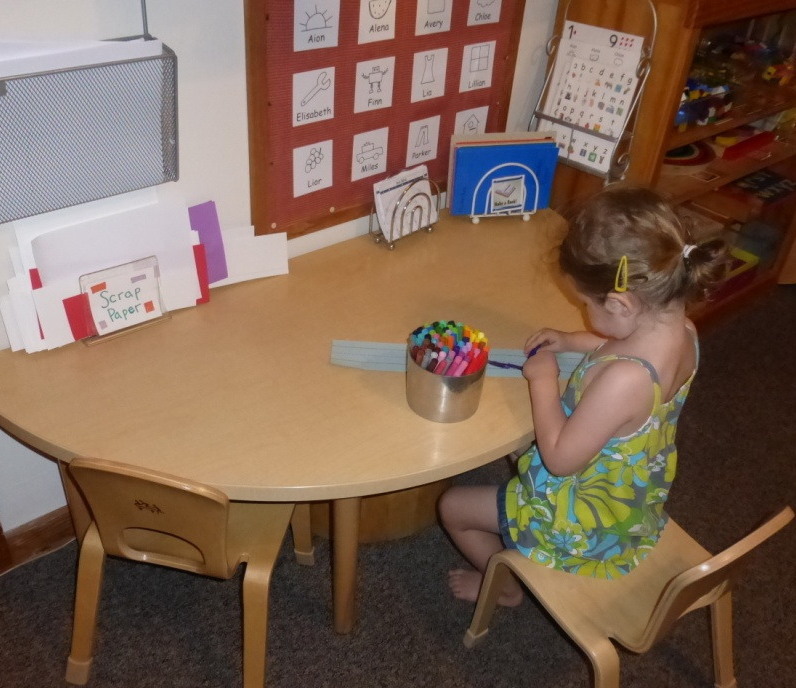 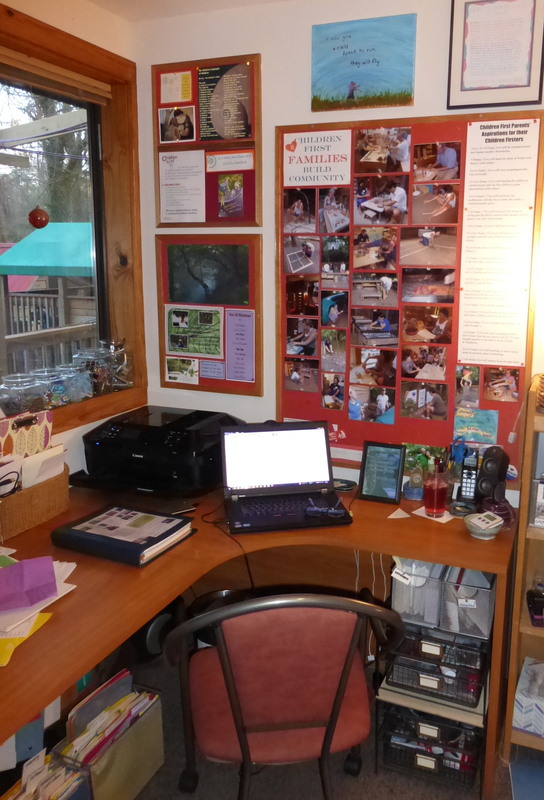 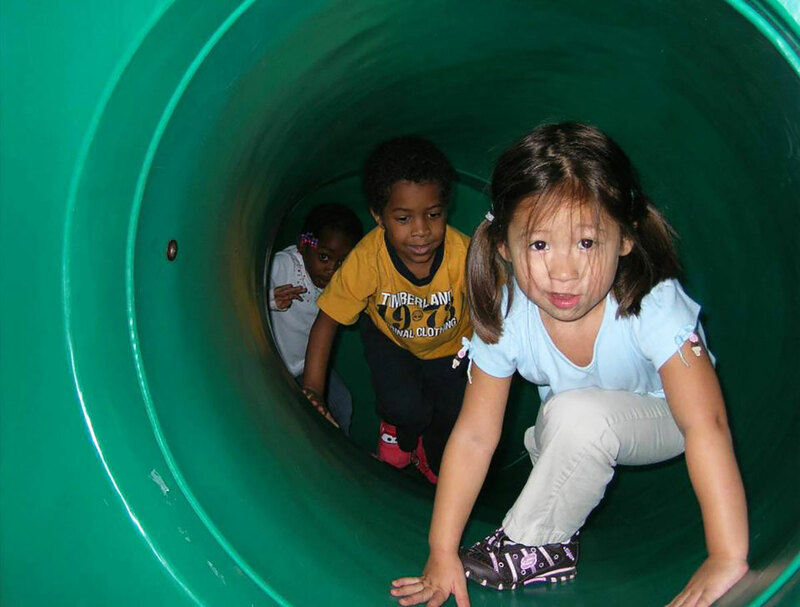 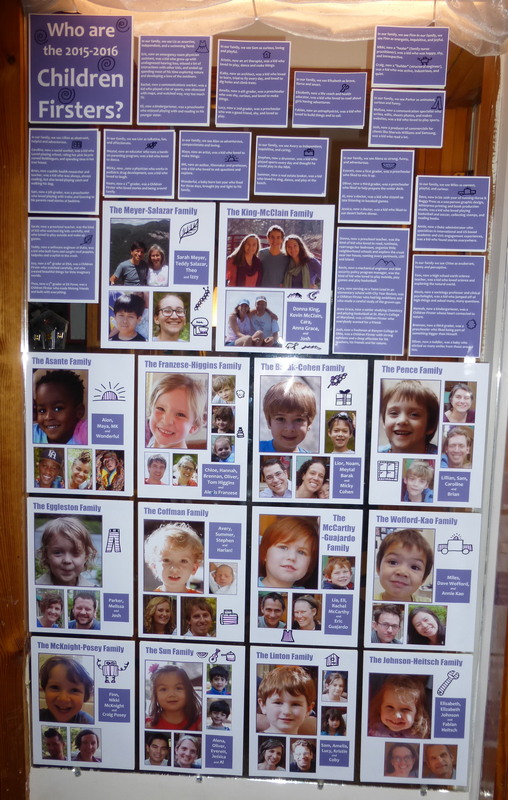 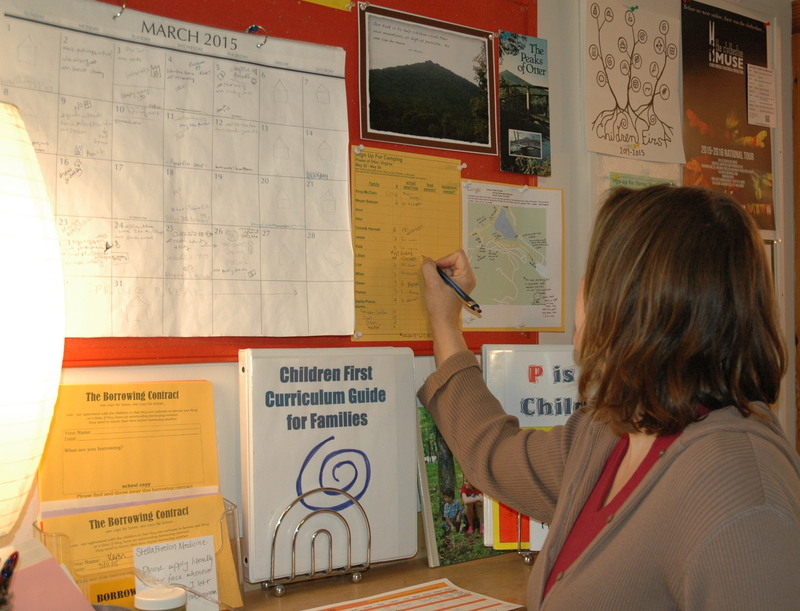 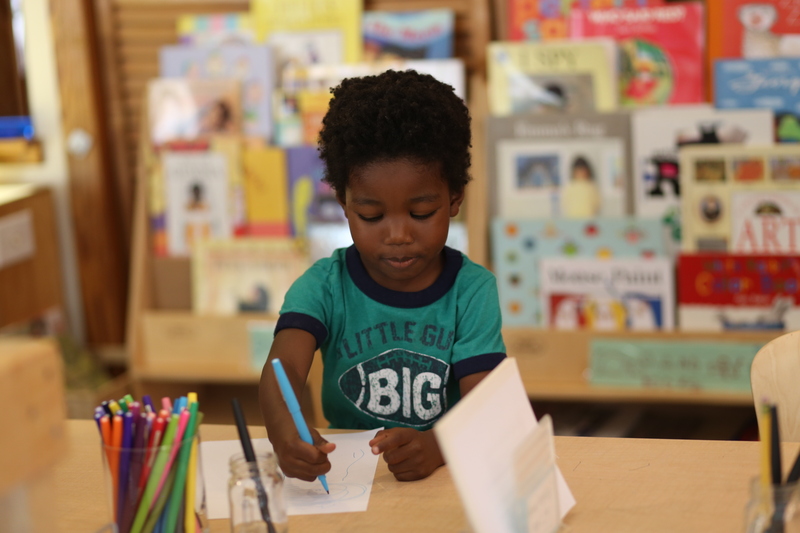 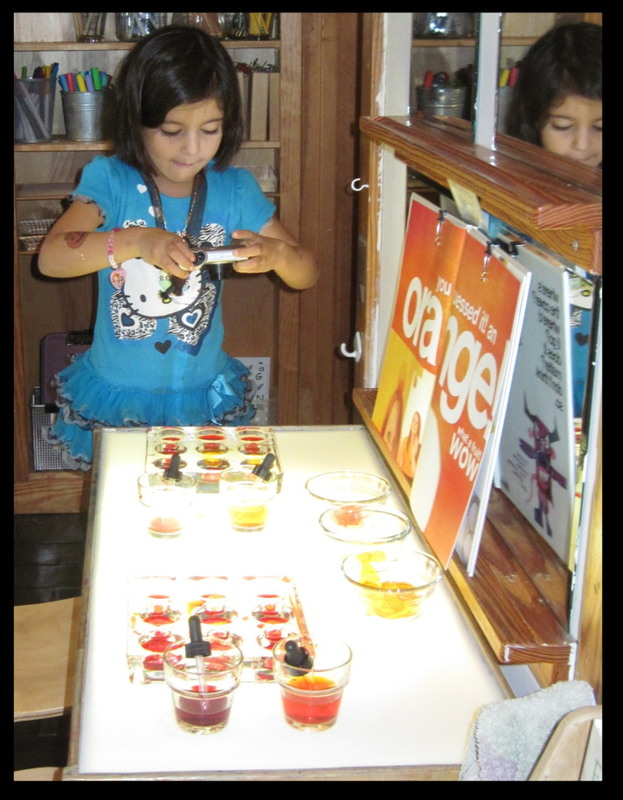 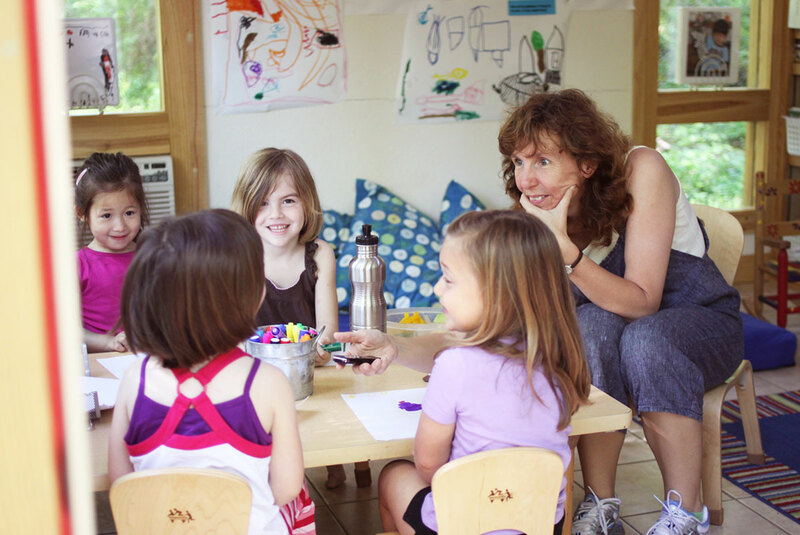 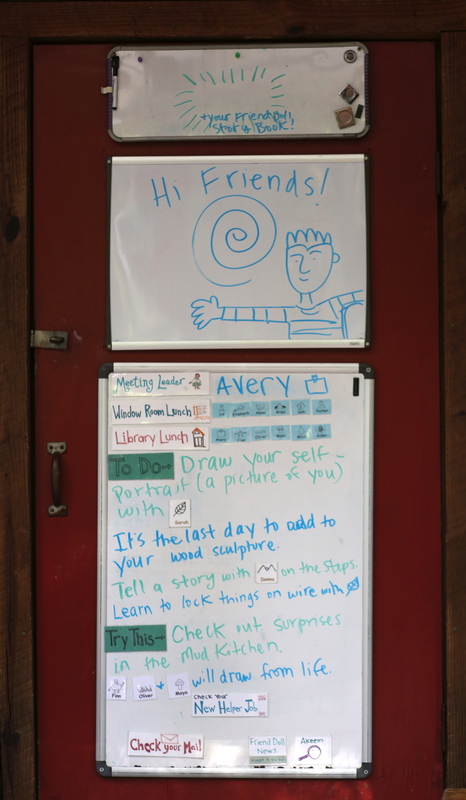 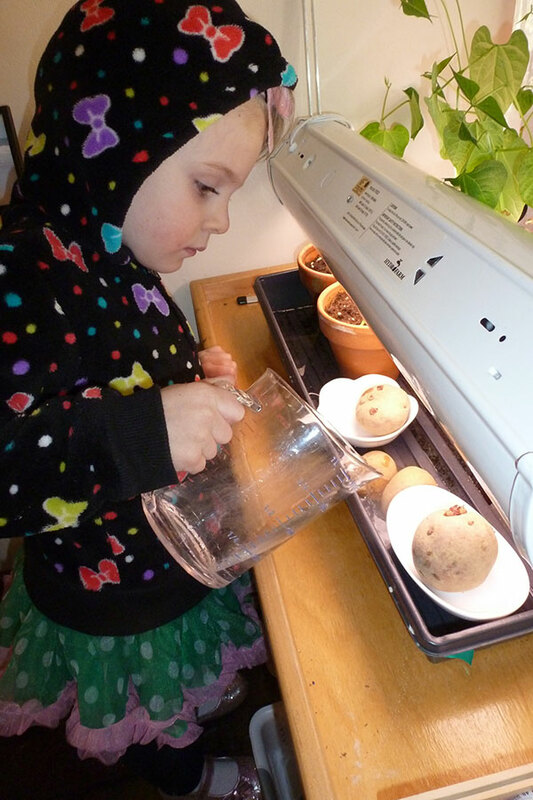 In May 2005 and again in May 2014, the journals of the National Association for the Education of Young Children featured our program in articles about learning environments.